Just for Fun: Come to Math Class Dressed Like a Genius! 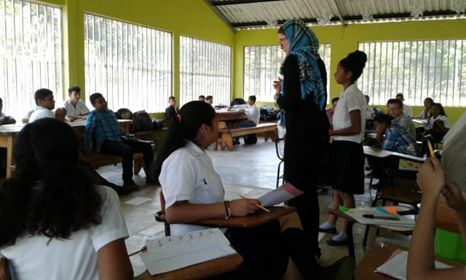 This is currently my third year of designing and teaching a dynamic math/logic class in the small high school we operate out of our rural ministry homestead on the northern coast of Honduras. For these past several weeks my students and I have been thoroughly enjoying a small book called “The Moscow Puzzles” that includes various real-life math and logic problems. 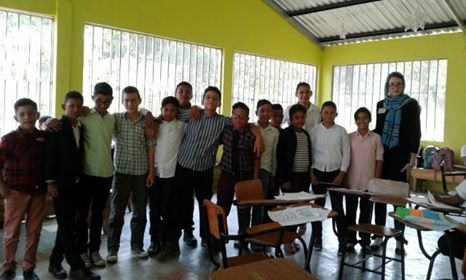 For a recent exam, I announced that each student who desired could come dressed as a genius or professional mathematician, which is a big deal considering all students normally come in their white- and navy blue uniform everyday. Some kids got very creative with this and came in borrowed glasses, bowties and professional attire while I, too, got in on the fun and dressed as the very serious supposed Russian author of the logic book we’ve been studying. 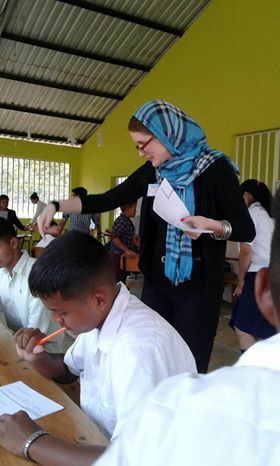 (I gave myself the made-up name Professor Ivanka Zolushka Popovski Romanov, had a thick Russian accent throughout the class and would only answer the kids’ questions if they called me by my full Russian name). Enjoy the pictures! God bless you. These were the male and female winners of the costume competition! 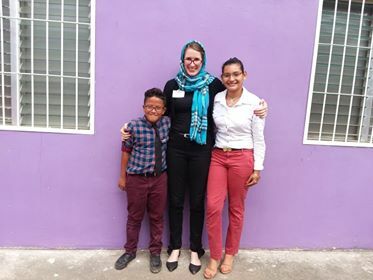 (One of our foster daughters dressed as a “NASA Supervisor” and even made a name badge to go along with her attire, and the young man in the photo is one of our new students this year who dressed as a young businessman.) Too cute! Who knew taking a math exam could be so fun? A very strange thing has happened here. 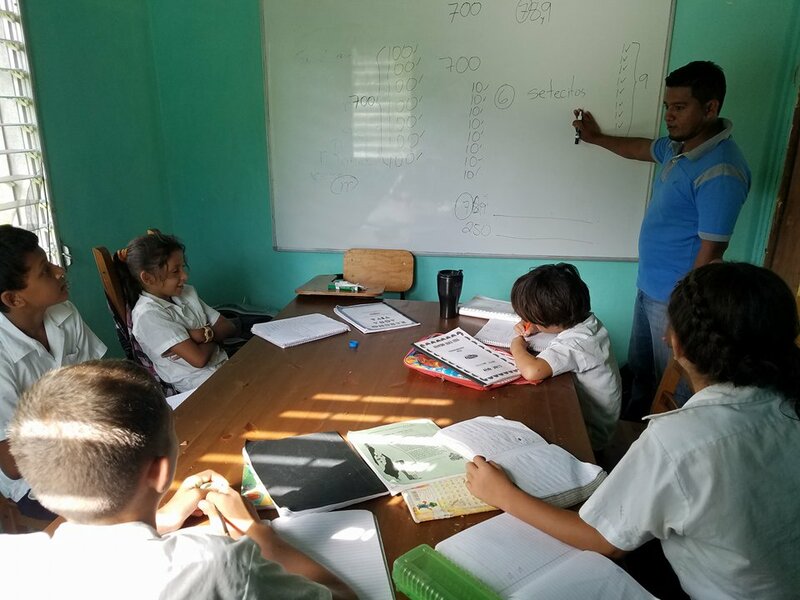 The tiny school we originally started out of our own home five years ago as a loving, Christ-centered outreach for local vagabonds and at-risk kids now includes a student population we never intended to serve: stable, bright middle-class students. What was originally intended to be a rescue shop within a yard of hell for those on the farthest margins of society has been largely rejected by that population and embraced by another. Yes, we still have a few rag-tag ex-vagabonds and rogue teens among our group of students this year (and many who have been abandoned by their mothers who left them to chase the American Dream), but we’ve been utterly surprised to receive new, stable families into our program who are not looking for a last-ditch rescue effort for troubled youth but rather a legitimate Christian school (and a dynamic extended family and discipleship program) for their growing children. 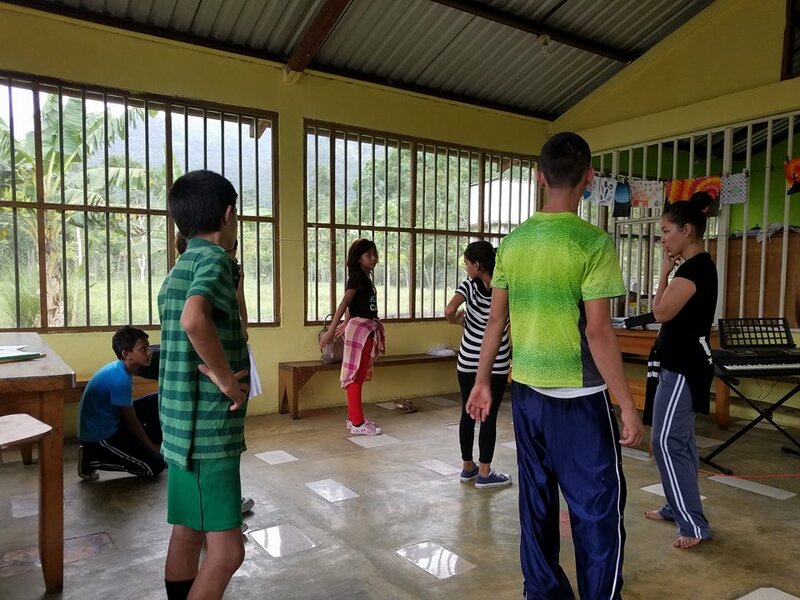 Our priority over these first several years of relational ministry in rural Honduras has been the least and the lost — those who are on the verge of entering gangs, those who have been overlooked by society and possibly not given a fair shot, those who have never stepped foot in a church building. Through many efforts, sincere friendships, prayers and tears, however, the majority of those whom we hoped to serve have opted out of a relationship with us (and opportunities to get an education, heal from their past, acquire life skills and learn to walk with Christ) in favor of a continued life of ease and sin on the streets. This has been bewildering, frustrating and devastating for my husband and I. As the majority have now chosen the path of least resistance, we have been left seriously wondering if we should have prayed harder or done something differently in order to reach these teens in a more effective way. The most logical answer we come to is that they are simply people with God-given free will who have decided to use that free will in a way that does not glorify God. 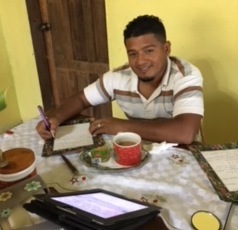 My husband Darwin even made resumes and secured healthy employment for several of our local teens over the Christmas holidays in order to keep them busy/focused so that they would not fall astray (and because the majority of them say that they really want to be able to make an income). 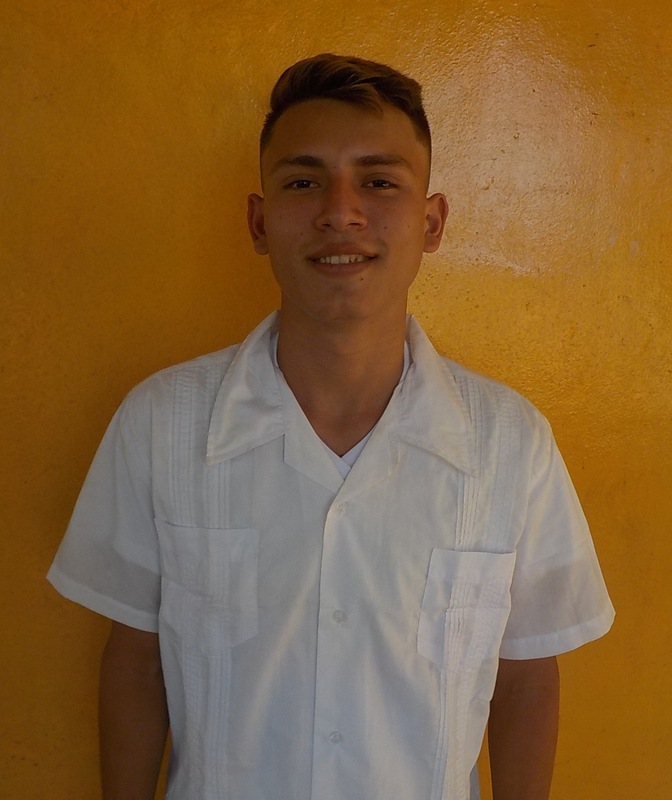 Darwin spoke with the manager of a local clothing store in order to get a job for one of our beloved teen boys, and Darwin spent several hours going around town with the young man buying the clothes he would need for his daily work uniform. The young man only showed up for the first day of work and then decided not to go back because it was ‘too hard’ being on his feet so many hours. Over the December-January holidays Darwin organized outings to go fishing with these local teen boys (many of whom come from broken homes), watch Christian movies with them, visit their homes, counsel and pray with their parents, etc. We opened up the door for some of them to come live with us in order to escape unhealthy home situations, which several turned down. After great sacrifices on Darwin’s part (on many days he spent more time with the teen boys than he did with me and our 7 foster kids), all but a small handful have since turned their backs on us and have dropped out of our school in favor of doing absolutely nothing at all in this current season of their lives. 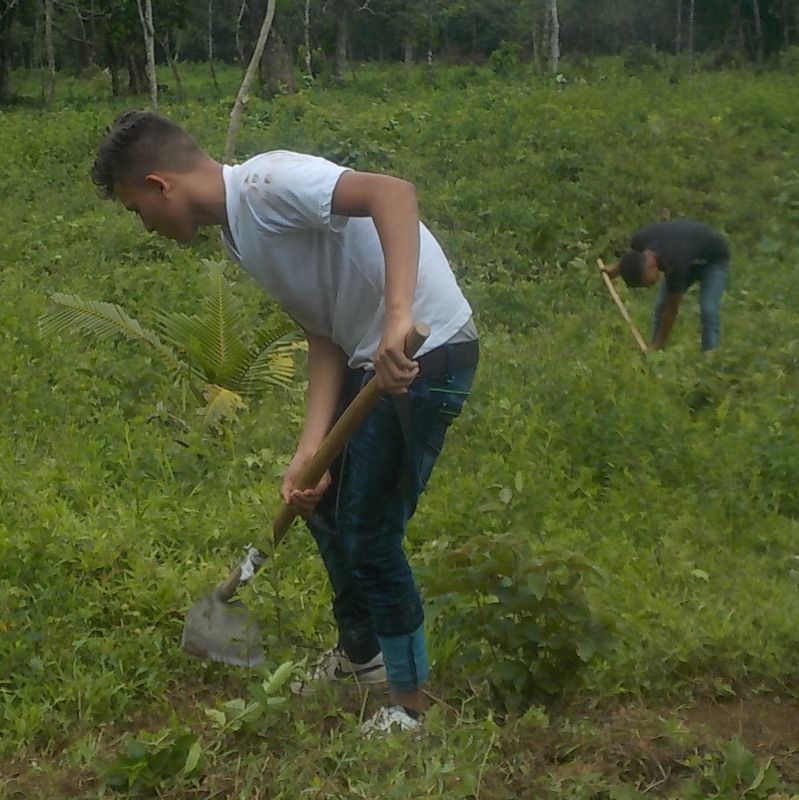 We’ve even offered agriculture jobs on our rural property to these same local young men in order to provide them an honest income doing productive work, and all but two have turned down the offer to work without any real reason. I share this with you not to judge these youth or complain about our experiences with them, but rather to openly share some of the confusing and very turbulent emotions we’ve gone through over these past several weeks as we’ve been confronted with the reality that many of those whom we love dearly and earnestly want to shepherd in the Lord are simply unwilling. Many people ask God to grant them a heart for the lost — love for humanity, to see people the way God sees them. Our experience is that the painful blessing in holding this God-given perspective is that there is much heartbreak in store as many of those whom you grow to love end up making decisions that lead to their own destruction and alienation from the Lord. This is perhaps part of the sorrow that Christ knew so well. Thus, our new motto (however unfamiliar it still feels on our lips) is: We want to work with youth who want to be worked with. The season has now passed of us dropping everything in order to look for those who’ve run off and try to convince them time and again to do what is best for them (even against their own will): live for God, prepare for the future, live an honest life, etc. 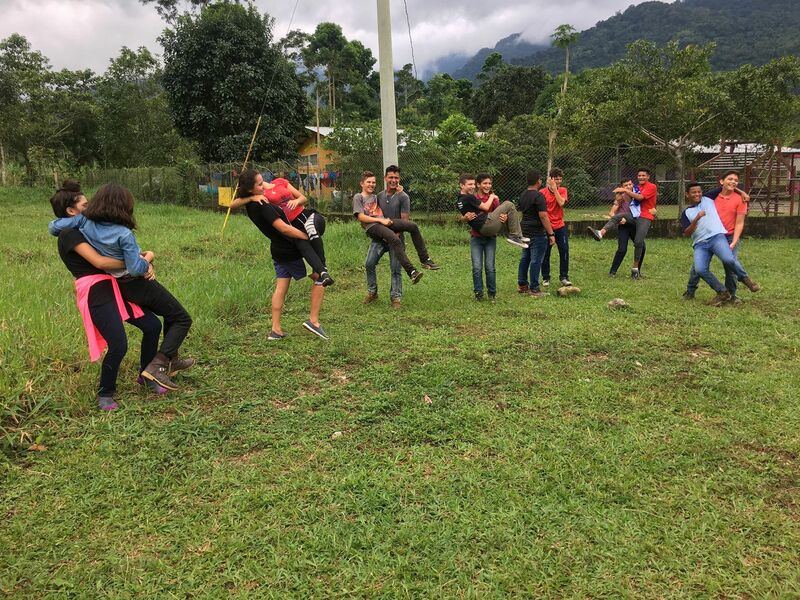 We have effectively let go (both physically and emotionally, which is much harder) of these teens and are now entering a new year and season of working with eager, young lives who really want what we are offering and whose parents are on-board with the nitty-gritty discipleship and formation process. 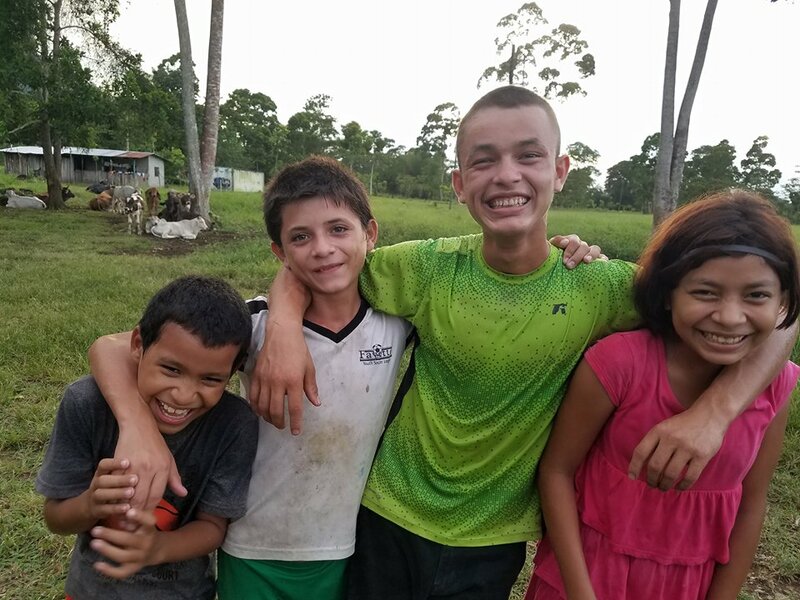 I would also like to share a new missions/global perspective with you based on our experience, however hard it may be to believe: some people are materially poor, uneducated and/or far from God not because they were offered no opportunities or because no one has shared the gospel with them, but rather because — even after being pled to work, get an education or seek the Lord — they refused. This is hard to swallow and sounds very harsh, but this is the reality we come up against time and again (and we are not alone in this; many local pastors and missionaries have the same experience). Also: many people believe that youth join gangs because they are looking for love/acceptance. This might be true in many cases, but I no longer believe it to be true in all. In our experience we have offered a very genuine, vibrant love and acceptance into a healthy, biblical community to many youth, and they are simply not interested (mainly because it is ‘too hard’). Will they now turn to gangs or anti-social groups looking for a sense of belonging? We have no way of knowing; time will tell, but we can know for sure that if they do so it is not because they have known no love or have experienced only rejection in their lives, thus turning to the gangs as a last resort. They were given open doors and pled to walk through them, but they ran away from the love that was being offered them. 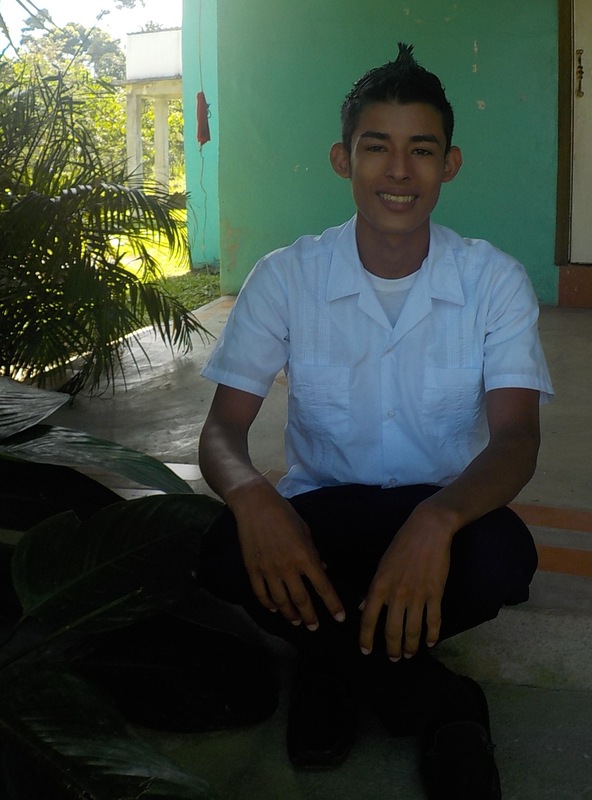 A couple weeks ago Darwin and I had a heart-to-heart talk with one of our favorite teen boys who had been in school with us for the past two years. We sat on little wooden stools in our empty, quiet dining room on a Sunday afternoon. We listened to his home struggles, tried to give him biblical advice as far as he would listen, affirmed our love of him, and at the end prayed for him through tears. We had offered to employ him and even help his family with food donations if only he would remain in relationship with us through his daily participation at the Living Waters Ranch (which, after all, is not for our benefit but rather his). At the end of the entire encounter — which lasted over an hour — I asked him if we could embrace him, which is a physical boundary I do not typically cross with our male students. He nodded yes, and my husband and I tightly held his 16-year-old body between us for several minutes as all of us fought off tears. 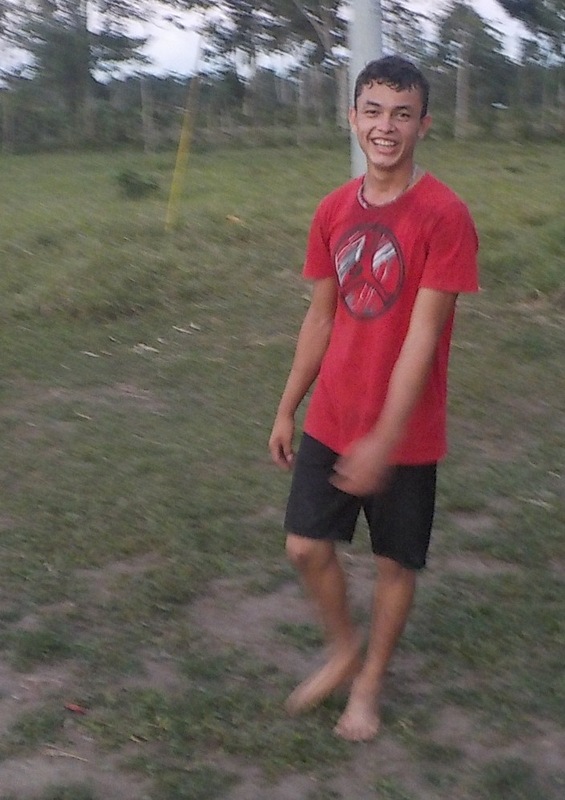 Even after such an experience, the young man decided to drop out of our school/discipleship program and can now be spotted wandering the streets of our rural neighborhood, as he is now neither working nor going to school. 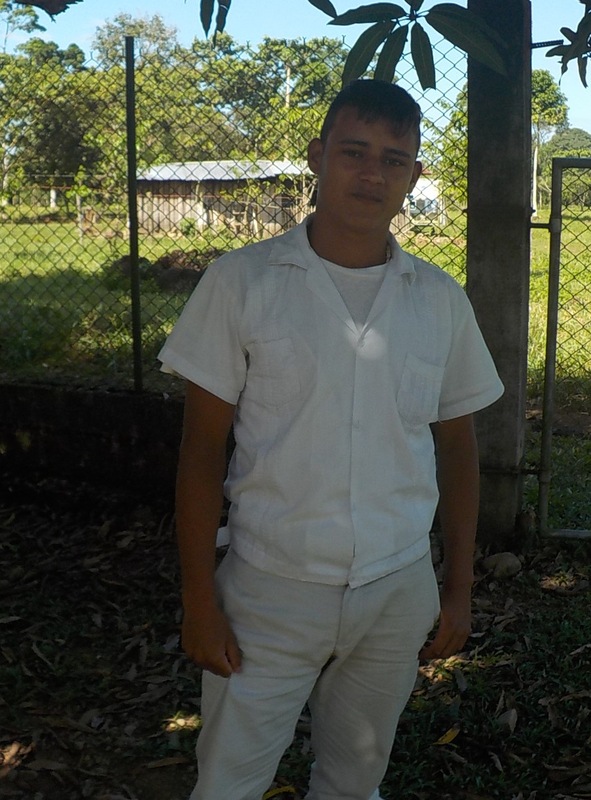 His dad is in the process of leaving illegally for the States with one of his younger brothers even after Darwin tried on several occasions to convince the dad to stay. These types of loss — and we have over a dozen other similar stories — leave us with an aching void in our chest but at the same time we know there is nothing else we can do beyond open the door, share the good news of Christ, participate in an honest and loving relationship with the person, extend opportunities and give wise counsel. If the person refuses, we can only watch them go, even knowing the likely myriad of consequences they will face due to their poor decisions. So, please pray for these young lives who have unexplainably chosen to go astray, and — however strange it may sound — please pray for my husband and me, as these losses deeply affect us and are not easily forgotten. 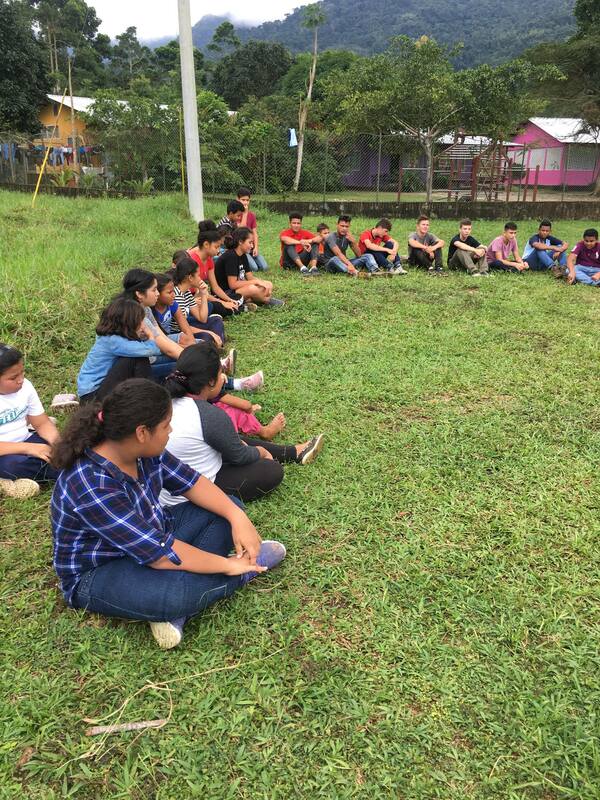 Pray that these young people might come to a genuine repentance and that they might begin to honor the Lord with their lives — whether that is in the context of a relationship with us at the Living Waters Ranch or elsewhere. 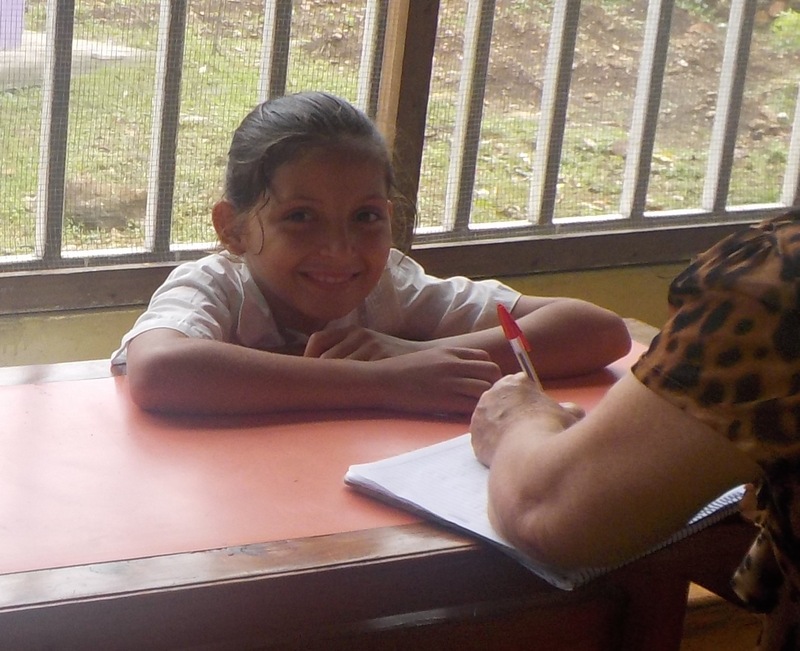 Thank you to all of you who regularly pray for this mission and support this work financially. God bless you, and please know that we do the best we can to administer our time, energies and funds in order to be effective servants, parents, teachers and missionaries for God’s glory. Below I will include some photos that were taken within the last couple weeks of our new batch of local youth who are eager to learn and grow alongside of us at the Living Waters Ranch this year. 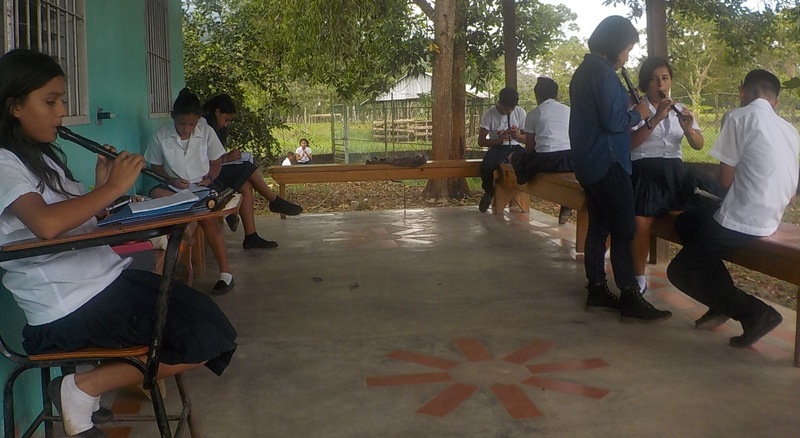 We currently have a little over 50 students, the number of which tends to flux a bit throughout the year. Among them are many children being raised by single dads, teens living with aunts or grandparents because their mothers abandoned them to go to the United States, and — as I mentioned above — some new students who come from more stable, middle-class families. Glory to God! Thank you for your prayers! Yesterday evening we sat around the wooden table in our living room to eat dinner together as a family. 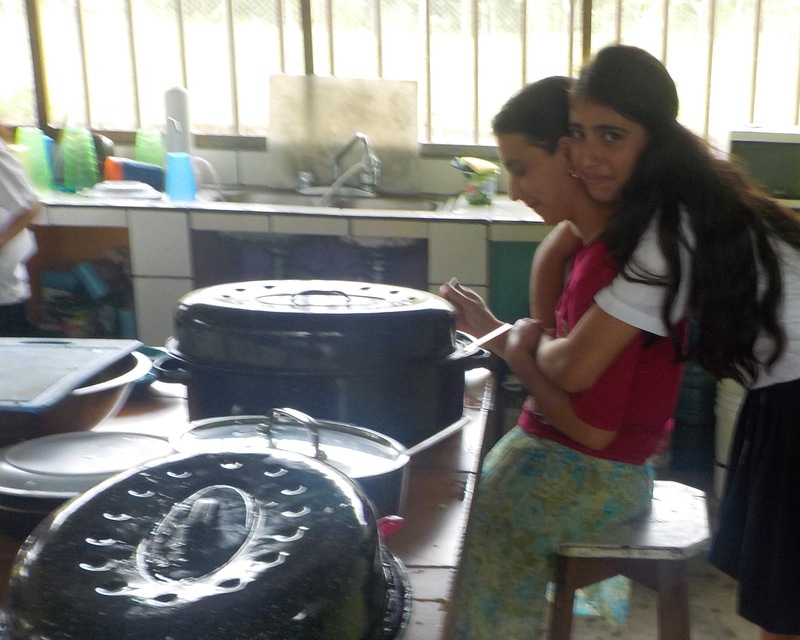 Two of our teen foster daughters had prepared a delicious chicken soup with rice. In our household our diet oftentimes consists of rice and beans, so this soup was a special treat. The plates and silverware were all laid out on our floral-print tablecloth that I had purchased at a local thrift store a couple months ago. A candle was placed in the middle of the setup, although on this occasion it remained unlit. Eating dinner together as a family each night has not been one of our strong points during these first few years together as a foster family and ministry homestead. Oftentimes it has seemed like a triumph just to get to the finish line at the end of each day still standing, and to make any additional effort to prepare an evening banquet for close to a dozen people just seems overwhelming. Thus, on many occasions each person just warms up rice and beans that were leftover from lunch or whips up something light due to everyone’s distinct schedule (and Mom’s exhaustion). Some of our kids go into town two evenings per week for their ballet class; one night a week we’re out at a neighbor’s house for a Bible study; some evenings Darwin is out counseling people in our neighborhood or organizing choir practices. 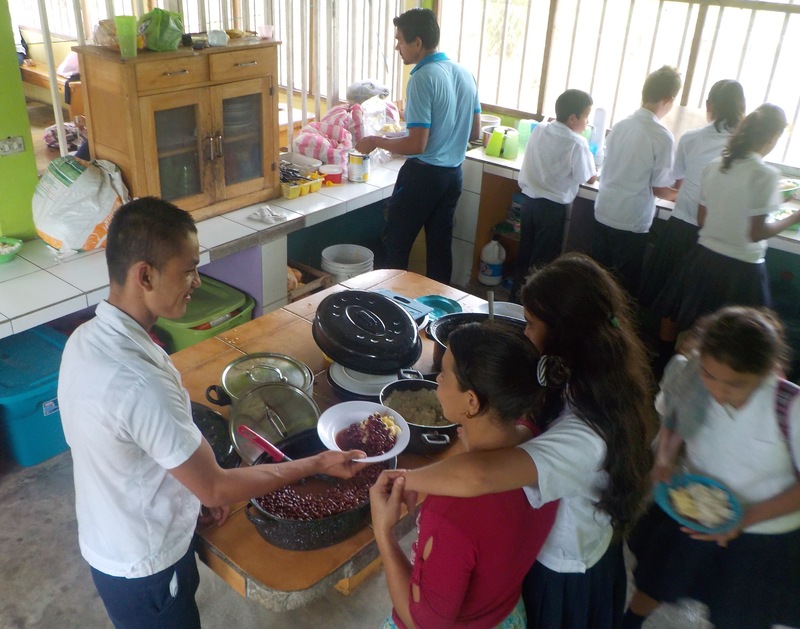 Oftentimes our teens have group homework projects or are practicing their musical instruments in the evenings, thus it has not been easy to pin down all the highly active members of our household for a daily routine of eating together. I imagine that in any family if a daily dinner is going to be achieved, it must be carefully scheduled and protected. So, that is what we’ve decided to do. At Darwin’s suggestion, on Sunday I designed a fairly simple daily dinner schedule (indicating whose turn it is to cook, as we already have a nightly cleaning schedule), and we’re committed to protect and enforce this even if fatigue or busyness threaten to put this priority on the back-burner. Yesterday morning all seven of our foster kids had been in classes and Christian discipleship in our homeschool program that we operate out of our rural homestead from 7:00am — 3:00pm. 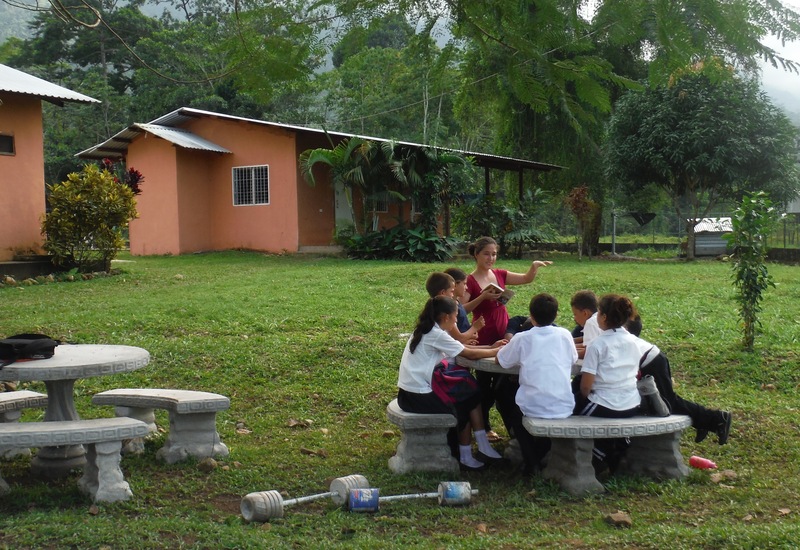 I had taught group Bible study that morning; Darwin had taught classes all morning with his small group of wily second- and third-graders and directed the girls’ choir practice after lunch. Our eldest foster daughter had a one-on-one meeting with our Christian psychologist to continue navigating the waters of healing and restoration while also looking to the future to discern the vocation/purpose that the Lord has for her in these coming years. 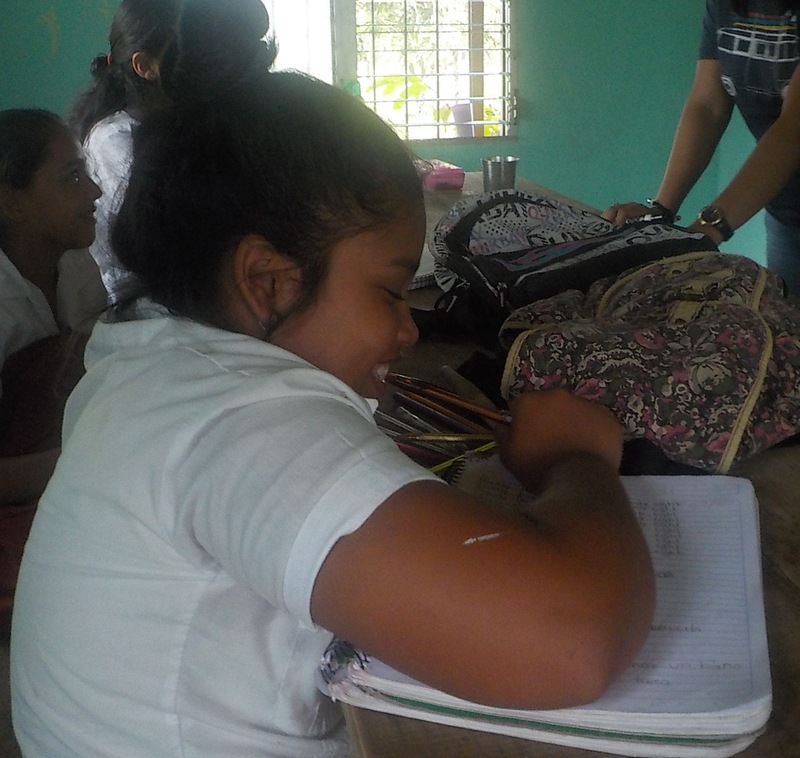 A couple of our girls had been in cooking class; I taught my math class with 16 teens earlier that morning before heading into town to attend a three-hour meeting with local government officials. This new season has brought small but important changes such as our new family dinner routine that we will carefully put into practice. 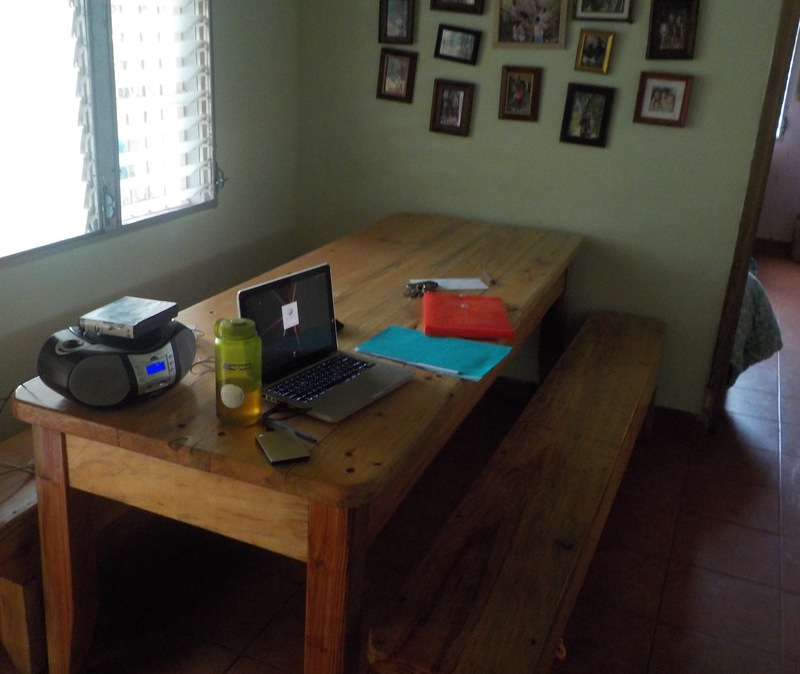 Each night as our kids all head into their rooms for homework and rest, I put on a sermon or two on my laptop (connected to two little speakers) in the living room so that our household is flooded with Biblical teaching. This specifically has been a very pivotal change in our home, as over these past several months I have downloaded dozens of sermons from respected pastors from different parts of the world to come directly into our home and teach us each evening. Our kids are resting in their rooms or taking a shower in the quiet of the night and everyone is receiving Scriptural encouragement. This has been very fruitful, and we will continue to do this each evening as we sow seeds into their young lives (and our own lives) for God’s glory. Another small change we’ve made is that our 10-year-old foster son Jason, who is in the process of being legally adopted by us along with his two older sisters, now accompanies Darwin each night to go walk down our long gravel entryway to lock the two gates on our rural property. This gives him ‘man time’ with Dad and teaches him that it will one day be his job to protect and care for his own family. Our foster daughter who had been well-versed in Christianity throughout her childhood in various foster homes and orphanages, several months ago had very little first-hand knowledge of the actual Bible. When asked to flip to a certain book, she had to go to the table of contents and spend several moments searching for it. For her to say, “Galatians. After Corinthians.” and find that tiny book in the midst of 65 others is of great encouragement to me as she is now getting to know God’s Word not based on what others tell her but based on her own time reading and exploring its depths. Praise God! There is much more I could write, but for now I will leave it at that. Thank you so much to those who support this mission and pray for us regularly. I continue to sleep much better in recent months after having battled insomnia for so many years, and after being bedridden with Typhoid Fever a few weeks ago my health is currently fairly strong. 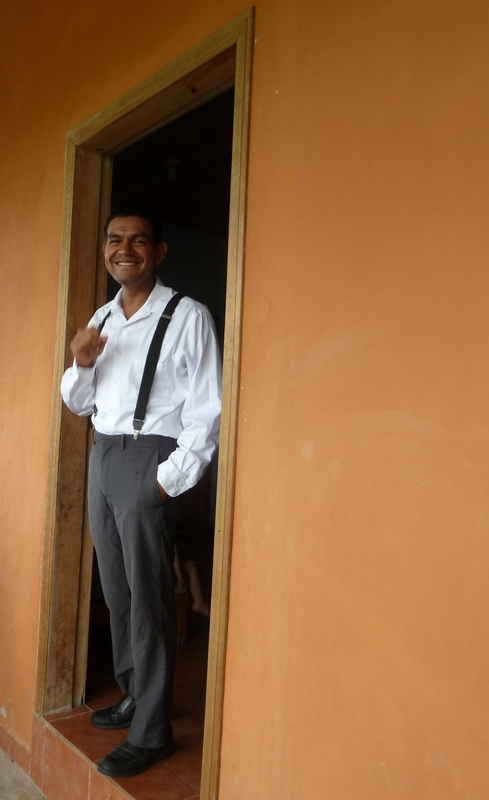 My husband Darwin and I will be celebrating 5 years of marriage this Sunday, and all of the local Honduran missionaries and teachers who serve alongside of us at the Living Waters Ranch are doing very well. Please continue to pray for the restoration and transformation of our foster children/teens and local students into the image of Christ, and also pray that the Lord would continue to protect us physically as we live in a very violent part of the world. 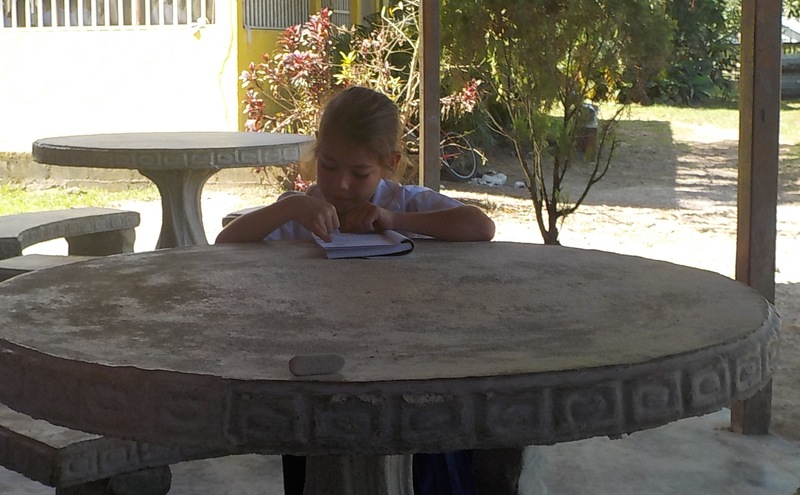 I write to you from our rural homestead in Honduras, Central America where the Lord has planted us firmly with the purpose of parenting the orphaned, proclaiming His Word, teaching the ignorant, reaching out to the destitute in our area with tangible help and living a simple, honest life with and for Christ. 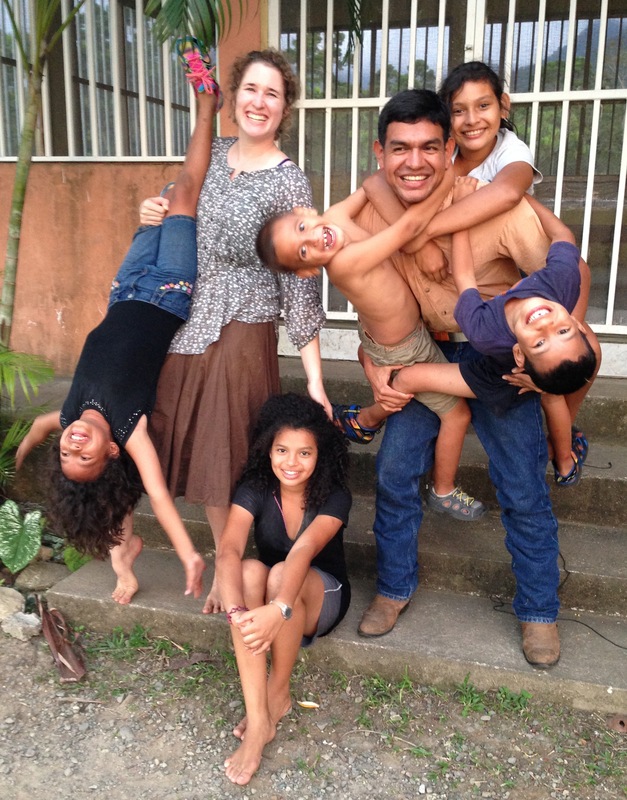 Next month my husband, who is a native Honduran whom I met here in Honduras while I was already walking the path the Lord had placed before me, and I will celebrate five years of marriage, and a few months after that we will celebrate five years of parenting the orphaned and ministering to the lost together for God’s glory. Four months after we married in 2013 our first three children arrived – the eldest of whom was 13 years old when she moved in, only 10 years younger than me. The current season of life, of marriage, of ministry and parenting that we are in is definitely new. Our house used to be filled with childhood relics – baby dolls and stuffed animals, sound-it-out books for those learning to read for the first time, pint-sized clothes that fit malnourished frames, and the like. Now – especially since two of our younger foster daughters left our home in January of this year to begin living with a stable Christian aunt – our home is full not of clingy, eyes-wide-because-everything-is-new-and-exciting children, but rather seasoned teenagers who have seen and heard just about everything, and now all that’s left is really believing it with all their heart and putting it into practice. Our two youngest will turn 10 and 11 within the next two months, and our older teens already have their eyes fixed on university goals and desires for marriage someday. Our eldest daughter has learned to drive our old pickup and now routinely shuttles over a dozen of our teachers and local students to and from our home each day. She turns 18 in just a few months. One of our other teen daughters is now enrolled in a beauty class in our discipleship-based homeschool program and cut my hair not four days ago with the helpful oversight of her instructor. 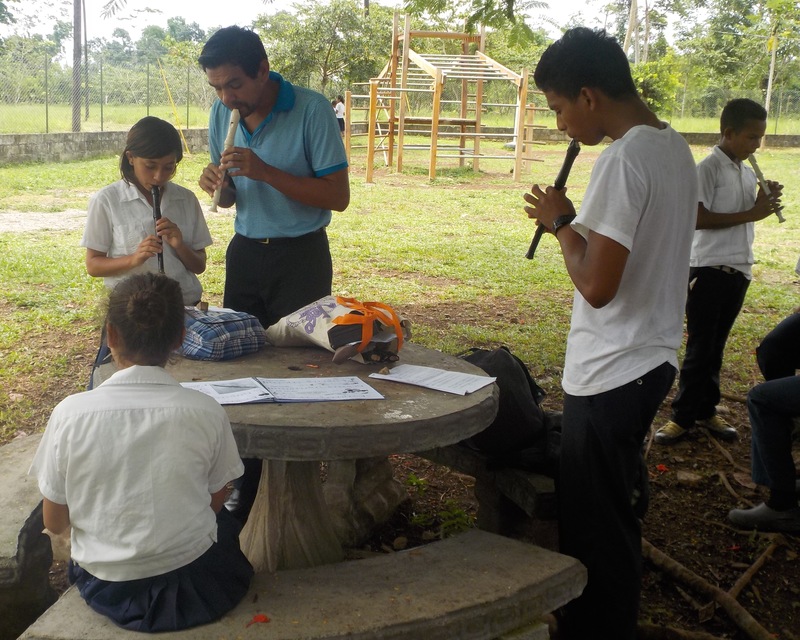 This upcoming week five of our kids will be traveling with my husband Darwin to one of Honduras’ largest cities to participate in a music concert by an internationally-renowned director. They have been preparing for weeks. I, like our children, used to feel like everything was new and exciting – every new or meaningful encounter, every inquisitive question they asked me about God or His Word, every heart-warming interaction that occurred in our non-traditional family – I wrote it down and felt compelled to share it with the world. I was a heart-on-fire idealist for Christ; I wanted to change the world; I found deep meaning in everything; every day was an adventure. This current season is not like that. 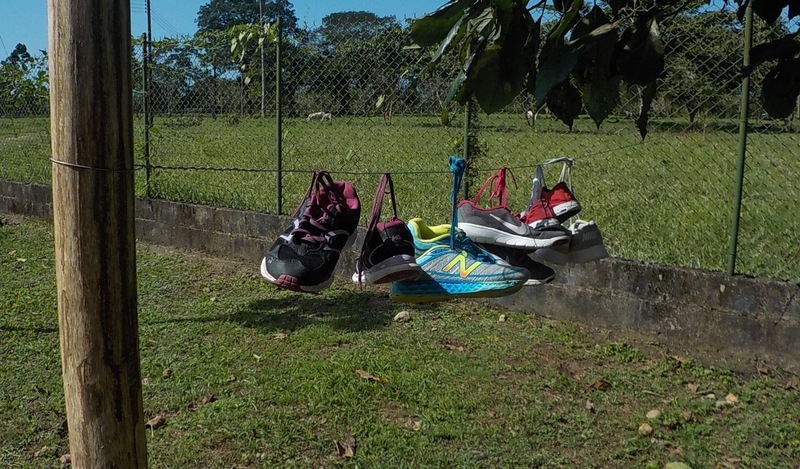 This season is not bad or boring or disappointing; I simply think I’m entering new depths, new understanding that is necessary for this marathon race that I had originally misunderstood to be a sprint (and I definitely did get tired a few hundred meters into the wild dash). We’re now more organized; our days are largely more predictable than they once were; our kids have less emotional meltdowns; we’ve grown in knowledge of His Word; and we’re now better equipped to handle the many situations thrown at us daily, whereas before most things used to catch us blindsided or throw us off balance. We’ve invested what the Lord has given us – His Word and His love, material provision, relational availability, counsel, our very lives — in certain people here only to see them eventually turn their back on the Lord and on us. This has been heartbreaking, but after having occurred numerous times it is no longer surprising. We’ve seen people come to the Lord and others stray from their commitment to Him. We’ve seen people we love make God-honoring decisions, and we’ve seen others we love make the worst decision possible even after receiving great amounts of godly counsel. Sometimes our foster teens surprise us with Spirit-led revelation or genuine spiritual hunger in their lives, and at other times I am left frustrated at their selfishness and spiritual coldness (and mine). Many profound, even tear-jerking things do still occur – and perhaps even more frequently so than before – in our household, and I do still receive revelations from the Lord, but I have not felt as compelled to write. Or perhaps I have not even known where to start. From age 17 on I filled up one hand-written journal after another – in addition to several hundred pages of written logs on my laptop – as I fervently sought the Lord, asked Him my questions, searched high and low for my life’s calling and reflected on just about every event that unfolded in my daily life. It was through this incessant search – desperate even – that the Lord revealed to me at age 20 that my role in His Kingdom here on earth would be to be a mother to those who have none. 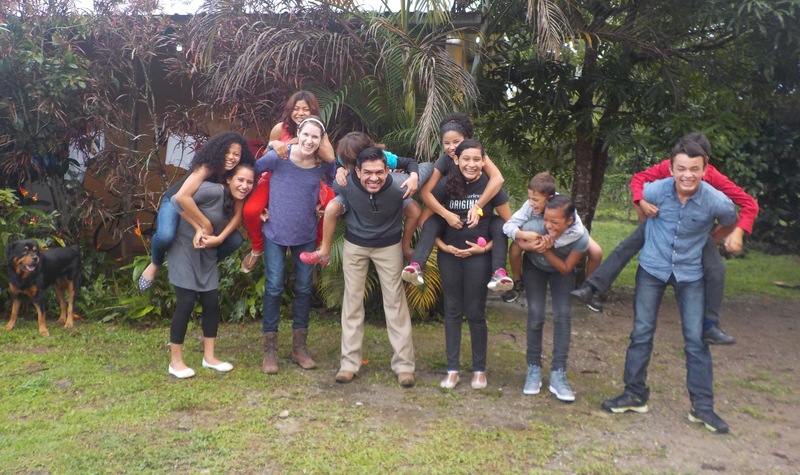 With time He has expanded, deepened that call to now include the relational discipleship and integral teaching we dedicate ourselves to in our home for dozens of local youth in addition to the 8 who live in our home. I had to learn Spanish, and I have learned it. I did not know if I was ever going to get married, but the Lord provided a faithful, loving husband for me (and permanent father for our children who all come from fatherless backgrounds). I had to be willing to give my own life away – give up on my own plans, relinquish my own ‘freedom’ and personal space – and the Lord has given not only me but also my husband the grace to live this lifestyle of radical hospitality in Christ, of Biblical parenthood for the orphaned and abandoned. Our lives are not our own; we are truly walking in our call. Six or seven years ago there were so many unknowns in my life, so many questions I pleaded God to answer. I was like a little, impatient child tugging on their Father’s pants-leg and staring up at Him, waiting for the answers. And He’s given them, and by some miracle I have believed – and not only in my heart but also with my life, with actions, with a daily walk. He’s been so generous, so gracious in our errors and mishaps; He has been such a good teacher, a patient Father to us in these first five years in the trenches! So, my question – however absurd or naïve it may sound – is: now what? Not ‘now what?’ in the sense of we’re-going-to-now-move-to-another-place-and-do-something-entirely-different-with-our-lives, but in the sense of, really, what does the Lord now have for us? Right here, with these same kids who are now teens and in these same little multi-colored buildings where He’s taught us so much already – what is in store for this new season? Is it just more of the same, but a deepening of it, a downward plunge into greater depths of excellence, of wisdom, of divine communion? In many ways I am in need of a new word from Him. This season has brought and continues to bring many blessings, two of which are the new teen girls who moved in with us late last year and have become integral parts of our family. This has been a new trek – becoming mom all over again, this time to girls well into adolescence who have already had many ‘moms.’ This journey has been beautiful and has proved to bring unexpected joy to our household in addition to the expected trials the girls present and the sacrifice required of my husband Darwin and I to parent them with grace, according to God’s Word. 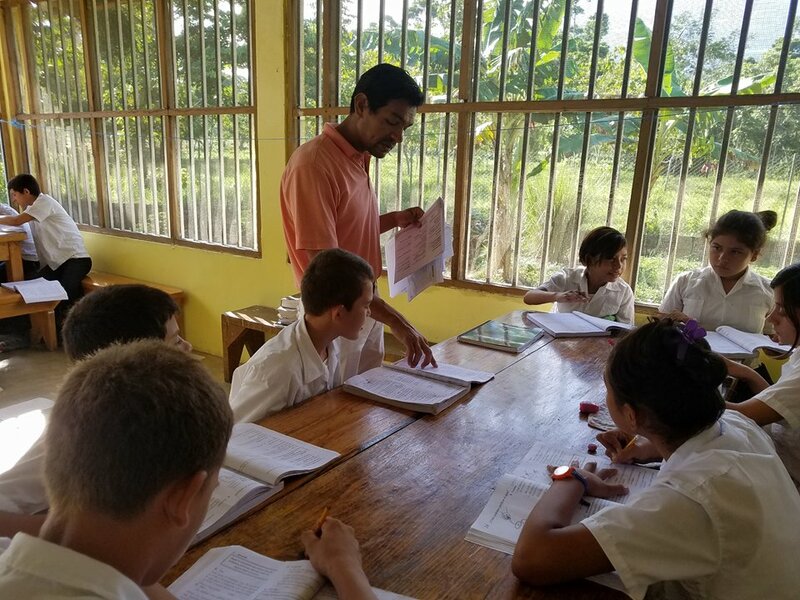 This year – this season – I teach an advanced math class for 16 teen students in the Christian school we operate out of our home, and I share God’s Word three times weekly in our large group Bible study where we gather in our dining room with about 40 people or so. 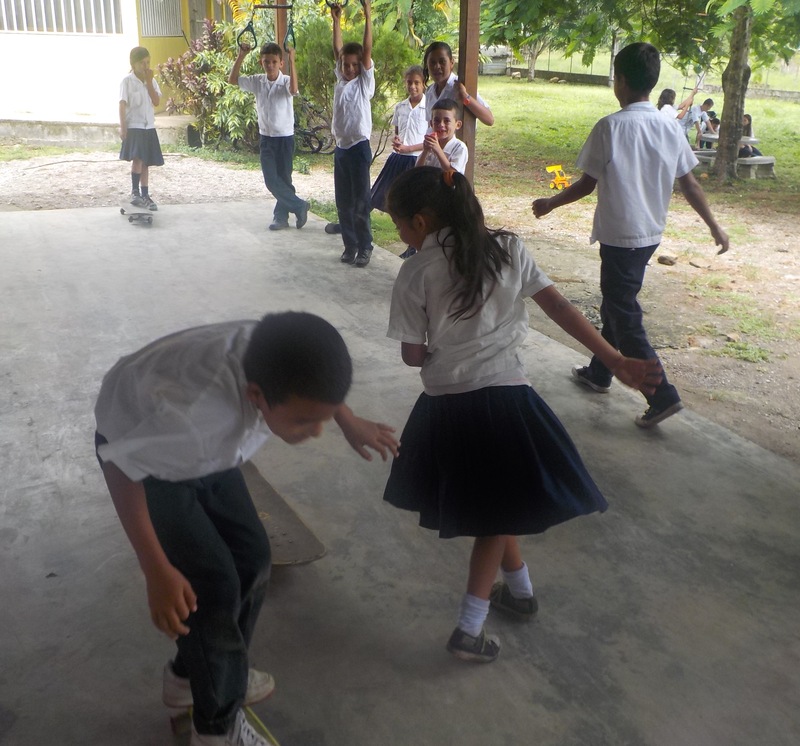 I teach a dynamic (and pretty funny) karate class on Wednesday afternoons, and I serve in a much less hands-on role administratively in our office this year, making sure all runs smoothly alongside of our dedicated Honduran staff. I handwash our clothes. I water the plants. I share the cooking load with our teenage girls (and our 10-year-old son Jason who loves to work in the kitchen). I listen to Christian sermons and teaching series online in my free time to continue growing. 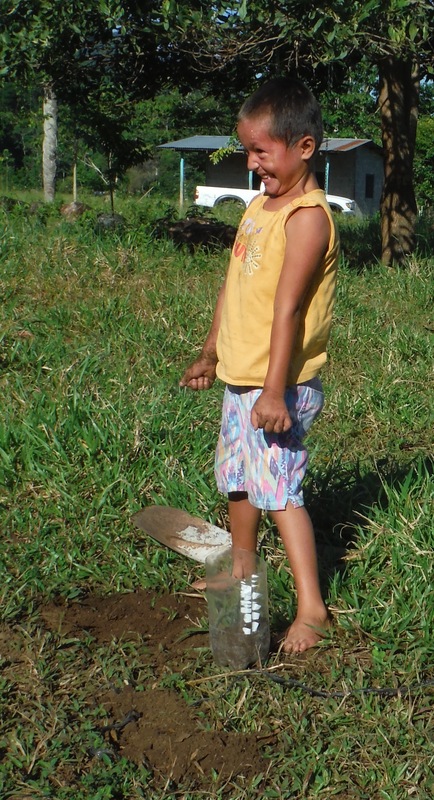 On weekends Darwin and I do maintenance and physical labor chores with our kids around our extensive rural property. We read the Word together as a family. 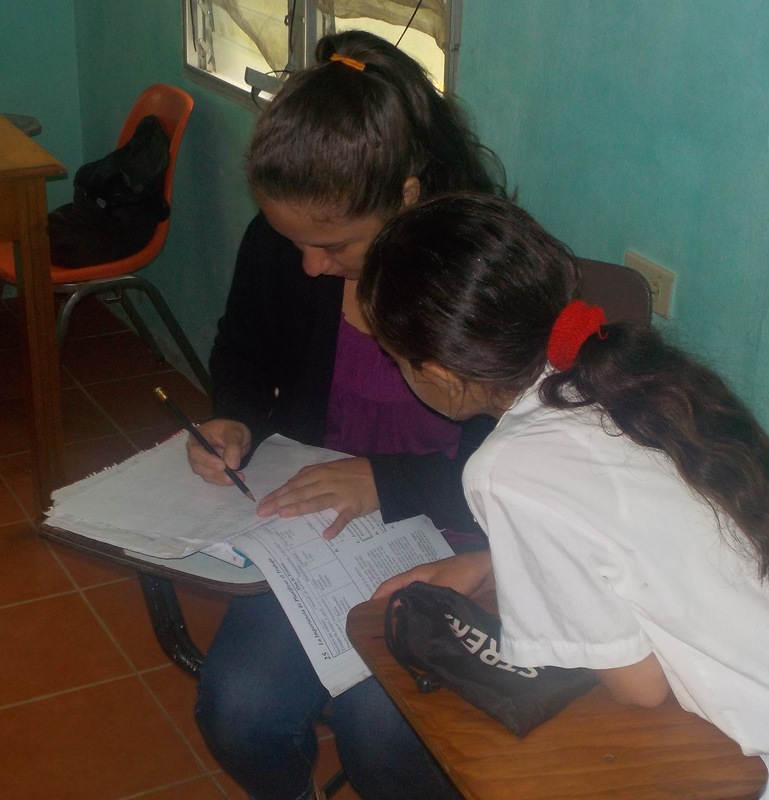 I oversee our kids in their daily chores and academic activities. My husband and I play chauffer for our teens on their way to music and dance classes. 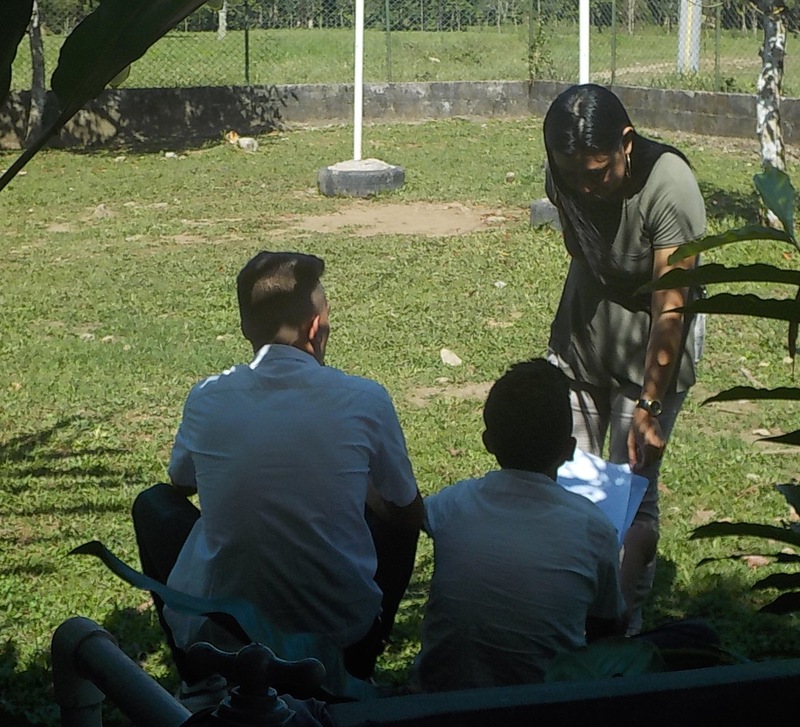 I lend a listening ear and a prayerful heart to our local students who oftentimes seek me out to help them in conflict resolution or if they simply want to vent. On an ongoing basis I seek to discern, to listen, to whatever it is that God wants to teach us on this narrow, beautiful path with Him. So, I’m not sure if this not-so-organized post will prove interesting or noteworthy to anyone who reads it, but I do thank all of you who pray for us and support this work on an ongoing basis. Please know that we continue onward with great faithfulness, and daily ask God to make grow these many seeds we are planting all around us. 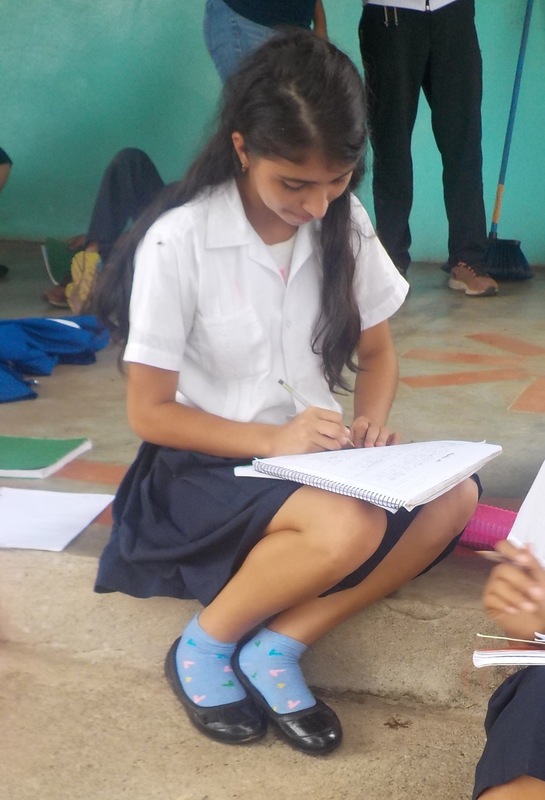 My writing patterns over the coming months may prove more sporadic as I have not been as led to write all our daily reflections as I have in years past, but this does not indicate that the work in Honduras is faltering or stagnant. We love Christ and daily seek to draw nearer to Him as our very lives are permanently marked with the good news of His salvation. His eternal Kingdom is our goal, and we desperately ask Him to bring to completion the good work He has begun in us. Several hours after our group Bible study this morning, I grabbed our old-fashioned digital camera and headed undercover (well, not quite) to each of our intensive classes that we hold every Friday for our more mature students. Most of our teens tried to run away or hide their faces when they realized I was taking pictures, but even so I got a few shots that are worth sharing. 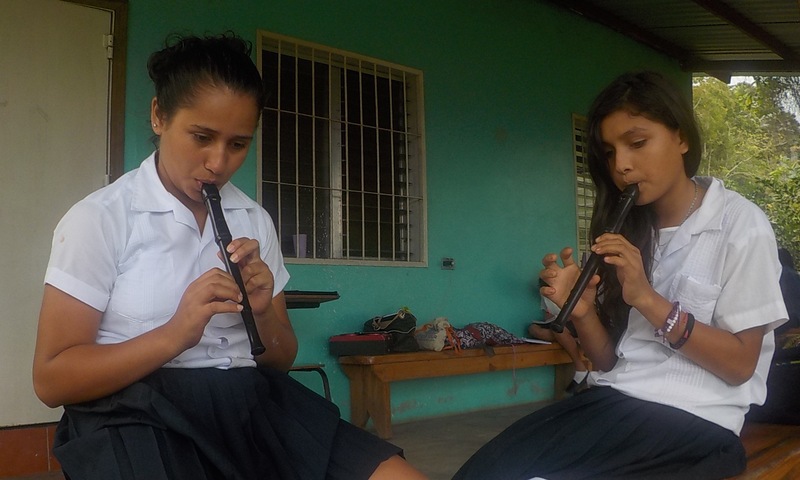 The following are photos taken of the following intensive 3-hour classes: Music/Orchestra (piano, violin, recorder, marimba and guitar), English as a second language, and organic agriculture/discipleship. Normally during this early afternoon time-slot there is also a group in community evangelism, but this week that class was cancelled because the local pastor who directs the group is in surgery. Thank you to all of you who support this redemptive work and/or pray for God’s continued guidance and protection over us. 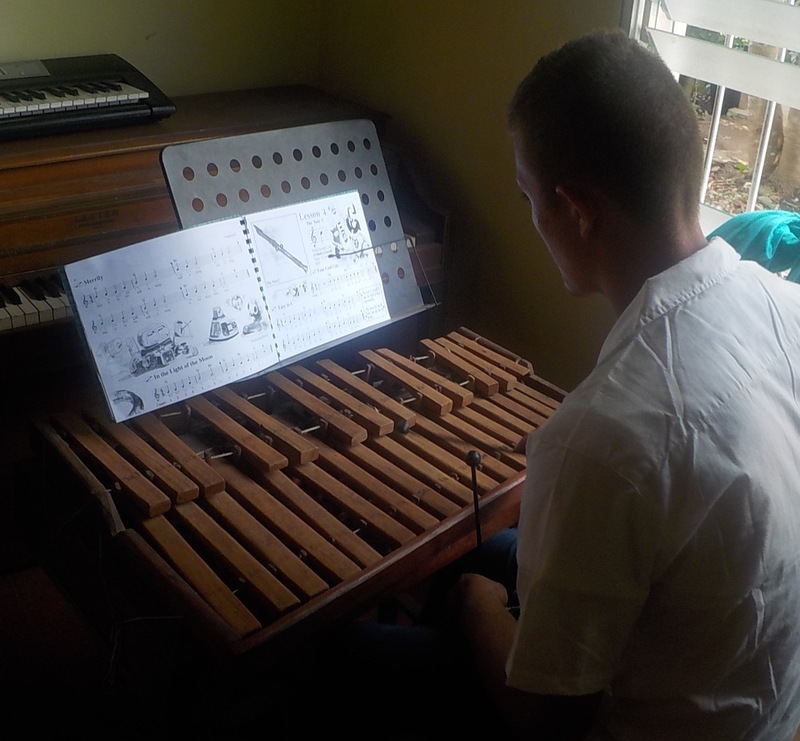 This is Ariel, one of our older local teen boys who comes from a very chaotic, undisciplined home life learning to play the marimba. These are two of our daughters whom we are in the process of adopting. 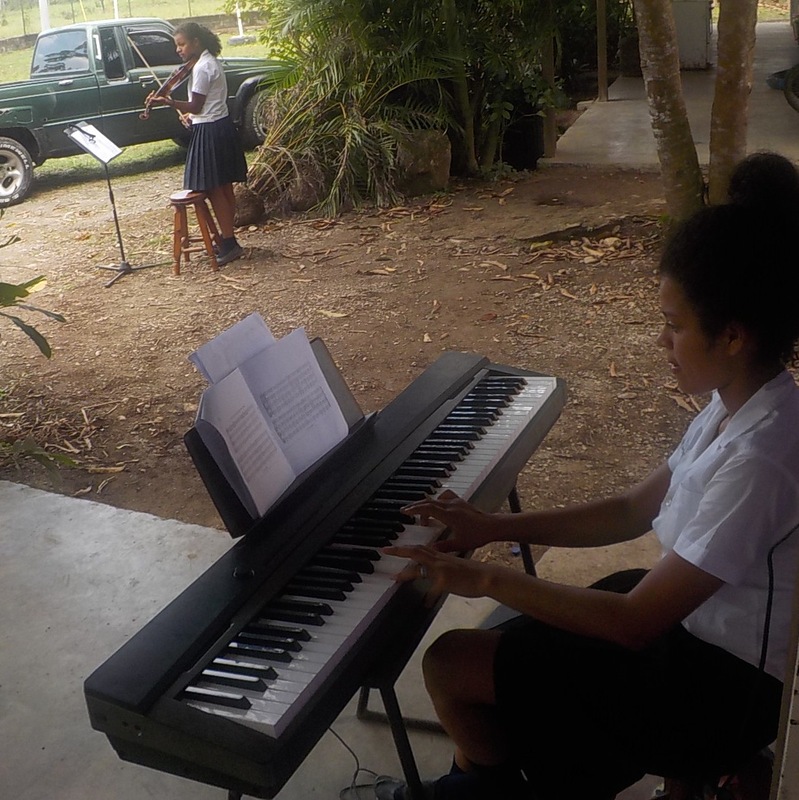 Musical training – paired with ongoing relational Christian discipleship – is one of our techniques to redeem broken teens and heal them through healthy, dynamic activities for God’s glory. 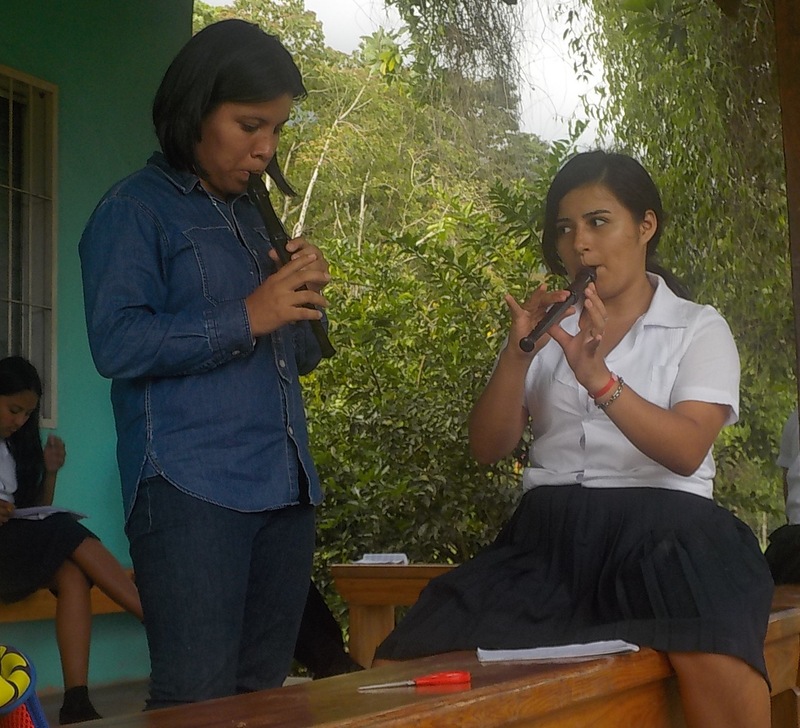 Paola (left), one of our new foster daughters who moved in with us about six months ago, with a local teen as they learn to play the recorder. 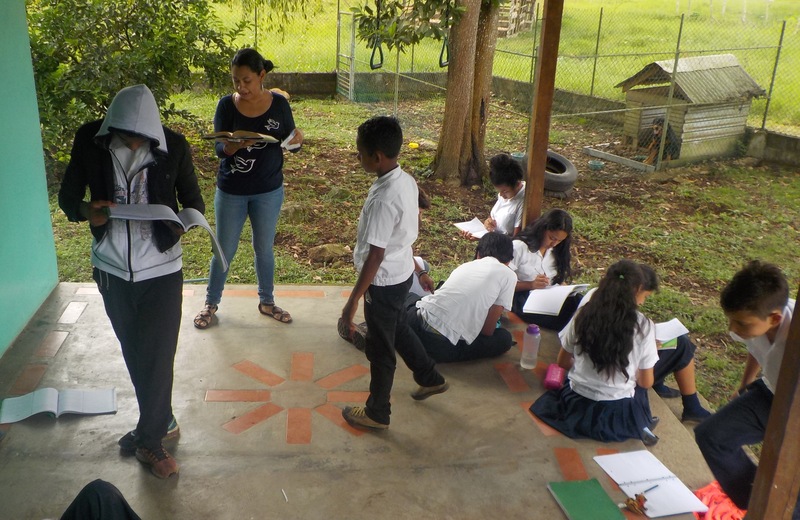 The classes imparted at the Living Waters Ranch are not confined to normal classroom walls: we oftentimes teach outdoors, go on prayer walks with our students, and interact with the beautiful Honduran habitat around our buildings as part of the youth’s integral learning experience. 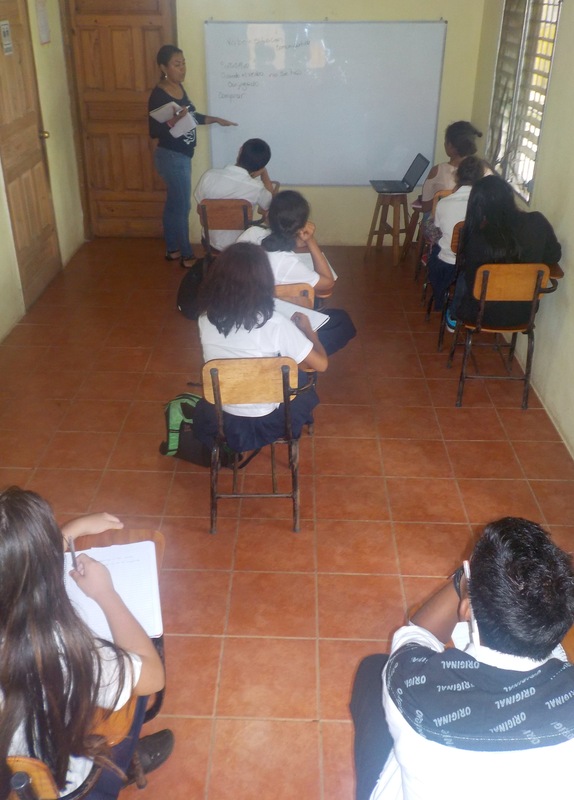 This is Miss Ligia’s English as a second language class. Everyone got the giggles and tried to hide their faces when I entered with the camera! Nobody wanted to show their face! When I got close to her with the camera, she got the giggles! What a beautiful smile! 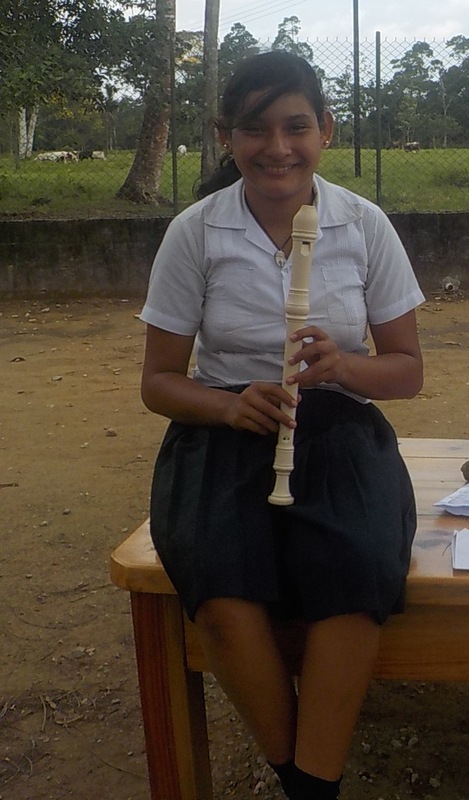 Now back outside with the beginners’ recorder class on the porch! This is our new Christian psychologist who is multi-talented! In addition to helping greatly in the integral psychological/spiritual healing of our youth in Christ, she has also been instrumental teaching in the classroom, leading a group of teen girls in twice-weekly prayer time and freely sharing her God-given talents through various outlets. 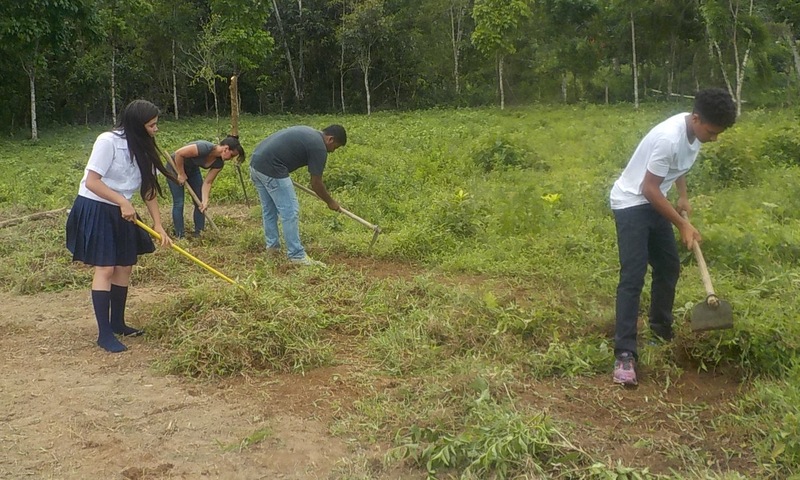 One of our local Honduran missionaries has a great passion to pair organic agriculture with small-group Christian discipleship, so several of these agriculture/discipleship classes are given throughout the week to the 60 youth in our program who desire to participate. 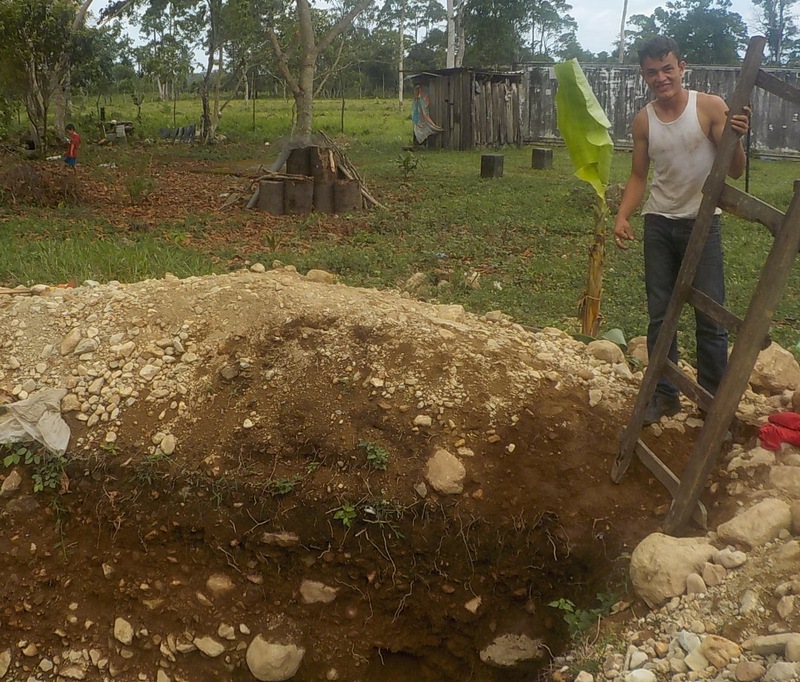 In these photos our 16-year-old foster son Brayan is working with a local teen to dig a 12-foot-deep hole to receive the waste from the pig pen we are building. These activities cultivate work ethic, perseverance and strength of character in our teens in addition to a deepened love of God’s Word. 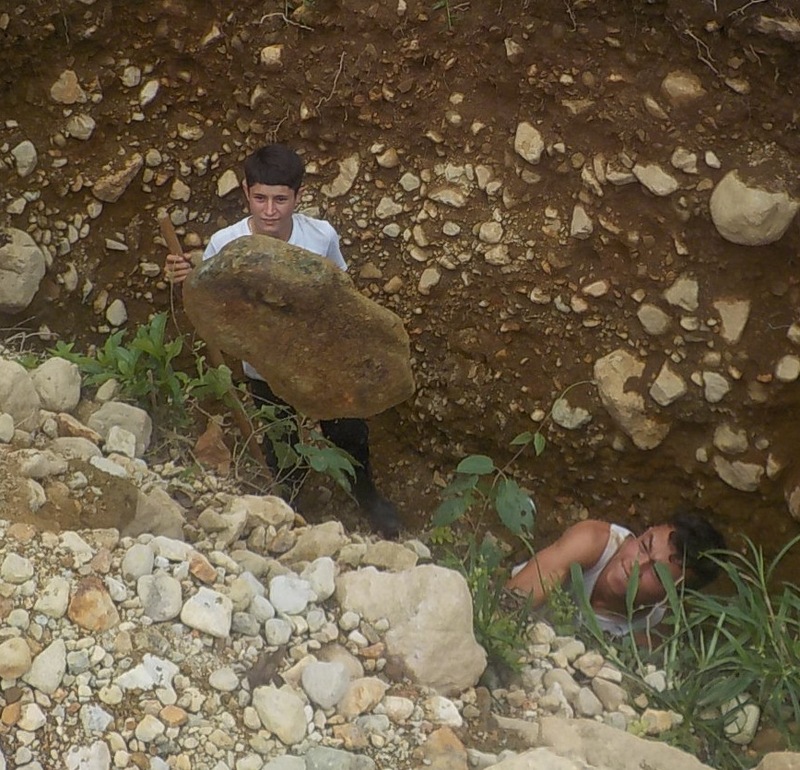 They’ve been working on this pit for weeks — one rock at a time! 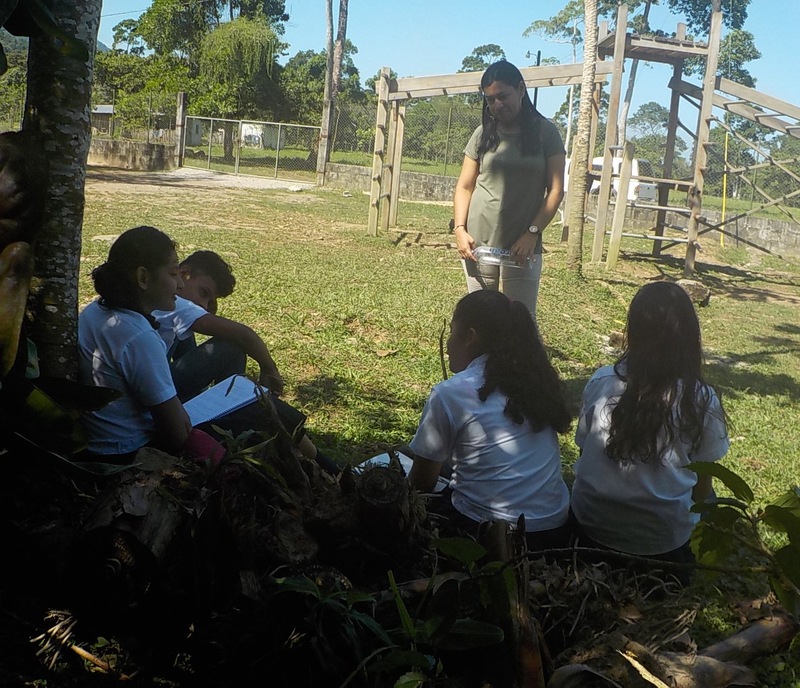 Two of our local teachers/missionaries work alongside of our students to cultivate the land organically as they learn more about their Creator and how to care for His creation. This is the little plot our kids have been working so hard on. 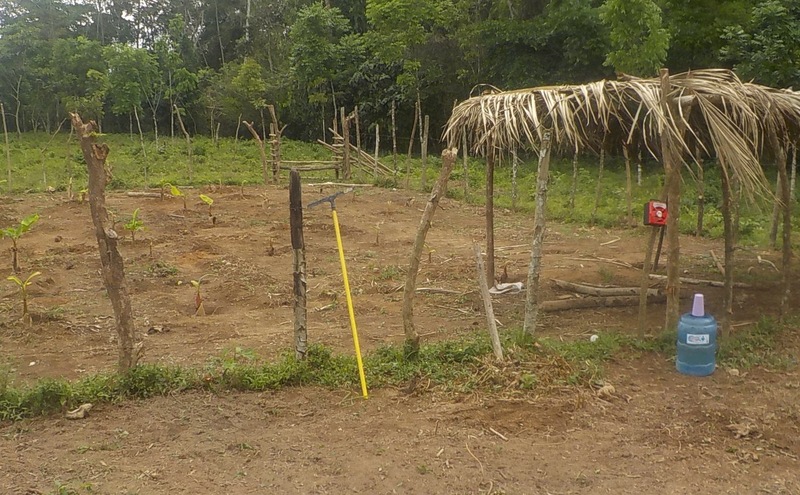 They’ve planted plantains and banana trees here. After my escapade out in the pasture, I passed back through our front gate and found one of our musicians hard at work in his song notebook. 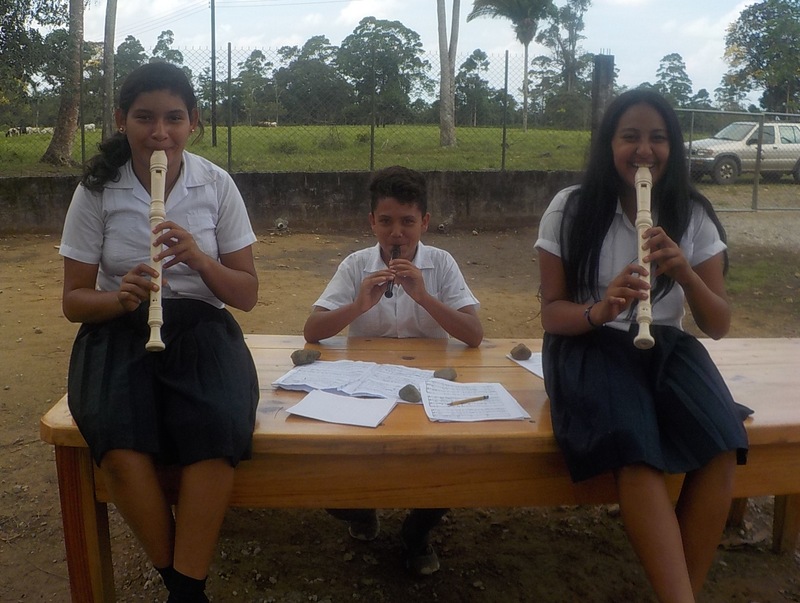 My last stop: a posed photo with three of our beloved recorder players (our foster daughter Jackeline, far left, and two local teens who have been in our program full-time over two years). Lookin’ good! Who knew that teenagers could be this cute? 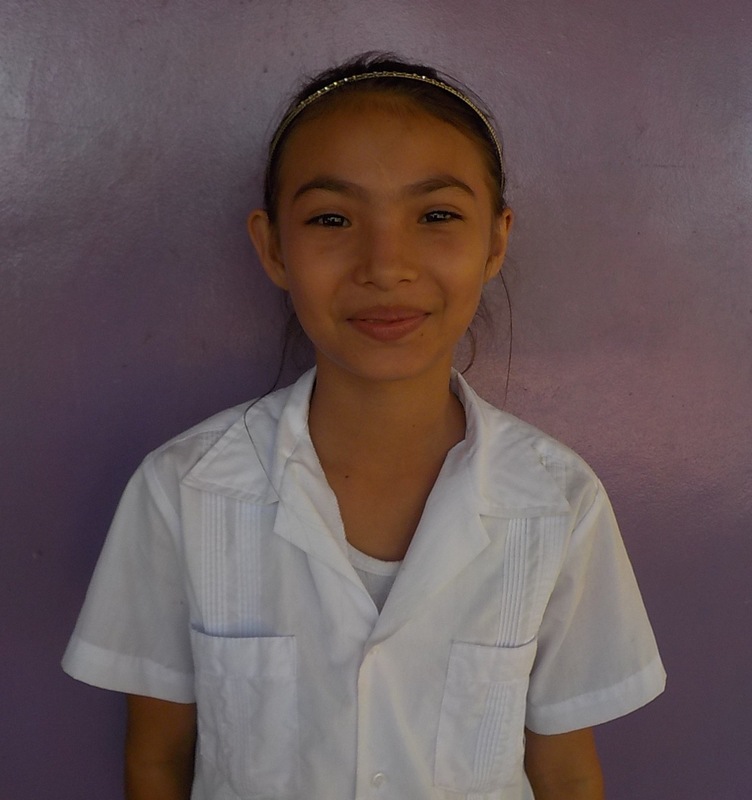 This is our foster daughter Jackeline. 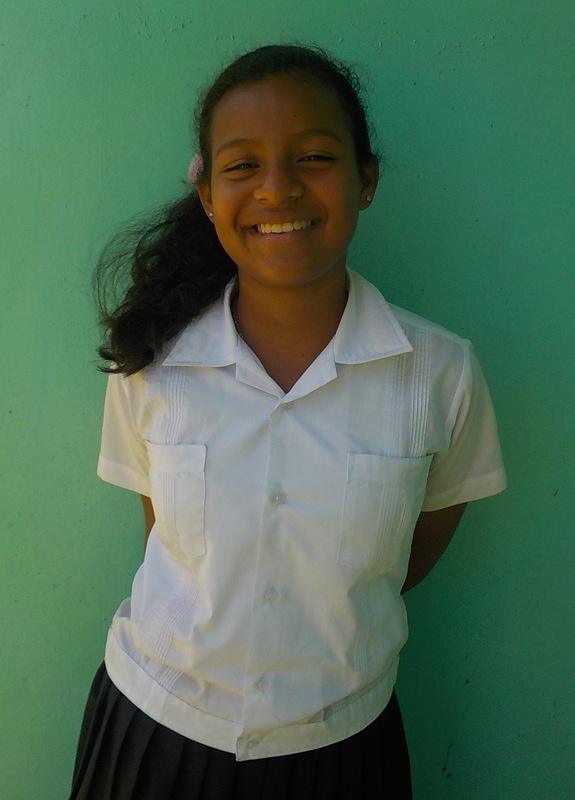 She is a talented mathematician, an avid cow-farmer and a great big sister to special-needs Josue. The Lord has done great things to transform her since she first moved in with us over three years ago, and we love her dearly. Nobody else was willing to participate in an impromptu photo shoot, so I headed back across our front lawn to our cinderblock home to finish up my admin duties for the day! God bless you! When I got up close for one of my shots of her, my cover was broken and she started laughing when she saw me! 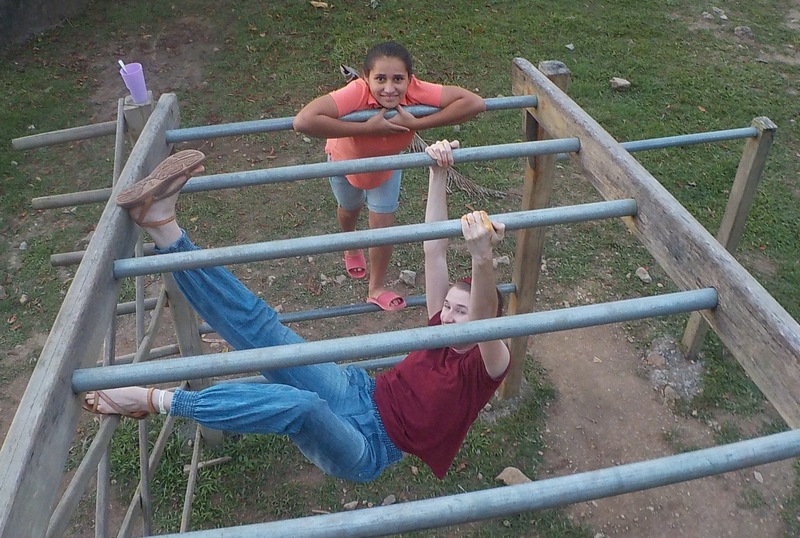 Our 15-year-old foster daughter Carolina — who moved in with us about six months ago — watched from close by and laughed while enjoying our spontaneous photo-taking antics. 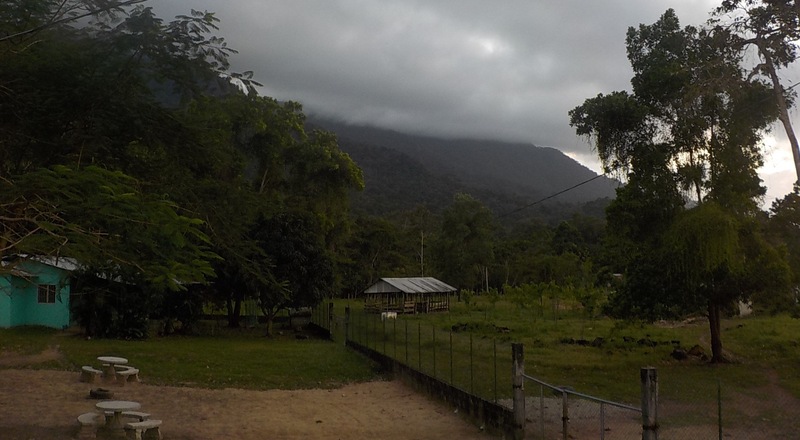 This is a photo Jackeline took of our cows’ barn in the distance and the mountains behind our property. 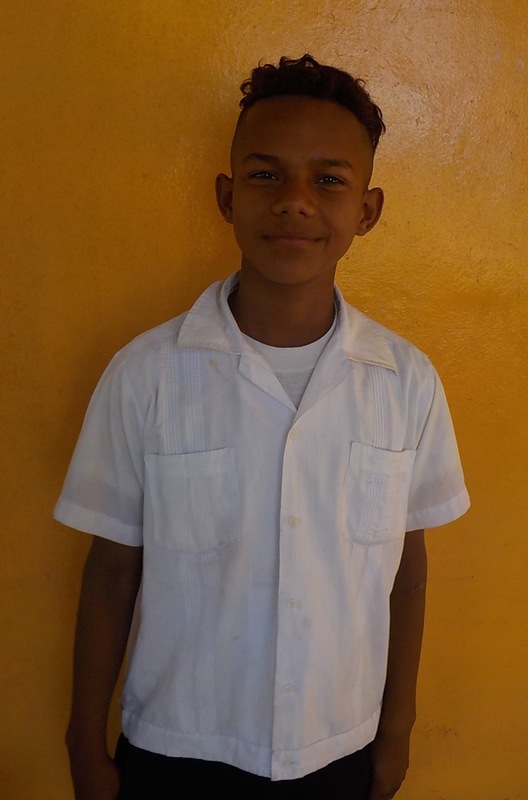 Our 16-year-old son Brayan, whom we are in the process of legally adopting, has greatly grown in his maturity/initiative in these last few weeks with the help of a local tutor. 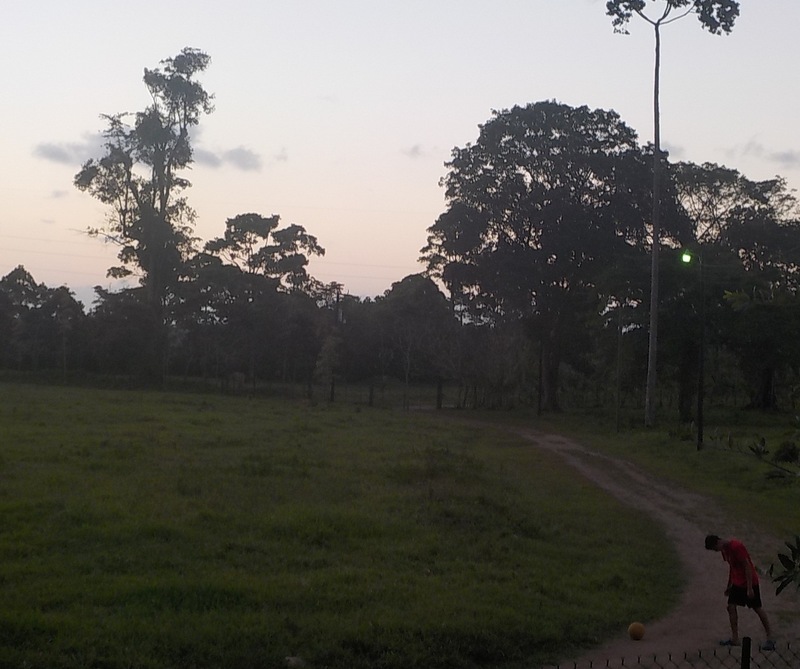 He finished his homework early (which used to never happen), so he went out front to enjoy a couple hours playing with the soccer ball! Good boy! 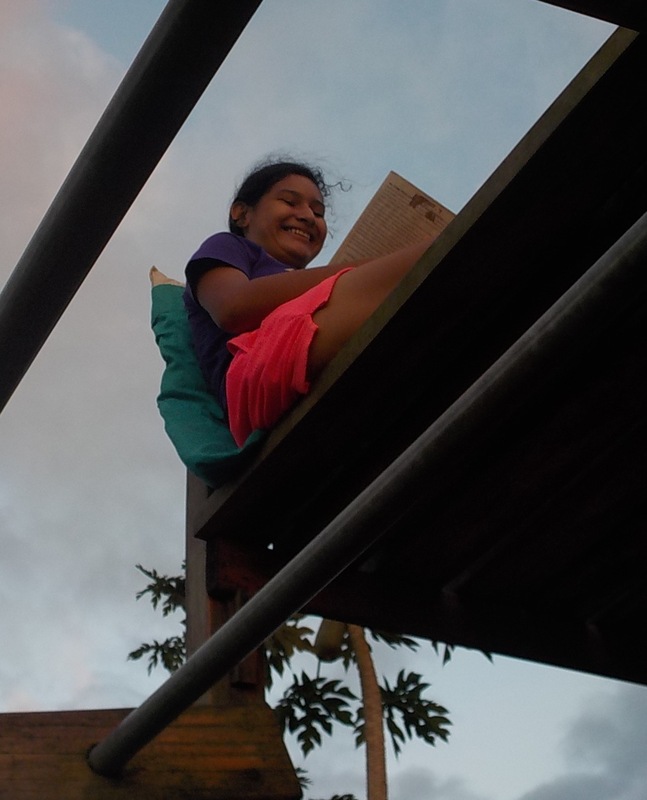 One last shot of Jackeline on her reading perch at dusk…beautiful! 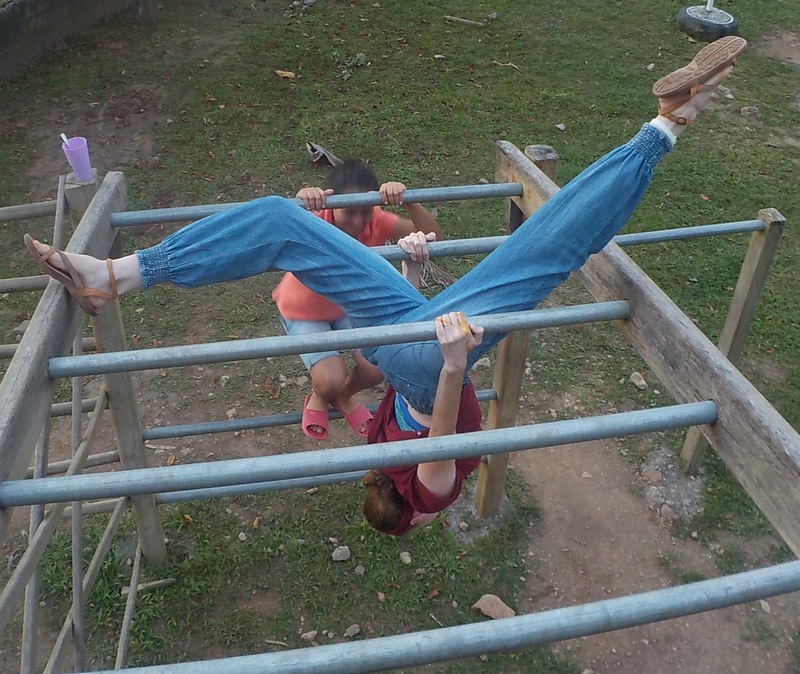 Yesterday in our large, mixed household in rural Honduras we did a new thing. We invented kindness training. Our foster kids/teens oftentimes struggle with asking for things politely or humbly submitting to authority figures. Rather than asking, “Could you please…[fill in the blank],” oftentimes we hear people barking at their siblings, “Give me [fill in the blank] or go do [fill in the blank]” without actually asking or adding a kind ‘please’ onto it. Many times we’ve verbally corrected them, instructing them how to politely ask for something rather than demanding it, but this has brought little behavioral change. Several months ago we had even reached the point of washing out all of our mouths with soap (my husband and I included) because we had all been misusing the free speech the Lord has given us. We lined up one by one in the kids’ bathroom after a long, serious family meeting and took turns scrubbing out the insides of our mouths as a consequence for getting snippy with one another and participating in complaints and gossip. It was a bitter lesson! Thus, yesterday morning as I was pondering on just how we might improve this politeness dynamic in our household, an idea occurred to me: kindness training. Now, of course, I had no idea what that was nor did it probably exist before we did it for the first time last night, but it turned out great once the brainstorm kept flowing in my mind and the idea was developed. 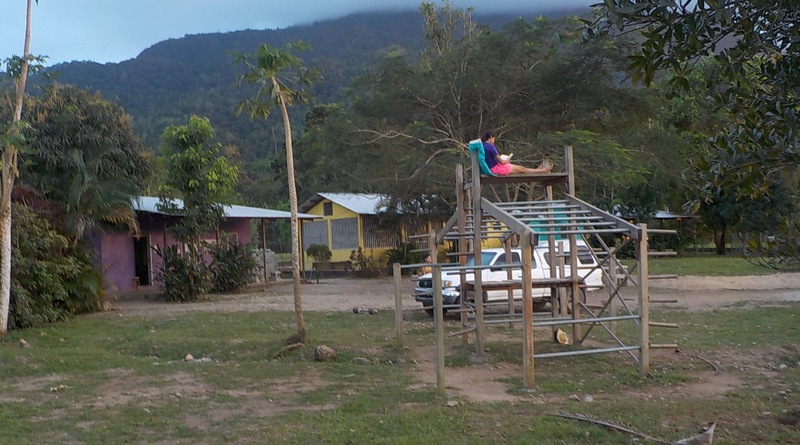 Last evening we drove into our rural neighborhood to pick five of our teens up from their weekly youth group in the home of a local Honduran missionary couple whom we serve with, and we brought them all home in time for dinner, as is our Monday routine. 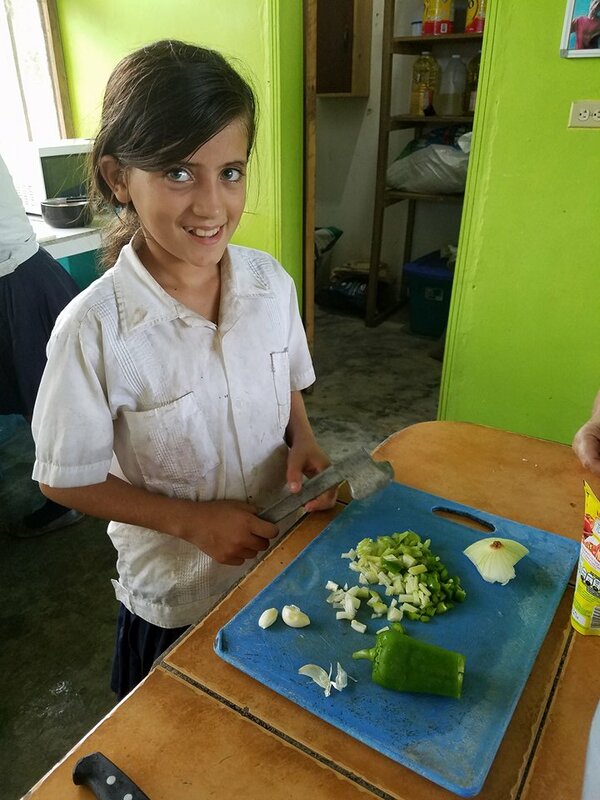 As the rice and beans were heating up on our gas stove, rather than everyone sitting around idly talking about how their day went, I called everyone together and informed them that we would be doing a family activity (which any teenager absolutely loves…not) and that everybody had to come to the dining room. Two of our teen girls tried to cleverly escape by ‘going to the bathroom,’ but they quickly got called back. Soon enough everyone was present and waiting for instruction. We would go one by one, taking turns standing up in front of the rest of our family members as those in the ‘audience’ would then ask something of the person standing in the middle or give them a loving order. The goal in all this: learn to ask things with kindness and to respond likewise. Then others followed suit, each person taking their turn to ask me to go close the gate, check the food on the stove, etc. Each person asked rather than demanded (being sure to attach a sincere ‘please’ on what they were asking), and as far as I was able to do what they were asking I responded sincerely and with a joyful attitude. 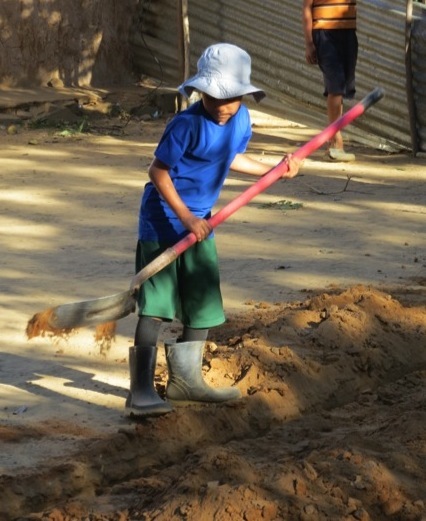 I was willing to serve and not at all inclined toward grumbling or laziness; this was the example to follow. As I finished my turn, I sat down and we waited to see who would go next. One of our extremely precious teen girls who has a reputation for being more than a bit explosive in our household — especially when people ask her to do things or help out, heaven forbid! — jumped up with a spring in her step, eager to be the next volunteer. Our eyes all widened and we wondered how this would go! Would she grow sulky or irritated as we asked her to complete the various hypothetical things we were about to say? She had a big smile on her face — this was miracle #1! I don’t remember who was the first brave soul to ask something of her, but soon enough we were all taking turns politely asking her to help sweep the floor, go wash her clothes, take a shower promptly, etc. 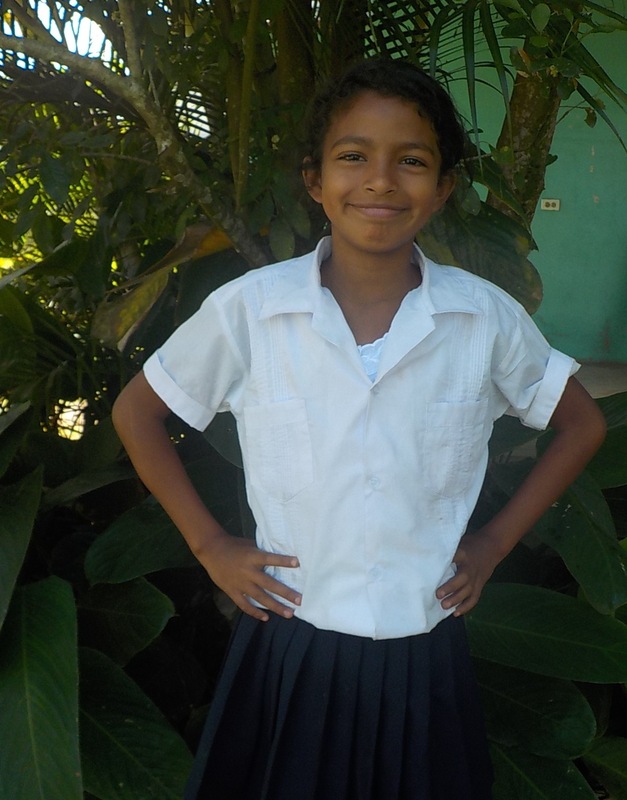 Each time she responded politely — this was miracle #2! Wow! And so we all took turns, learning how to ask things of others with grace (rather than demanding them) and how to humbly submit to another’s request as we seek to serve one another with the same attitude that Christ showed us. After about twenty minutes or so everyone had done the rounds. It was time for dinner! With my response, her eyes grew wide, she gasped slightly and squealed, “Hey! I did it!” She was surprised that she had actually put into practice what we had all just learned. At that we both laughed. Again this morning — the following day after our first kindness training as a family last night — I overheard a conversation between our two youngest boys as they were getting ready for school and one asked the other for something in an extremely polite and patient fashion. They could not even see me and had no idea I could hear them — wow! 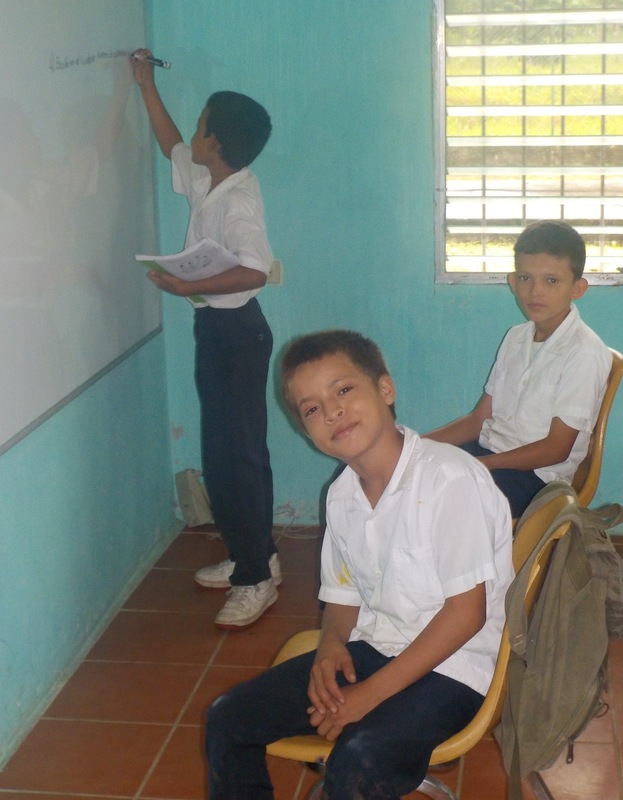 In like manner, a few weeks ago in our first advanced math class of the new year at the Living Waters Ranch where we live and serve, I informed my 18 teenage students that each day as they entered my classroom they would have to greet me. Upon hearing this, many started to smirk and giggle at my request — I was actually instructing them that they had to shake my hand, look me in the eyes, and tell me, “Good morning.” How absurd! I continued as I informed them, quite seriously, that at the end of each class they would likewise have to shake my hand again and verbally thank me for the class. Many looked very surprised at this, as this type of training seems a bit audacious (and makes the teacher saying all this seem a bit self-centered), but I told them that the benefit was not meant for me but rather that I desired to train them to be polite and thankful with all of their other teachers and in all situations, both with God and with people. Well, my students and I are now several weeks into this process and they are now fully trained to greet me kindly at the beginning of the class and thank me at the end of the class — and not only that, but I’ve overheard them doing it also with their other teachers at the most unexpected of moments! Yes! 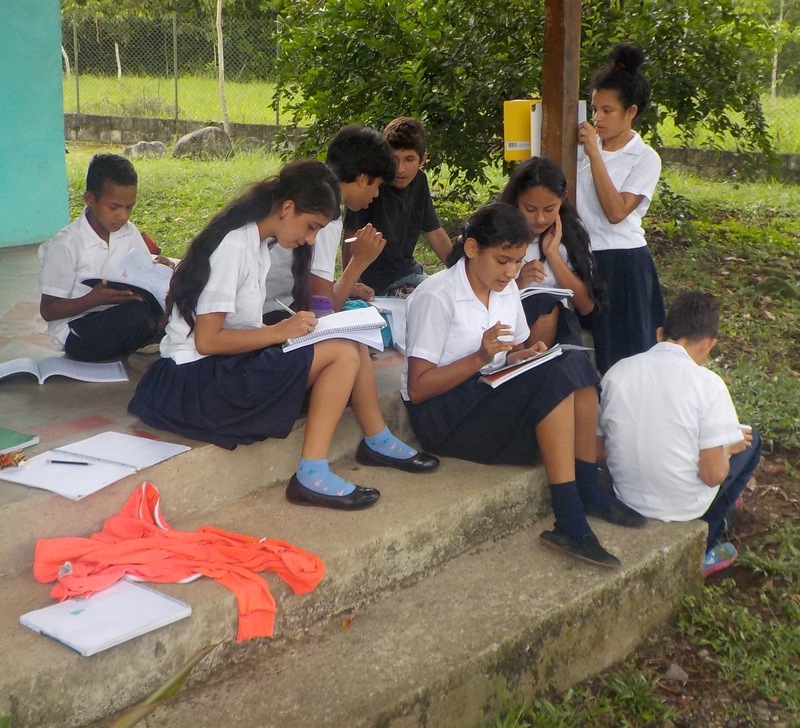 This morning I had the privilege of going room-to-room around our rural property to take each of our students out of their respective reading classes in order to take an individual photo of them. After initially having signed up close to 70 students during our enrollment time in January, we currently have 60 who have persevered (this is normal in our area where drop-out rates are high and limited perspectives abound) and are already two-and-a-half weeks into a very rigorous, fun, and blessed year of Christian discipleship, academic classes, organic agriculture, music, and community service/evangelism with us. Our students come from all walks of life — some are good, normal kids who come from stable families and simply need to grow in the truth of Christ; others are well into their teens and are just now entering primary school; still others have catastrophic backgrounds and are coming to know what it is to grow in a loving, God-fearing environment for the first time in their lives. 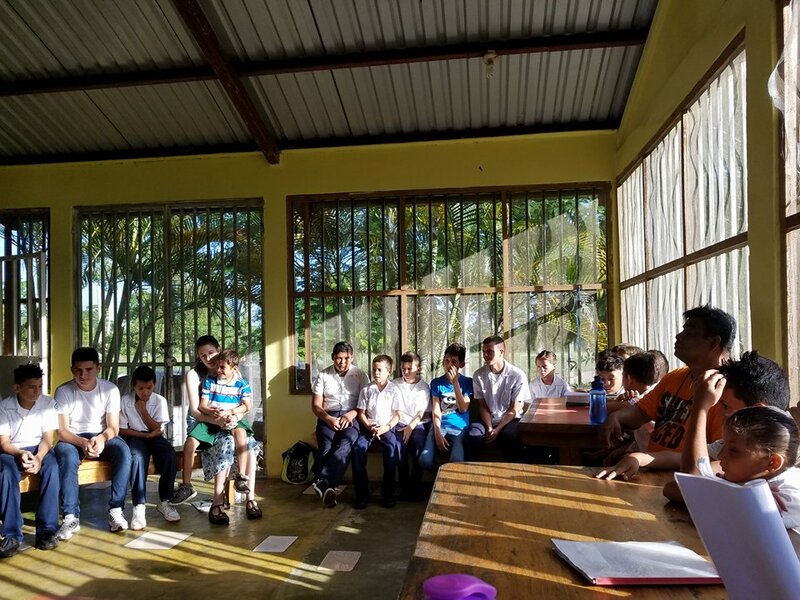 This year we have several older teen boys (15-18 years old) who have decided to enter our discipleship-based homeschool after having spent the last several years of their lives working full-time or simply roaming our rural neighborhood without direction. The majority of our students have lost at least one of their parents, and even as we are in the mere beginnings of this year the Lord’s work has already begun to manifest itself in the lives of several of them. So, this morning I walked out the front door of our cinderblock home and crossed our front yard as I entered the little bright-colored buildings to greet our precious children and teens for the second time today (the first time was this morning at 6:45am as they came streaming through our front gate, each one received by name with a hug and/or handshake). 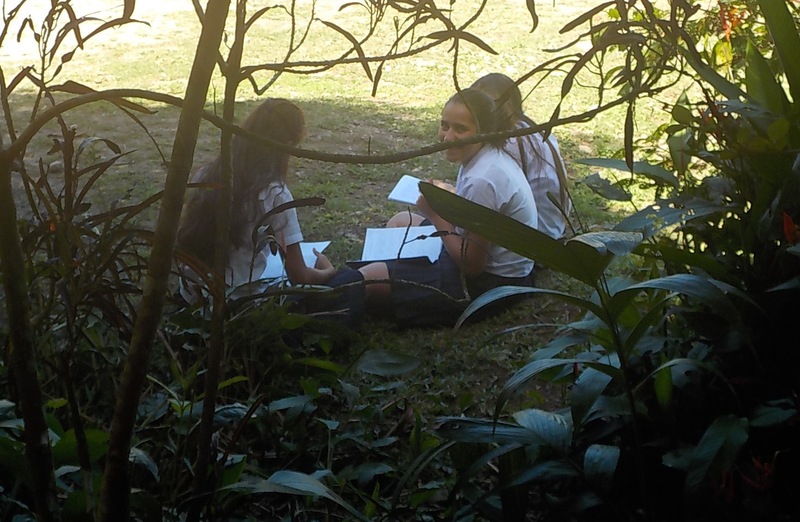 During this process of taking the individual shots, I also took photos of various groups of students who were enjoying their reading class out on our front lawn and alongside the shade of our front porch. In our large, mixed family in which my husband and I have fostered 11 children and teens in the last four-and-a-half-years, we’ve had to find (and most times create) different methods — however wacky they might turn out to be — in order to train our precious little ones in the ways of righteousness. Well, our ‘little ones’ are no longer little, as the majority of our kids now lie in the age range of 13-17 years old. Simple rebukes, time-outs or other common disciplinary procedures designed for small children just don’t do the trick (especially not with ours, who arrived in our home already on their way to puberty or several years into it). So, in addition to regular times of prayer, Biblical counsel and healthy family time, we’ve gotten creative in the way that we train our teens. One constant struggle in our household (mainly among our 5 teenage girls) is that of gossiping, hurt feelings, and the like. On many occasions we’ve facilitated very on-edge conflict resolutions among our girls, always guided by prayer and asking for Christ’s peace to cover each of us in the process. 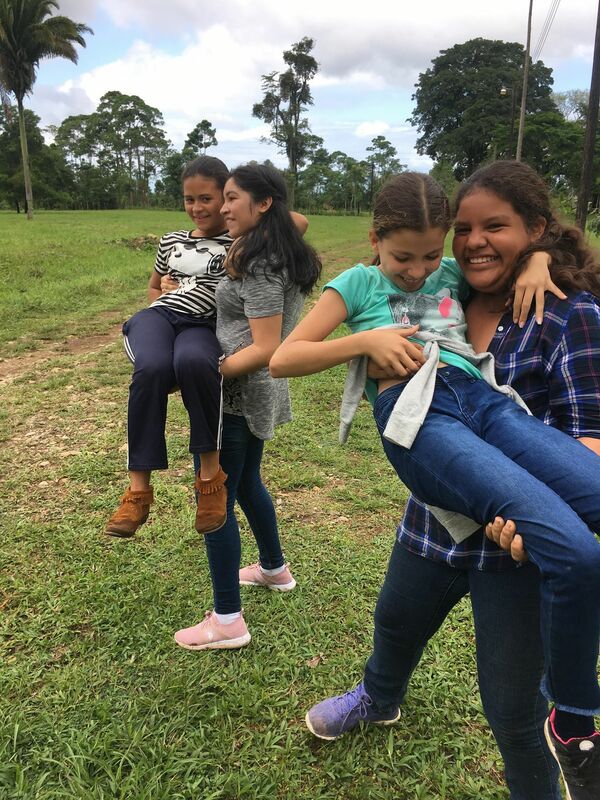 By God’s grace our girls have come a long way, and they now have better (and more loving) communication skills that most of their peers but there are still certain ‘tweaks’ that we hope to make in the attitudes and behaviors in our home. With that being said, a few nights ago a plan struck me: I would go innocently pop by our girls’ rooms to encourage them in love, and each time I would do so I would give them some kind of tiny treat. One of our girls was out for the night at a friend’s house, so our teen girls numbered four for that night. Two in one room; two in the other. Knowing too well the attitudes we had been facing in our home in the last few weeks between these four (and their tendency to form teams against one another), I asked God for an extra dose of joy and began my absurd rounds, all in the name of brotherly (or rather sisterly) love. I had already hugged each of our kids and bid them goodnight not 15 minutes prior, so at this point no one was expecting me to come back by again. It was still early, so I knew they would be doing homework or chit-chatting quietly in their rooms. 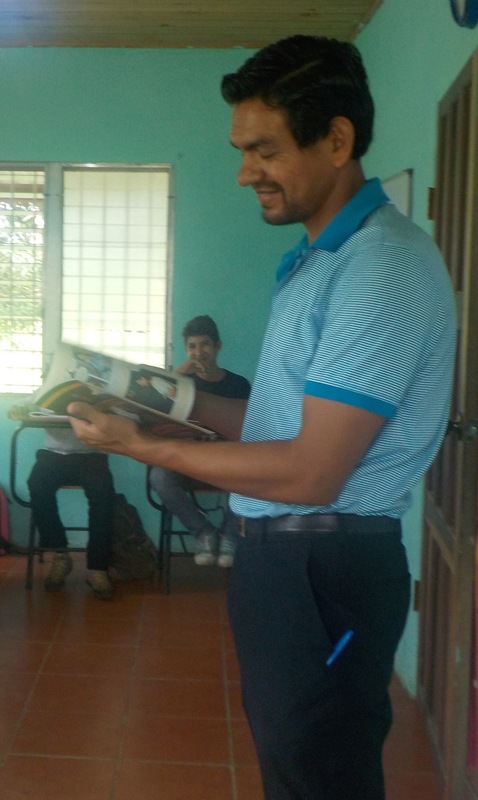 It was a perfect opportunity for a lesson in God’s love. I approached the first room, a black curtain hung in the doorway (our kids don’t have doors on their rooms). We had just recently painted our kids’ rooms for the first time in a few years, and this particular room now sported a beautiful turquoise blue with black music notes painted along one wall. I knocked on the frame around the curtain and asked in a joyful tune if I could come in. They quickly answered, telling me to pass. This was Team 1, and I was determined to do all that was in my power to assure that their nightly ‘sleepover party’ didn’t turn into a gossiping match against their other sisters. I slid the curtain open, my face now beaming through it as I greeted our two precious teens with my wide, energetic eyes as they sat quietly on their floor doing the math homework I had assigned them. They looked up at me expectantly, waiting to see what I needed. Their brows furrowed a little, not expecting that question, and nodded ‘yes.’ They were less than enthused with their guest. 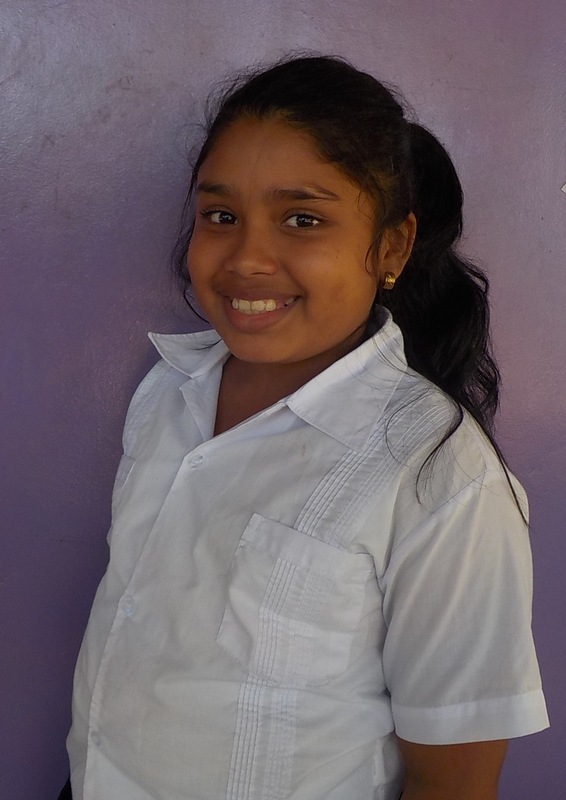 A small smile cracked the lips of one of our girls, and she answered, “Yessss, Mom. In thought and spirit we love them.” The other one arched an eyebrow, which seemed to say otherwise. That’s okay, I thought. We’ll work on that. I threw the cookies toward them as they reached out responsive hands to grab them in the air, now squealing with excitement. This game was not only a little weird, but also fun! I then entered fully into their room, passing the threshold and bending down to kiss each of them on top of their head. Then I was gone, out in our living room commencing the long journey (of about a yard and a half) to reach the doorway where our other two teen girls were. This time a bright mixture of pinks and purples greeted me from the curtain dangling in their doorway. Knock-knock. “Girls, can I come in?” My voice was sing-song, and surely they already knew what was up because in our house you can practically hear every conversation that goes on from one room to the next. They let me pass, and in this room, too, I kept my left hand hidden behind the curtain with the treats held firmly in it. I asked them the same questions, if they were loving their sisters. One of our teens, not at all amused and having had a pretty rough week with one of our daughters in the other room blew me off and replied, “Uh, sure. We’re loving them.” The other girl present, one of our new daughters who has only been with us a few months, looked a bit confused by my question and sing-song voice. Her face betrayed anything but enthusiasm as she then murmured something about having a nice thought about her sister, although her attitude had not really changed. I encouraged them to love and honor their sisters for love of God, not only in their presence but also behind their backs. Hesitating on whether or not they really deserved the cookies, I headed in anyway and tossed them their incentive. 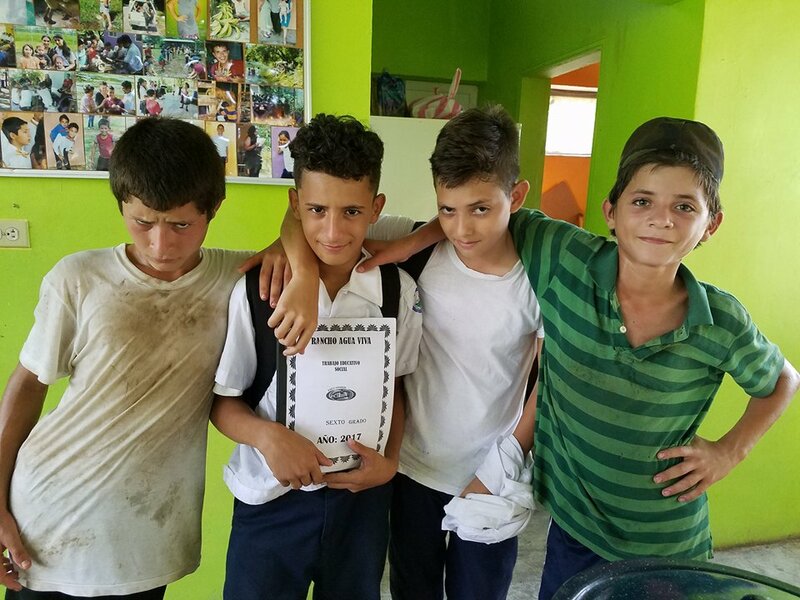 They both looked surprised as they received their chocolate cookies (a rare treat in Honduras), and I went to each one and gave them a kiss on top of their head. Then I left. Only two or three minutes passed before I entered my bedroom stash and grabbed more treats, ready to do my second round of many. I went to both rooms, knocking first and then asking each group similar questions as to whether they were truly loving their sisters and honoring them in thought, deed, speech, soul and spirit. (Each time I went I made the questions longer and a bit sillier). By now they understood what was happening and answered the questions quickly and enthusiastically, waiting for their treat. After answering the questions and receiving their prize I would give each one a kiss on the top of the head and a pat on the back or a hug. And so every few minutes — repeating itself more than five or six times — I would make the rounds to the two rooms, trying to intercept/distract/combat against any potential gossiping or bad attitudes that could easily happen during our family’s Sabbath Hour when we don’t have as much contact with them. Each time their reactions (and facial expressions) got happier, and they came to laugh really hard about the craziness of it all. At one point — now over 30 minutes or so into the outrageous process and with our girls enjoying a small fortune of sweets — I entered the second room and the girls were laughing so hard that they were almost crying. After I asked my questions and they affirmed their love for their sisters, I went to toss them a bag of chips and they both blurted, “We thought you were going to bring lollipops!” and began howling with laughter as if that was the funniest thing anyone had ever said. I’m not sure why they thought I was going to bring lollipops or why it was so funny to them, but they both began rolling on the floor and pointing at one another with uncontrollable laughter as they struggled to breathe. I stood in the doorway and contemplated what joy can do to a person. They looked absolutely beautiful, much more so than when I first appeared and they were put-off and closed down emotionally. Now the fun could not be contained! On my following round (which ended up being my last), I entered their same doorway and asked them the now-infamous questions. Their faces were still speckled-red and tears were brimming in their eyes from their laughing fit as they now felt eager to answer my questions. One of them, the one who was first so unenthused, actually invented a song and began sining really loud about how much she loved her sisters (by name, even including the one she hasn’t typically gotten along with!) and finished her performance off by adding, “I love my sisters in deed, in word, in thought, in soul, in spirit, with my nose, with my knees, and with my hair.” With that the laughing fit overtook her again and she began rolling around the floor, pointing at different body parts of hers and gasping that she loved her sister with her ears, her elbows, etc. By now I was laughing along with them, and in that moment I whipped out a lollipop for my singing daughter. Her eyes grew wider (the lollipop was what she had wanted all along), and she squealed really loud and kept going with her proclamations of love as she received her reward. The other one, seeing the other lollipop in my hand, began laughing hysterically and singing her own song about how much she loves her sisters. It was a total riot, and she won her lollipop! 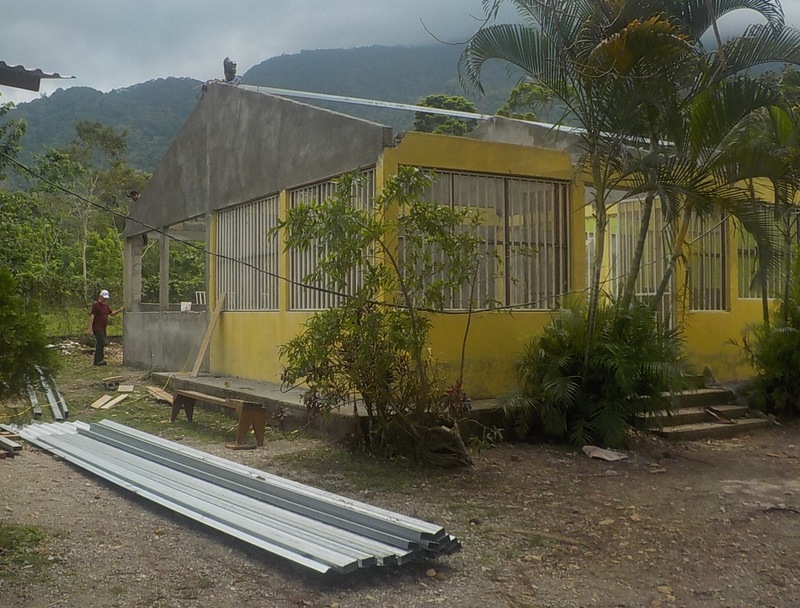 So, that is our crazy story that took place four nights ago in our little cinderblock home at the base of the mountains in a third world country deeply scarred by hatred and sin. It may not be much, but I share it with you so that we may all be encouraged to love one another (face to face and behind our backs) for love of God. Our Father designed us to love Him and love one another, and I believe a bit more riotous laughter within God’s perfect will can go a long way to heal certain scars caused by sin. There is a Way more excellent than that of resentment, relational wars and lack of forgiveness, and it is that of love in Christ. Be encouraged! Several weeks ago after a busied trip into the city to do those errands that never end, on my way back home I turned off the main highway and took the drive into one of those dangerous neighborhoods where they say you have to pass with your windows down so that the gang lords can identify who comes and goes. In this particular neighborhood we’ve come and gone dozens of times visiting different people, so I rolled my windows down without a second thought and began making my way carefully over the neglected pavement eaten up by so many potholes. I turned down one side road and then another, pulling to a stop in front of a small collection of homes, although I couldn’t remember which one it was. I hopped out – I believe it was raining on that particular day – and knocked on the door of a blue-colored house. I thought that was the right house, anyway. Blue. A woman opened the door with wide eyes, unsure who I was and what my business was. I immediately realized I had knocked on the wrong door. I quickly apologized and asked if she knew which home belonged to the woman I was looking for. She knew. Two houses down, she told me. I jumped over puddles, my bright blue rain-jacket shielding my blouse from the falling raindrops. Two houses down, also a blue house. At least I got the blue part right. I stooped on the tiny porch, taking the hood of my rain-jacket down under the cover of the roof above. All the windows were closed and there was no sound coming from inside. It looked like no one was home, especially in this culture where people who are home have their doors and windows open, several people lounging on the porch or washing clothes in the front yard and occasionally high-volume music blasting from some stereo. I knocked once and waited, then again and waited. As I was about to turn and leave, the door opened, ever so slowly, and a woman’s gaze met mine. At first she looked like she suspected trouble – frightened and ready to close the door immediately – but as she recognized me her countenance immediately changed and a genuine smile, albeit a surprised one, overtook her tired face. We embraced one another as we have on so many other occasions and she quickly let me pass the threshold. “And the kids?” Her face brightened even more as she glanced behind me, waiting to see her special-needs son and teenage daughter. I apologized for not having brought them with me (alas, they are always with us!) and told her that the purpose of my surprise visit was not a once-per-month visit between our foster children and their biological family members but rather a visit between two adult women, between she and I. This definitely caught her off guard, as we’ve never done such a thing in our three years of knowing one another, but she quickly accepted and showed me where to sit in the completely quiet, still home with all of its windows firmly shut. As I sat on the only couch in the living room, rather than sitting across the small room in one of the arm chairs she commented on how she preferred to be closer and sat not two feet from me on that couch. It felt right and natural. 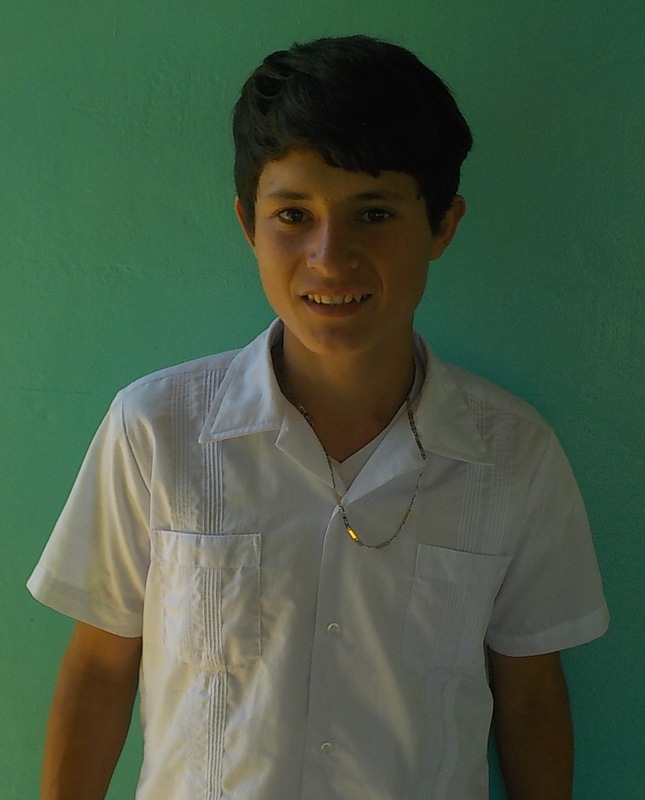 What ensued was a free-flowing conversation that lasted over an hour between Josue and Jackeline’s mom and myself. For months – years perhaps – the idea of becoming more involved with this woman has been floating around our hearts and minds, swelling up and speaking out at different times. More than once we’ve considered aloud between my husband and I providing this down-and-out shut-in a part-time job with us and a new start. 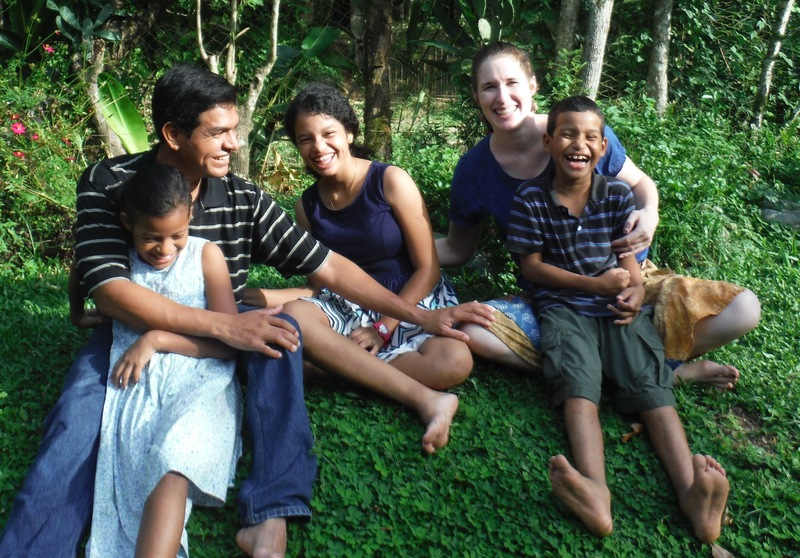 When her two precious children first moved in with us back in January 2015 their stay in our home was meant to be a temporary solution until she could find a steady job and place to live. Three to four months they had told us. Well, a few months has turned into a few years, and she’s been unable to find any kind of stable work or place to stay. The news has always been the same, and her situation – as much economic as emotional and spiritual – has been stagnant if not declining, and up until now we really didn’t know what move to make, if any. Employ an emotionally unstable woman who probably desperately needs a counselor in our home working with at-risk kids? Is that really a good idea? But have not many people – not only children and teens but adults as well – come to know the Lord alongside of us, and could us being more involved in her life and showing her God’s love on a more regular basis not possibly lead to her salvation and renewal? If her kids’ lives are worth the risk and investment, is not hers as well? So that was all it took. I talked with Darwin, and we sensed that it was finally time to act. I would go to her house unannounced (because her cellphone no longer worked so we had no way to call) and I would propose the idea to her: a healthy way out of unemployment, more physical closeness with her children, being included perhaps for the first time in her life in a loving, vibrant Christian community and hopefully a drawing near to Christ as well. One of those very familiar questions began to show itself in my mind: Do we have the finances to provide a job for her—? before it was quickly dismissed. After all, God has called us to do many crazy things over these last few years, and He’s always provided a way to make it happen. Well, the details of our in-depth conversation have since been lost on me, but I do know one thing: the Lord did send me there that day, and He did use me to listen to a very broken woman who desperately needs loving companionship and a new start in life. I said little; she spoke much. Several times throughout our conversation I reached across the little couch to pat her shoulder as she shared with me her struggles. Several times she mentioned her belief that only God could help her; that she had been flirting with Satan too long and that it was time to make a change and give her life over to God. I continued to listen, hope swelling in my chest. She mentioned her kids many times – which strangely enough are also my kids now. It was surreal listening to this mother who desperately loves these same kids whom I have grown to dearly love. 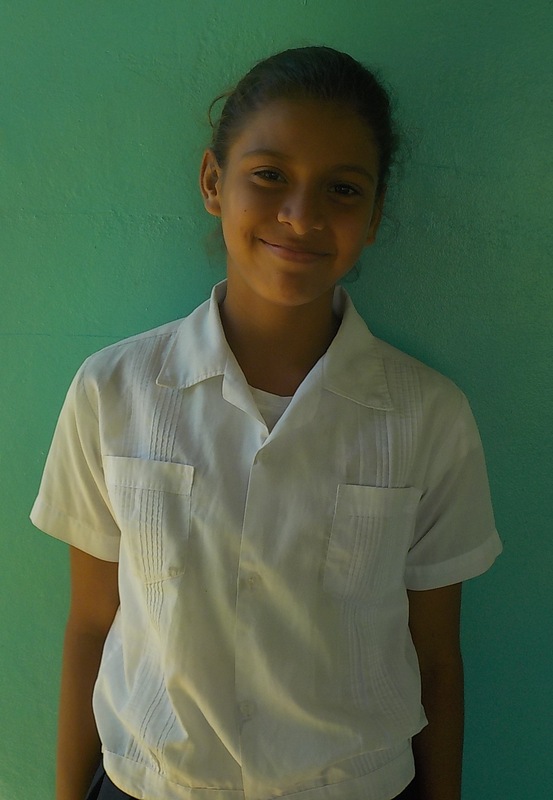 Toward the end of our conversation I walked over to a coffee table in the small house – her sister’s house where she’s been living in a spare room for several months – and saw an 8’ x 10’ photo of now-14-year-old Jackeline when she was a toddler. This woman holds the memories of the kids when they were little, and the memories from these last three years have largely been made with us. Between us there was no sense of competition or anger but rather of gratitude and deep respect from both parties. Surely God had orchestrated this whole thing. So I left, and she said she would call me in the next few weeks once a family situation was resolved to see if she could come serve alongside of us two days per week. Serve in what capacity, I had no idea, but Darwin and I were ready to step out into the unknown as God was in the process of preparing just one more miracle of life and redemption. Our initial conversation was several weeks ago. Yesterday was Momma Ingrid’s first day of work. We can say that it was lacking in any drama and full of spiritual blessing. She arrived on time, quite timid but ready to participate. 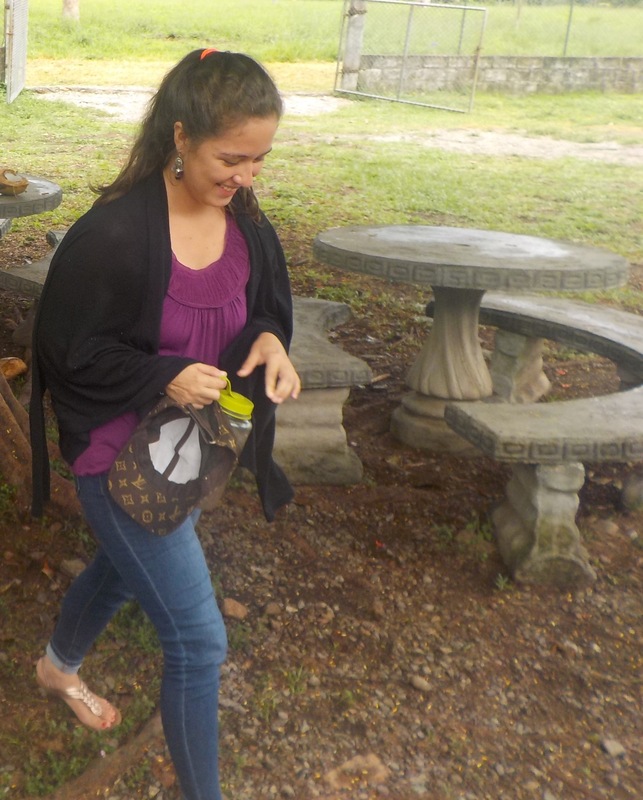 Many years ago she was a secretary in a bank (a prestigious job in this society where many people are illiterate and do hard labor for a living) before falling on hard times and bad decisions, so we decided to make her our official secretary at the Living Waters Ranch (a job that never before existed). Darwin worked with her a couple hours in the office that all of our staff share in order to show her the ropes, and she joyfully went about with general office tasks for the rest of the day. She saw her kids throughout the day, participated in Bible study and prayer group in the morning, and smiled more than she normally does. Several times throughout the day she told Darwin and I that she doesn’t need to get paid; she’s just happy to help and see her kids. We listened, thanked her for her thoughtfulness and willingness to serve but assured her that we will be paying her. She’ll be coming back again on Wednesday. 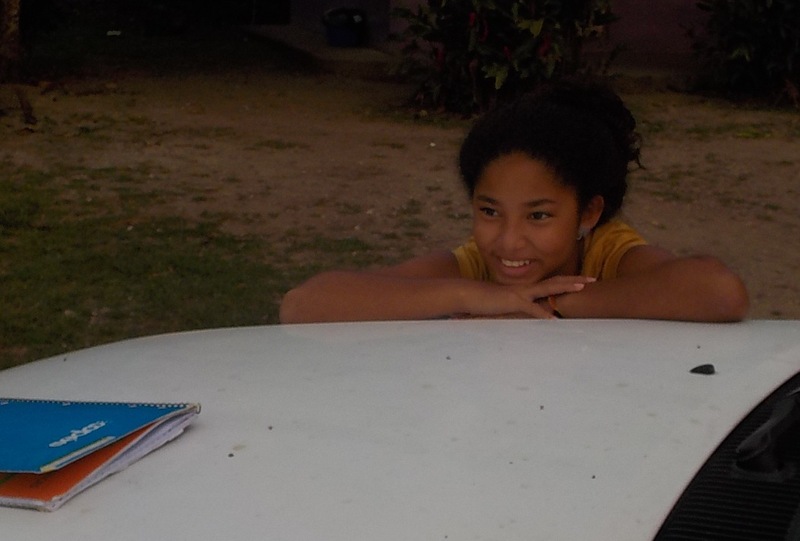 And so, yesterday at 3:00pm as I left our home with all of our teachers and Momma Ingrid piled in our old pickup truck to go drop everyone off after a long day’s work, Momma Ingrid didn’t go home to her sister’s vacant house. Geraldina, a woman in her early 30s (just like Momma Ingrid) who was in a similar position as her not two years ago – her teenage daughter Sandra had come to live with us until her mom could get back on her feet – will be voluntarily hosting Momma Ingrid (who she just met yesterday for the first time) in her home as an act of radical Christian hospitality to the downtrodden for love of God. 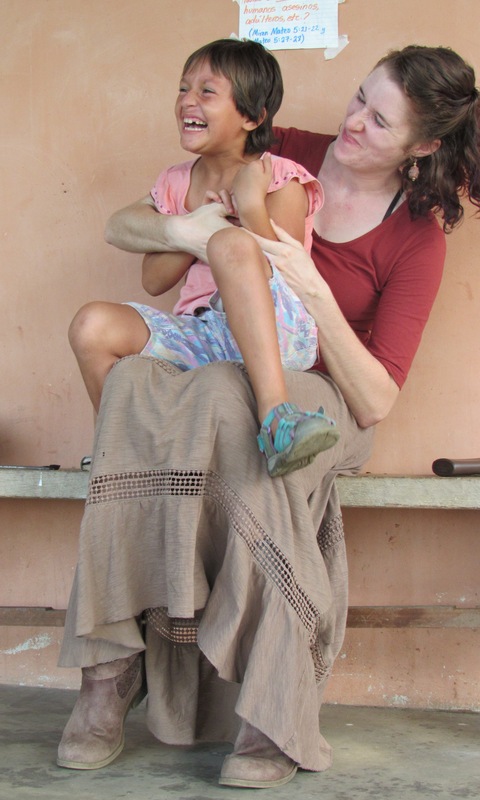 Yes, an illiterate single mom of four who has suffered hunger, abuse and rejection who now works with us full-time and is learning to read and write for the first time – who went against all cultural norms and left behind her abusive husband in order to get her daughter back and even build her own wooden home! – will be extending an arm of charity and love to a woman not so different from herself. Is it not the rich who help the poor, the powerful who help the weak? My jaw must have dropped down to the floorboard as I sputtered – “Wha–?” I was definitely not expecting her to say that. Goosebumps ran through my body even as they do now as I remember yesterday’s events and type this all down. Are not the poor – are not Sandra and her mom, Geraldina, people themselves who have known deep poverty their whole lives — to wallow in self-pity or look for some scheme to ‘pull themselves up by their bootstraps’? But – to forsake their own poverty (the thousands of legitimate excuses they could have to explain why they couldn’t possibly take Momma Ingrid in, especially as no one was asking them to do so!) and to extend a hand of loving hope – even receiving her in their own humble home! – yes, that is God’s work among us. 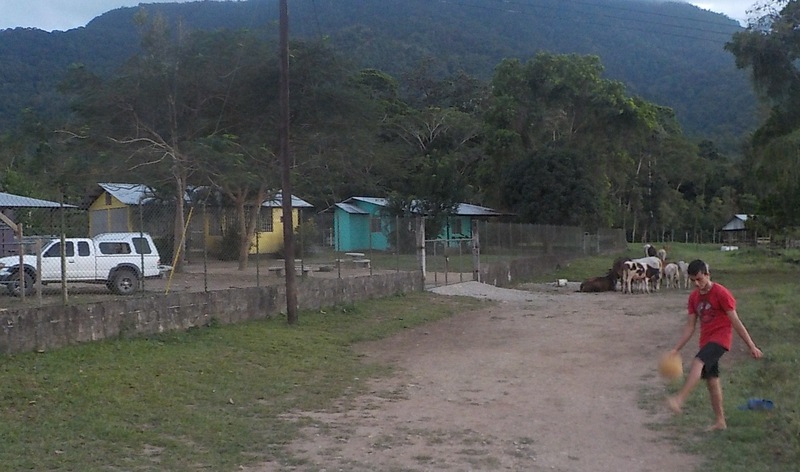 So, Momma Ingrid spent her fist night in Sandra and Geraldina’s home last night in our rural neighborhood, and we’ll be seeing her again tomorrow as she comes up for her second day of work. 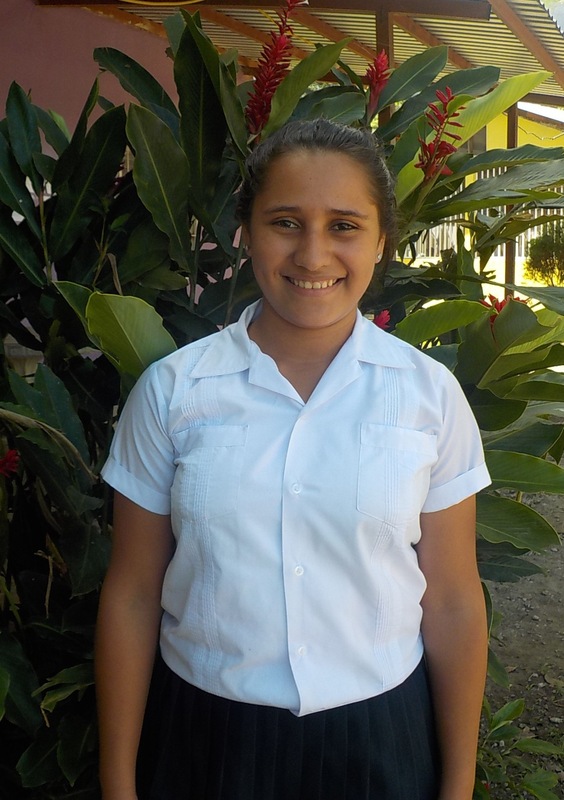 Please give thanks to God with us for Sandra and Geraldina’s walk of faith and obedience as they are receiving a woman they have no relation to into their home, and pray with us blessings of harmony, service and humble love among them as they figure out how to live together. God bless you. Yesterday as I was taking four of our foster children to the dentist in the city that lies about a half hour from our rural homestead, my phone rang. I breathed deep, knowing that the number of local children and teens who had already enrolled in these past few weeks had greatly surpassed any established limit we would have liked to set. A few days prior I had shuffled through all the enrollment papers in our office, assuming the sum total would be up around 50, about 10 or 15 more than last year. But my eyes grew wide as I saw that the count was 63. Considering our limited resources and experience, we decided to close the enrollment period. 63 students — almost all of whom come from devastating backgrounds — would be more than enough, seeing as we were facing almost double the amount of students we finished last year with in November. 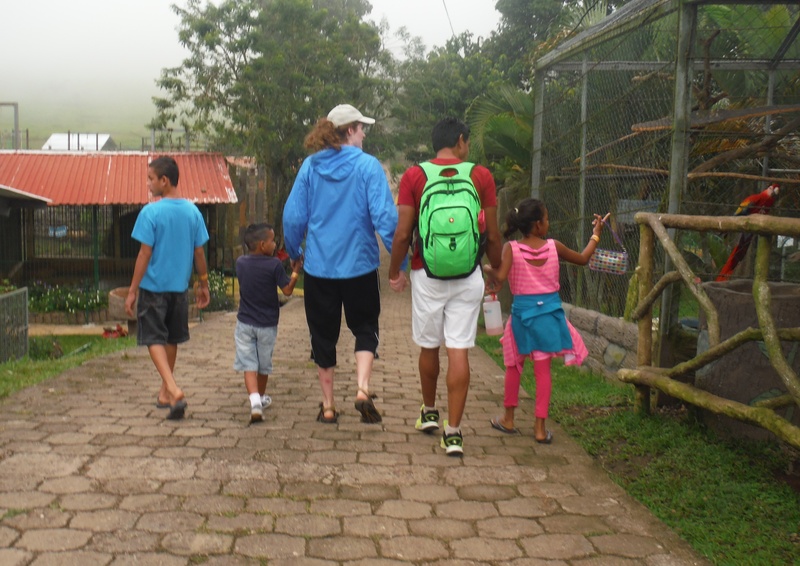 And then the next day three more local students arrived at our front gate and I felt God lead me to accept them (despite my own personal preferences). 66! Now Darwin is calling me about three more! 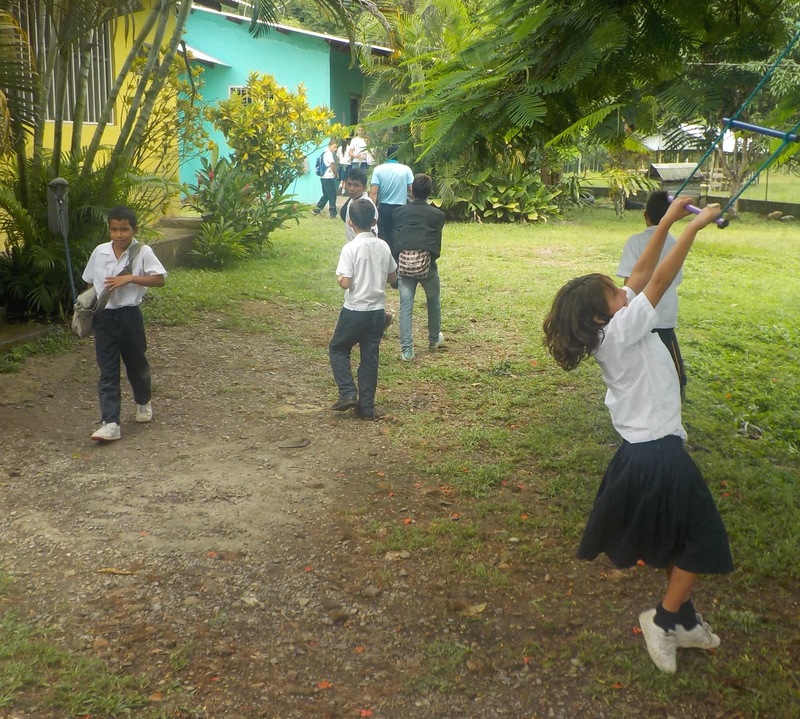 We’re getting close to 70, and we don’t have the tables, chairs or really the classroom space to comfortably have so many people running around our home! Help! Then there was a moment of silence over the phone as we both considered what this meant. 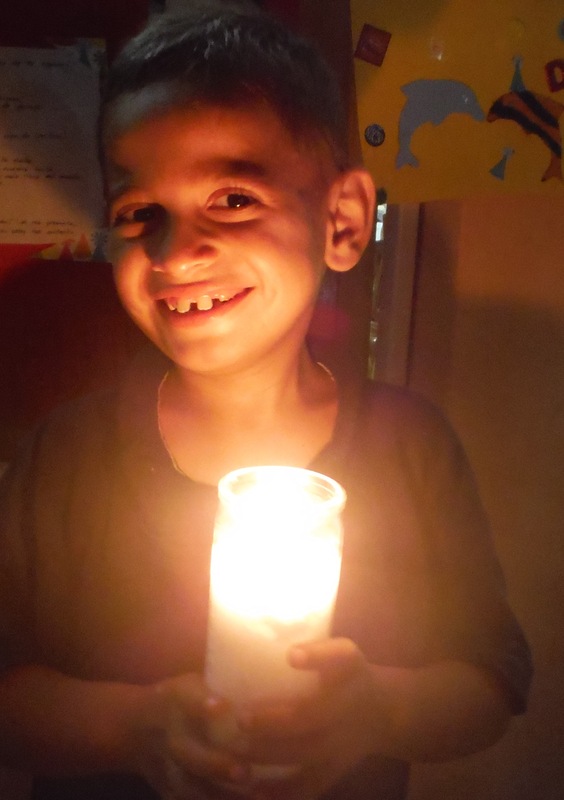 God has placed us in our rural neighborhood stricken by deep poverty and suffering for this exact purpose: to shine as Christ’s lights in the darkness and extend the love and mercy of God to this hurting corner of the world. If this disabled single father does not fit within the parameters of the mission the Lord has given us, then I’m not sure who does. Surely we must accept them. Even in the midst of my own fears and desire for control (and love of small numbers), I breathed deeply – a streak of excitement passing through my chest as I contemplated all the lost and broken people the Lord is entrusting us for healing, “Of course; bring them all in,” I answered over the phone as I zipped down the highway. That was the answer God had placed on both of our hearts. Teenagers – always more teenagers! The group of young people the Lord has sent us this year is turning out to be quite a ragtag bunch (and that’s just the way we want it). There are many private schools in our area who look for the best, most well-behaved students with good credentials and decent family backgrounds. Our search is just about the opposite: we look for and receive those on the farthest margins, those who are likely within a short distance of falling into gangs or becoming local vagabonds (if they aren’t already). This year we’re receiving a young man who is already in his early twenties who will be entering third grade with us and another third-grade student who is a teen on the cusp of 15 or 16 years old who is a notorious vagabond in our area with bright purple-died hair who has tried school several times but has thus far always dropped out. We have hope that this time God will give him the perseverance and grace to finish the year, and maybe even several more after that. 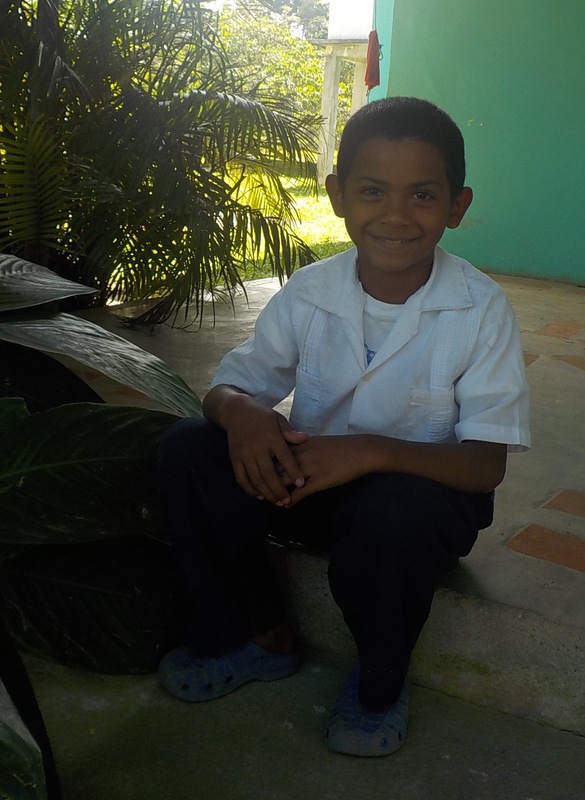 Another teen is entering who finished primary school five years ago and dropped out of school since then. 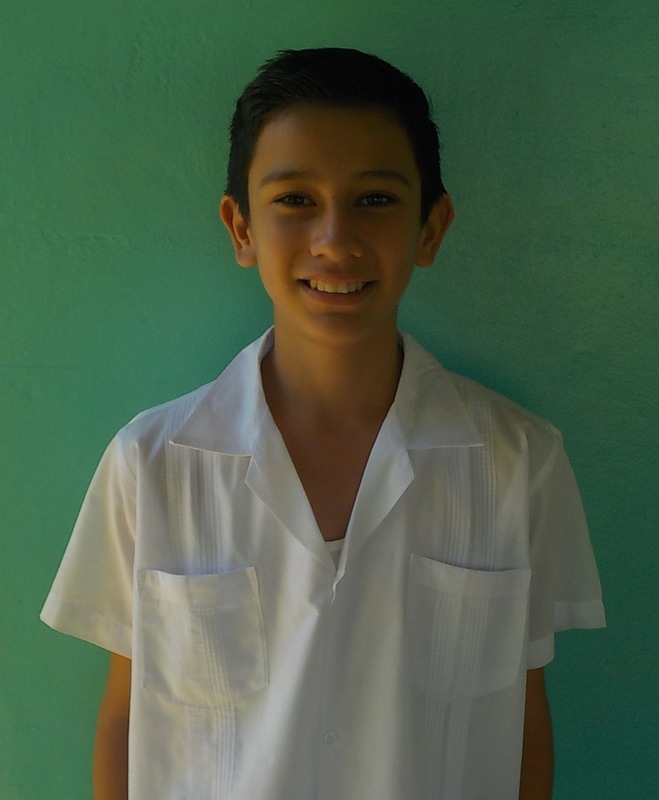 He’s now 16 and will be entering 7th grade with us. What made him want to enroll in a God-fearing community homeschool program that is heavy on discipline, love and truth when all that he’s been accustomed to is probably the opposite? Why not continue roaming our neighborhood aimlessly or simply enroll in the local public high school, where everything is easier and cheating/corruption are easily overlooked? 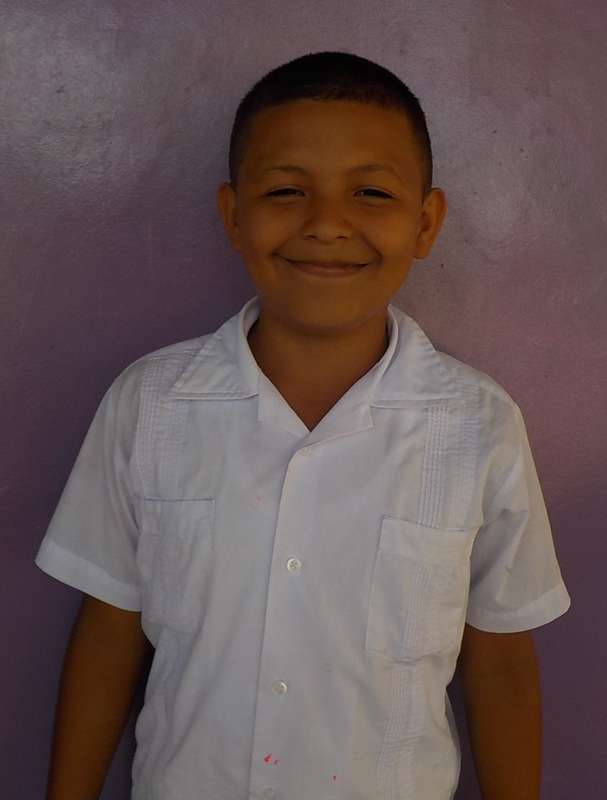 We have no idea, but we thank God that this young man and roughly 70 others will be willingly exposed to God’s Word and the truth of His love day after day under our guidance. 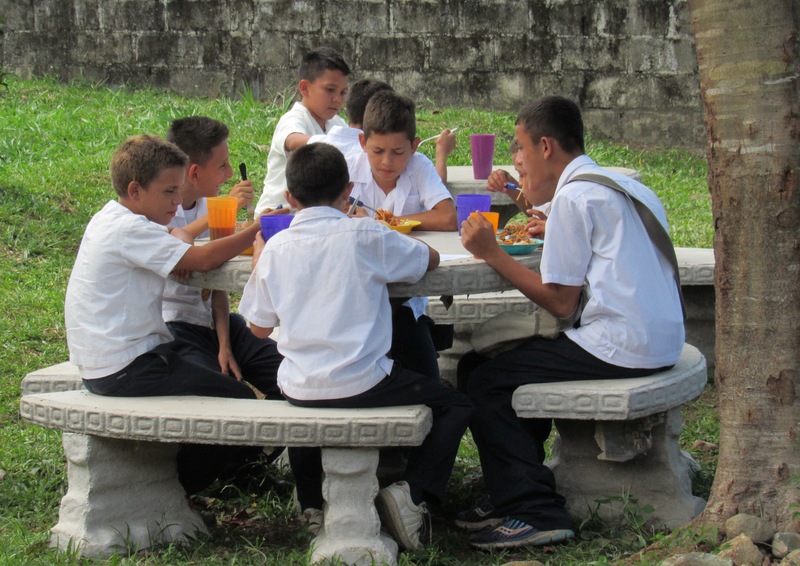 There are many other similar stories – many fatherless children and teens who will be entering our school where they will finally have loving, Christian adult males to lead them; many coming from malnutrition and deep poverty who physically look several years younger than they actually are; others who come from the public school system discouraged and rejected after years of trying to learn and failing. The Lord is creating a small, beautiful haven for misfits, and He will be the one to fortify this work, for He is the one who brought so many young people to us. I contemplated all this as I drove up the long gravel road to our home the other day. 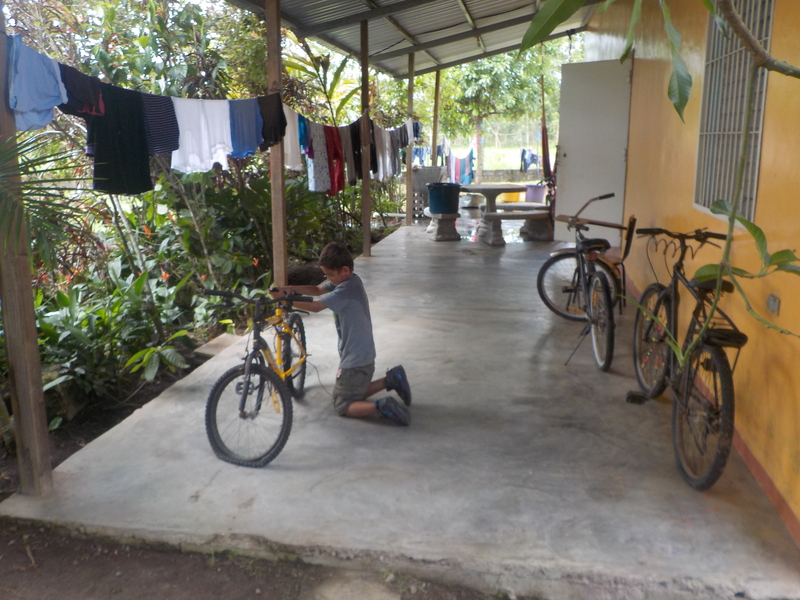 Crossing through our rural neighborhood I saw one of our new male students – a 15-year-old who will be entering 6th grade after having been a local vagabond for the past several years – meandering around the streets on his bike. I gave him a double-honk from inside our car to greet him, and then all of a sudden he changed course and began darting up the path in front of my old pickup truck as fast as he could. This particular young man has had quite a bit of contact with us this month, even coming up to our home to participate in our riotous P.E. 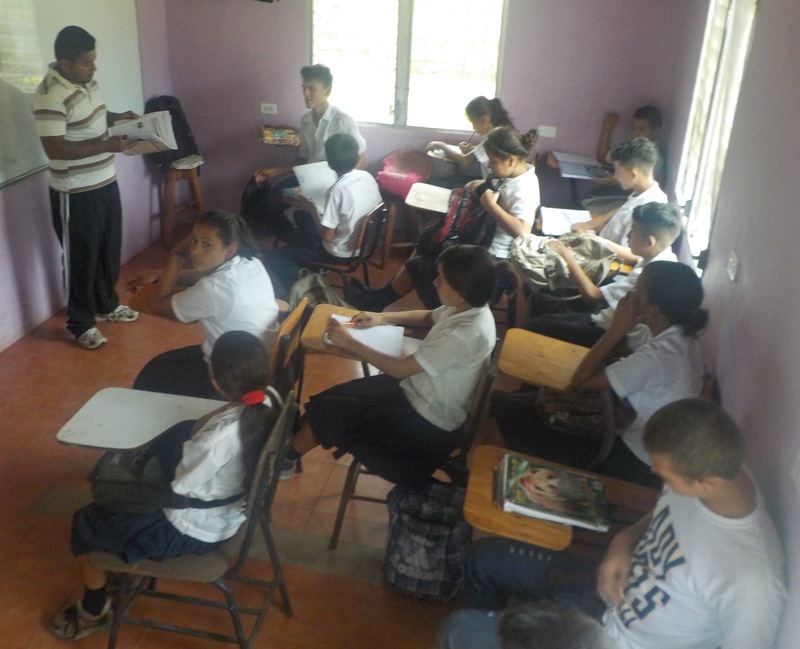 classes with our teachers (as in, our teachers are the students). Darwin had met him several months ago when he took our kids to a local field to play soccer, and he’s been developing a relationship with him ever since. I smiled and continued driving onward, me now following him as he began pedaling as fast as he could up the slighting inclined path to our home. The car continued to rumble along as he passed as quickly as he could over uneven terrain, rocks and puddles so as to keep his lead on me. Were we in a race? I didn’t think so. I had no idea what was happening, but I enjoyed the game and he seemed really intent on beating me to our gate. Making the last turn up to our property, our home and the majestic mountains just beyond now in full eyesight, the young man finally reached his destination, threw his bike to one side in one fluid motion and pulled open our front gate, panting and smiling big. Still panting, he informed me through my open window: “I wanted to come open the gate for you!” An enormous smile flooded the precious, soon-to-be ex-vagabond’s face. Chills ran through my body as I suddenly realized I was the recipient of a very extravagant display of friendship and favor. 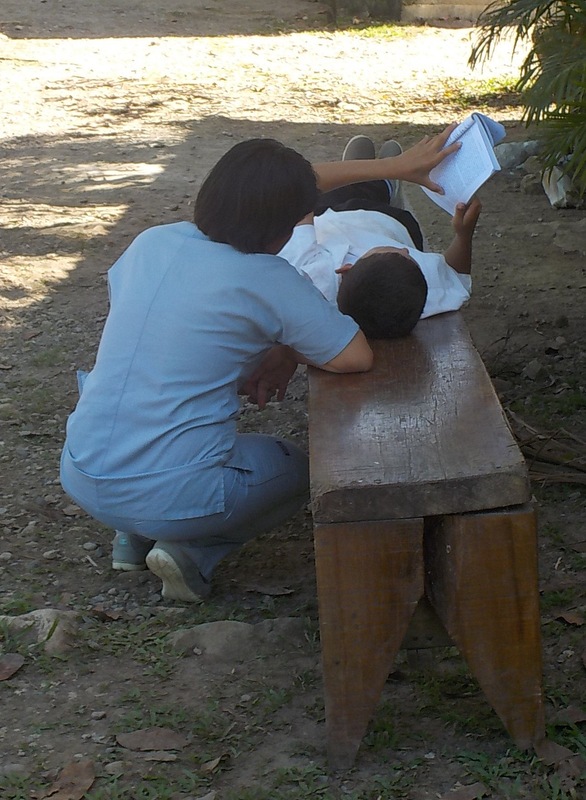 I immediately thanked God in my heart, feeling that the good work in this young man’s life had already begun, and that He used this simple boy to even touch my own heart with His love. I pulled all the way through the gate; he closed it behind me; and he was off. Mission accomplished! 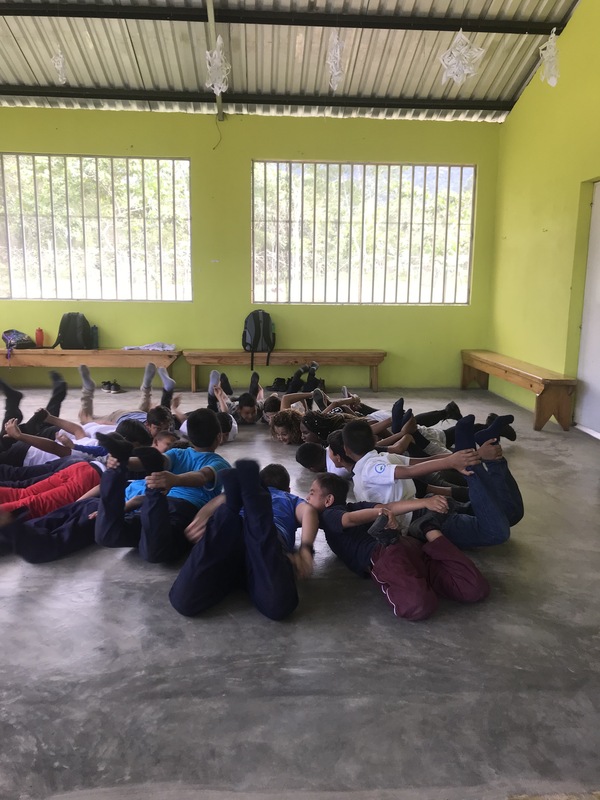 Many young boys in disadvantaged Honduran neighborhoods such as ours begin working with local gangs from about age 10 on, participating in horrible crimes and Satanic worship perhaps for lack of a better place to belong. 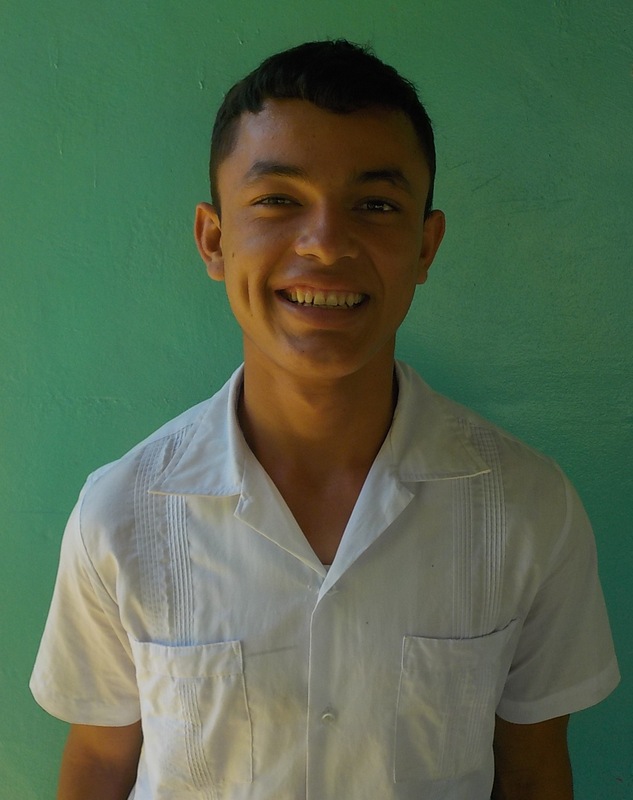 Our 16-year-old foster son Brayan (whom we are in the process of legally adopting), has commented to us several times that if God had not placed us in his path when he was 12 years old, he would probably belong to a gang by now or be dead. So, we thank God that he is bringing in the vagabonds and lost young men and women who very well may be within a yard of Hell, and we praise Him that He’s brining them home, bringing them to a knowledge and experience of God’s love for them through Christ. 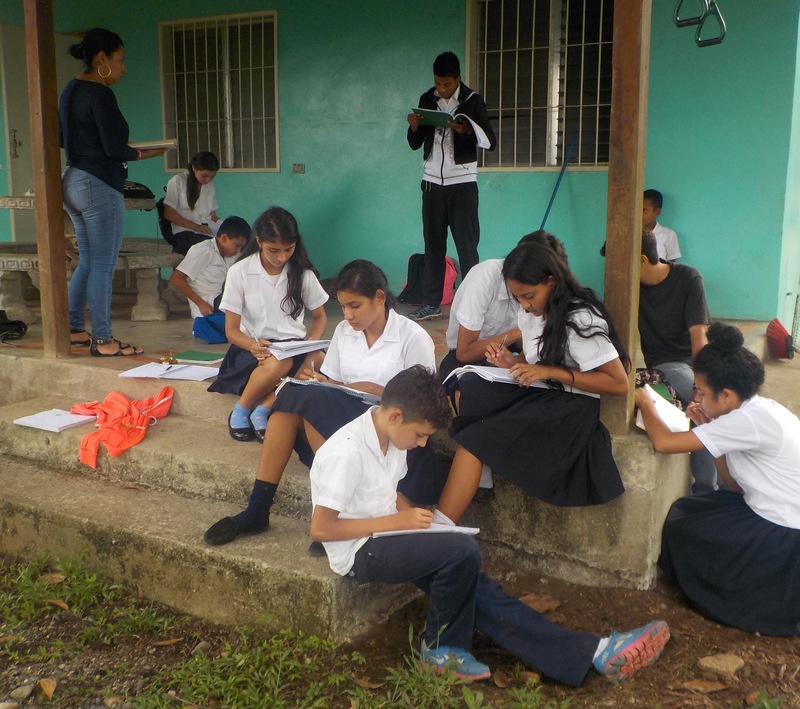 Please pray with us for this increasing group of children and teens whom the Lord has entrusted us as we are finishing off our preparations for the new year of discipleship and integral education that will begin Monday, February 5th. We are currently seeking your earnest prayers for spiritual and emotional renewal in our household with our 10 foster kids/teens ages 9-17. (This is probably going to turn out to be a somewhat disorganized post that is anything but eloquent). The last several weeks all of our kids have been on school vacation (which has allowed all of us much more family time where we’ve all been together with less distractions), and the Lord has allowed us to go through something akin to the “valley of the shadow of death” (I call it this because that is what it has felt like) with them as we’ve come up against unforeseen challenges, incorrect attitudes, and sin issues in our household one after the other, leaving us all quite broken and frazzled in the aftermath. This has all led to many times of sincere prayer, on-edge conflict mediations between various family members, occasions of asking forgiveness and of forgiving, intense times of counsel with our teens, and moments of various members of our household becoming emotionally undone (myself included). Seven of our ten kids are teenagers, and all of them come from extremely broken backgrounds. Parenting any teenager is a delicate task, but parenting 15- and 17-year-olds who come from dark places and who entered our lives on the cusp of puberty or several years already into their adolescence is not for the faint of heart. They want their privileges and freedoms as they are nearing adulthood, but they are still in the beginning stages of being trained in righteousness and have not yet proved they are trustworthy. (This power struggle creates much angst in our household). I am seeking earnest prayers as our household has been shaken several times over the past several weeks, and we are in need of genuine repentance and spiritual maturity for each one of our precious children as they grab hold of their identity as beloved sons and daughters of the Living God. There are always certain challenges and difficulties in our daily parenting endeavor in such a large, mixed household, but for some reason the last few weeks have been much harder than usual. All of this has left Darwin and me quite exhausted and a bit discouraged. Please pray also for me specifically, as these last few weeks have wrung me dry on all accounts, and I’m in need of encouragement and refreshment both relationally with other humans and on a spiritual level in my walk with Christ. I’ve gone walls-up with everyone around me after having been hurt so many times by our kids in these last few weeks, and due to emotional fatigue I feel as though I’ve just been going through the motions of each day, running from one activity to the next, just trying to stay afloat. Please pray that Christ might fully permeate my being and flood me with His peace so that I might be a useful instrument in His hands rather than merely a broken woman who runs around with her hair on fire all day until getting to her room at night and collapsing, exhausted and discouraged. Please pray that my heart might not be hardened and that my being might receive the light of Christ to cast away all darkness. 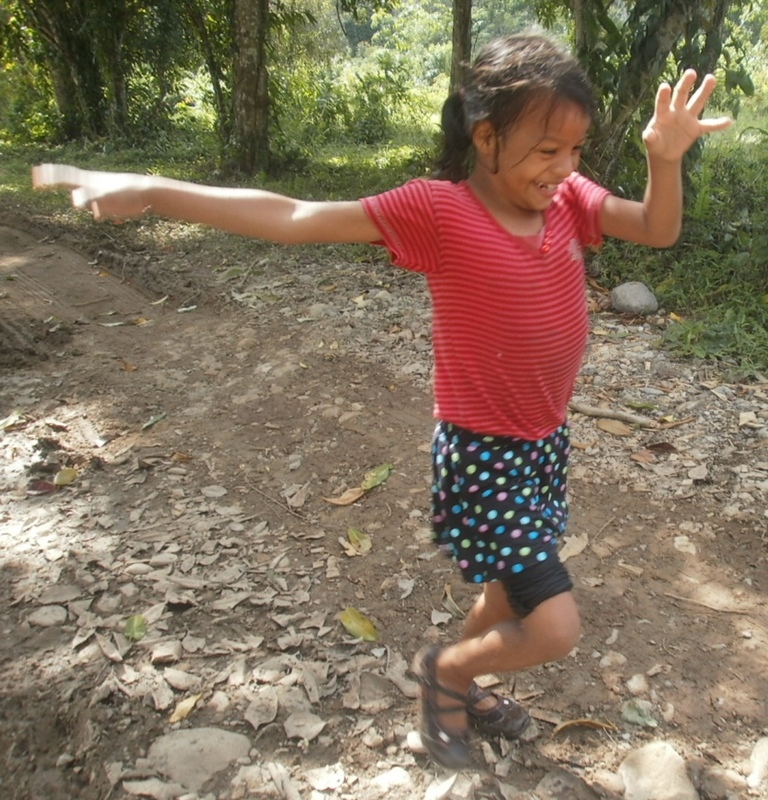 Thank you to all those who lift us up in prayer and support the Lord’s work through us in Honduras. May God bless you in this new year and fill you with His love. Thank you for considering our humble state before the Lord. 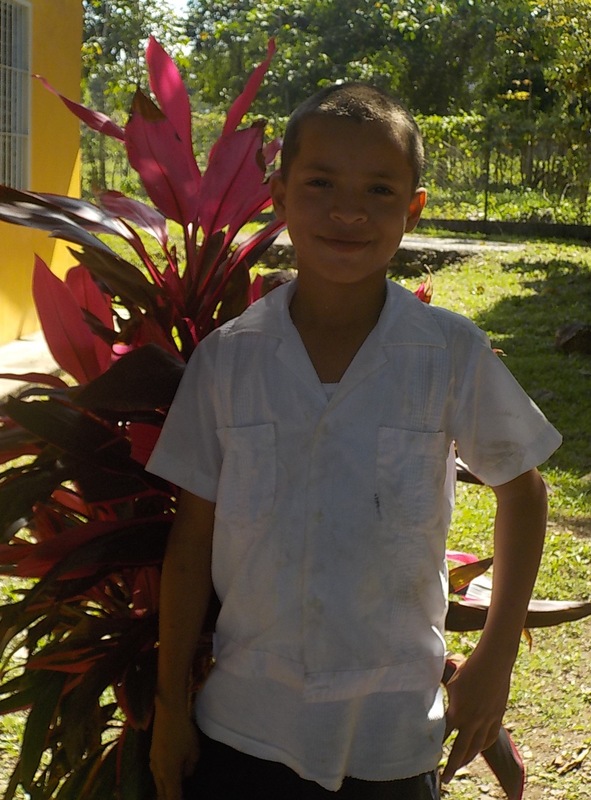 Below are our current prayer requests and triumph reports from our life of service with Christ in Honduras. Thank you for your interest in supporting/following this work. ***All of the photos on this post were taken by Isabel Dayton during her visit to the Living Waters Ranch a couple months ago. 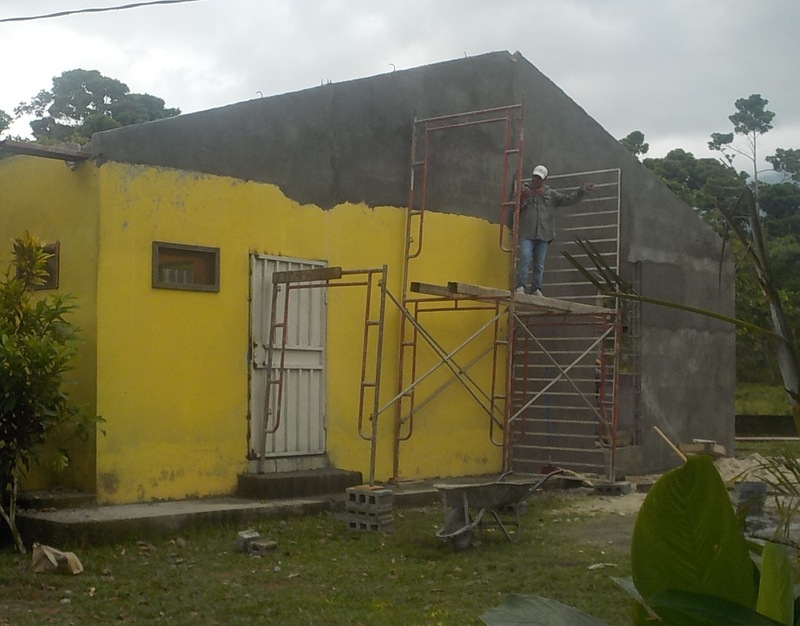 Even though the work at the ranch has continued onward in my absence and I’m in frequent touch with those in Honduras, we don’t have any new photos at this time. (I’ll try to take some once I’m back in the routine of service next week.) Thank you and God bless! 1. We are coming to the end of our second full school year of Spirit-led “discipleship-based community homeschool” with roughly 40 students who meet daily in our home (the Living Waters Ranch) for a complete homeschool curriculum that we’ve designed/tweaked over these last two years as God has led. 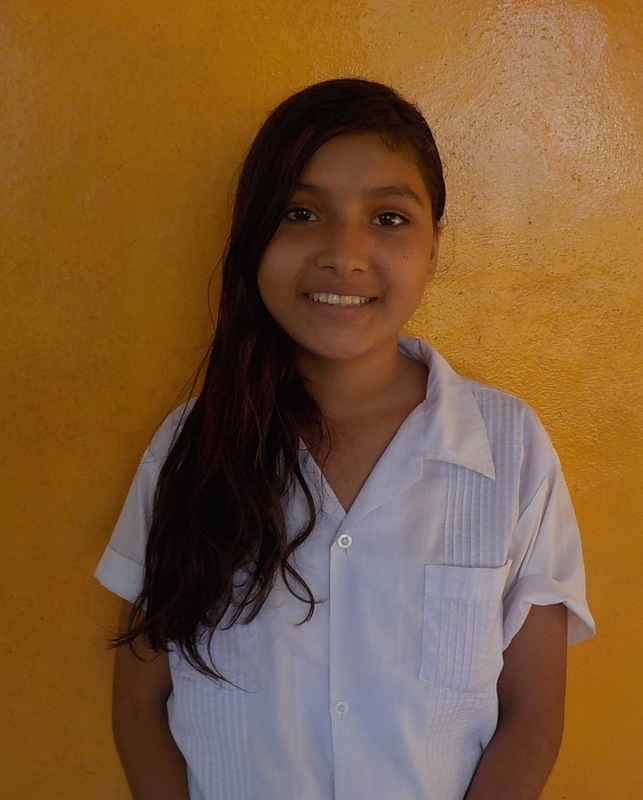 The Honduran school calendar runs from February — November, so we are nearing the end of school and are reflecting back on all that has happened this year. 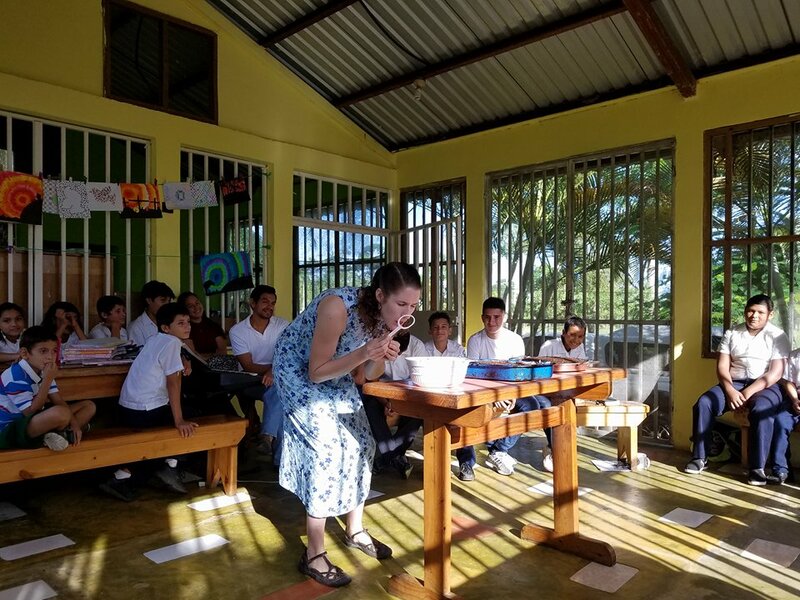 The Lord brought new key Honduran missionaries/teachers/pastors to our team; He brought additional students, all of whom come from very broken places; and we’ve all learned a lot (sometimes the hard way) and are actively drawing near to the Lord as we seek to walk alongside of the children/youth in our school in the Way of Christ. We simply give thanks to God for allowing us to participate on this great adventure and for the fact that many kids/teens are coming into a saving knowledge of Christ and are genuinely walking with Him. Nothing has been easy, but it has absolutely been worth it. Classes will wind down and come to a close in November, and then all of our teachers and students will reconvene in early January to begin prayerfully planning for the new school year. 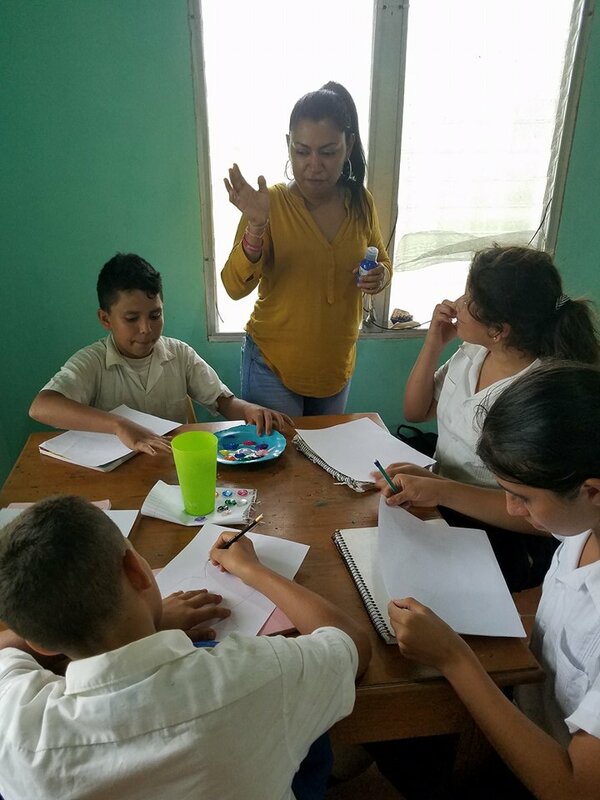 Please continue to pray for God’s protection and blessing over our community homeschool — the lives of all our students, that of our teachers, the physical protection of our property where we live and serve, etc — as Honduras is a very dangerous country. He has protected us until now, so we eagerly press onward. 2. We thank God for His continued provision over our lives, as we have lacked nothing in these 5+ years of serving Christ by faith in Honduras. We thank God for His miraculous provision (in every sense of the word — financial provision, His way of bringing each of our local teachers/missionaries to work alongside of us, His provision of believers who actively intercede for this mission, people who lend us their expertise, the wisdom and discernment He has provided when we have needed it most, etc) and stand in awe of His power made manifest in our little corner of the globe. Thanks be to God. 3. We are currently facing several potential complications/frustrations in regards to the process of legally adopting 4 of the 8 children my husband and I are fostering. We have had to switch lawyers and are having to re-submit much of our paperwork, so please pray first and foremost that this process (which tends to put our nerves on end, especially as we are coming into close contact with a third-world government that suffers from great corruption, inefficacy, etc) would bring us great joy rather than stress, as we are earnestly convinced that God wants us to be family forever to our kids, and that makes the legal hassles and uncertainties worth it. 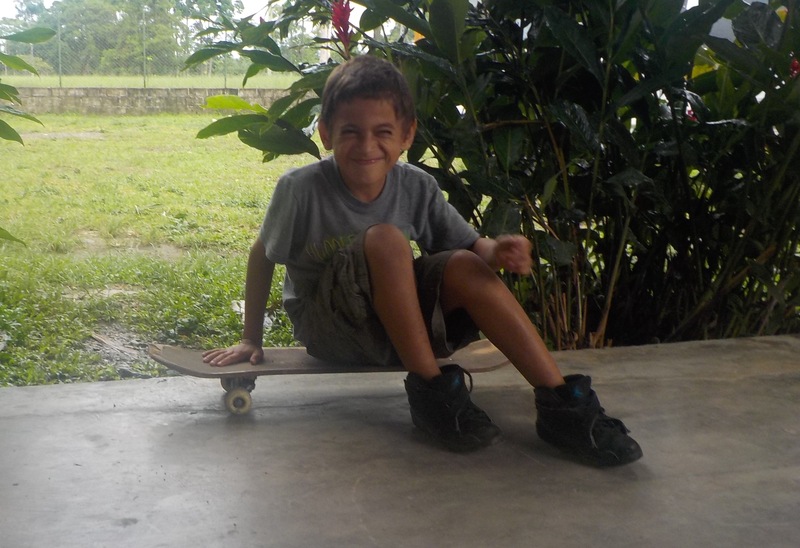 Please pray that the government may have favor upon us, that everything would be expedited as much as possible, and that all monetary costs involved in the adoption would be provided for (as all of our needs are). Thank you. 4. 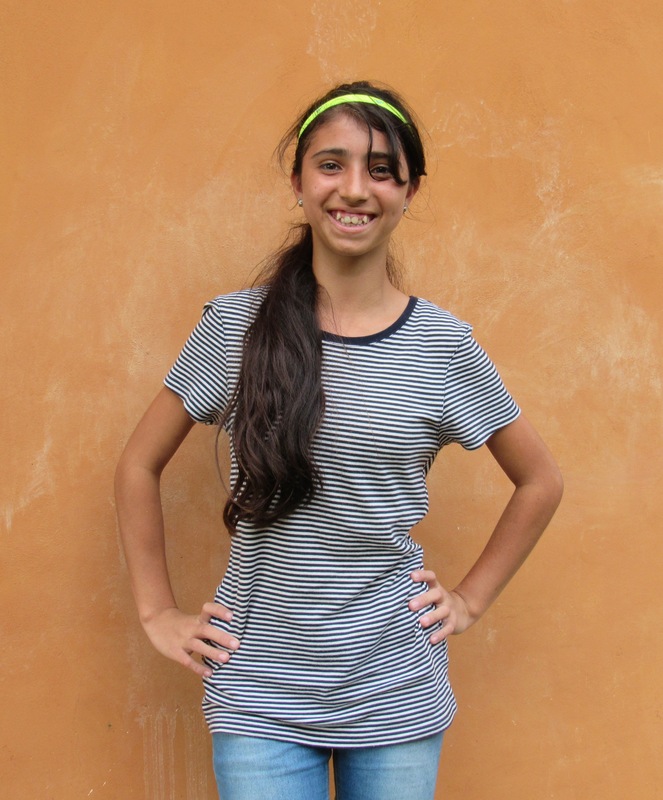 I will give a quick update in regards to 12-year-old Josselyn, one of the young women who has formed part of our family since July 2015 and for whom many of you had been praying in months prior. She had gone through a very rough season earlier this year as she even ran away from our home twice in search of her biological family (where she had been sexually abused and generally neglected), thus I had solicited urgent prayer on her behalf. She continues to live with us to this day, and she has not run away again (or even threatened to do so) in these last several months. She and her little sister Gabriela (Gaby) are currently in a season of monthly monitored visits with their biological family members, and thus far we have been able to maintain a respectful relationship and kind with them, so we thank God for this emotional stability in Josselyn’s life as she has accepted that her home (at least for now) is with us, and we ask God’s continued blessing and guidance over these monthly family visits. 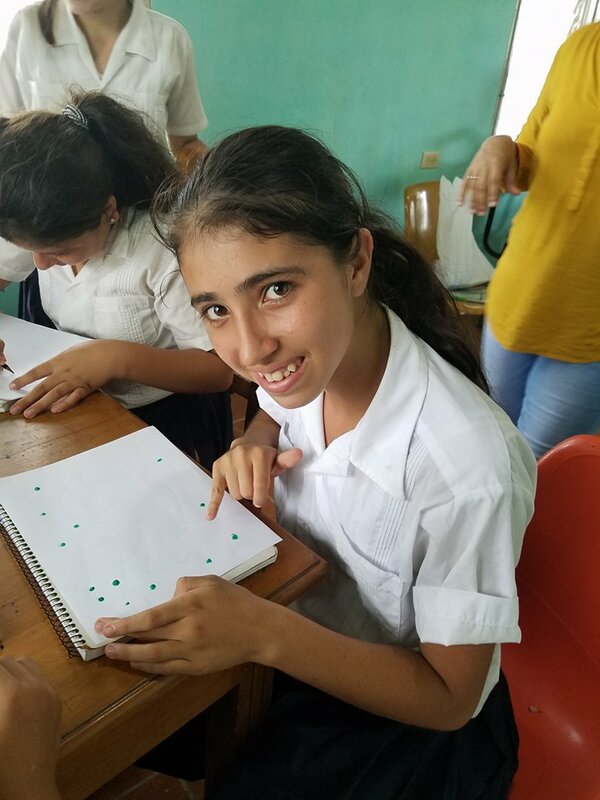 We are unable to adopt these two girls because their biological family is still closely involved, so we simply ask that each day the Lord would accompany us as we seek to parent and love them without holding on too tightly or feeling threatened by their biological family. Our payer is that the peace of Christ reign in our relationship with our 2 girls and their biological family members, and that God’s will be freely done. Amen. 5. 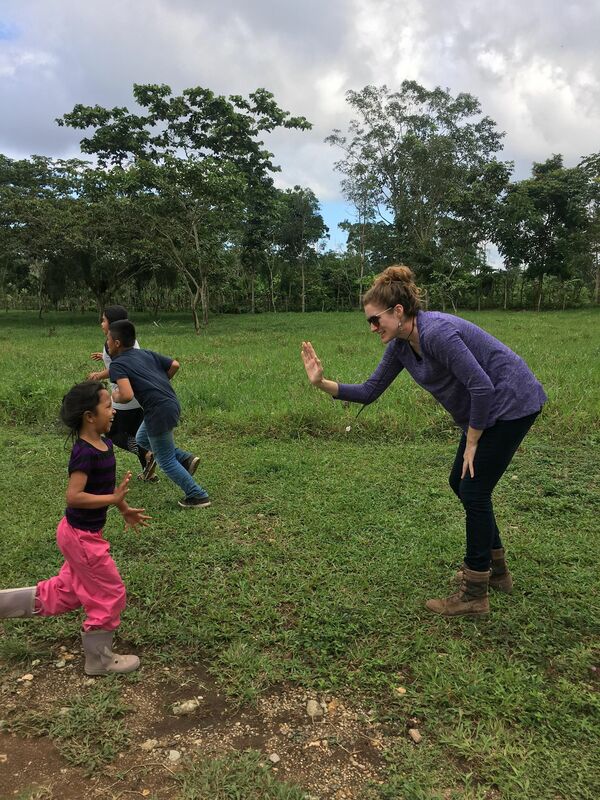 Lastly, as many were informed, I had come back to the States for roughly five-and-a-half weeks in August/September for emergency medical, spiritual and emotional intervention as I had reached a breaking point in Honduras and could not go on without receiving help. I had been struggling with debilitating insomnia for several years and, as a result, had contracted any and all viruses, tropical fevers, etc, one right after another and was spending more time in bed receiving shots/IVs/antibiotics than I was participating in our daily life of service, so I accepted my parents’ offer at help and came back to San Antonio, TX in search of healing. I’ve written about this journey in greater detail in the prior post, so you may click on it if you would like to know more about my healing journey. 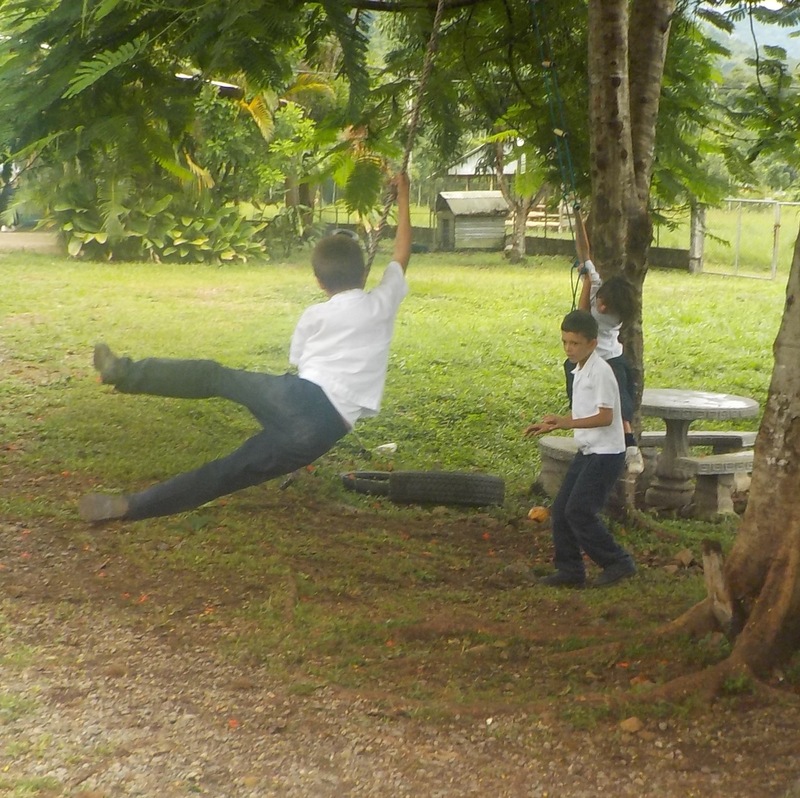 I will be heading home to Honduras in three days. Please continue to pray for my ongoing recovery so that I may be as healthy of an instrument as possible in God’s hands, and let us thank Him for fully orchestrating my visit to San Antonio, my diagnosis, several breakthroughs I experienced, provision to cover medical costs, etc. Thank you. I could probably list many more prayer requests and triumphs, but I will leave it at that for now. If you or anyone you know is not currently receiving our periodic printed newsletter and would like to receive it (it contains photos, testimonies/stories, etc, very similar to this blog), please send me via email that person’s name and physical mailing address so that they may be included on the mailing list. Thank you again for partnering with us in this amazing Kingdom work; God bless you. This is the third update I’m writing in regards to my search for healing from the chronic insomnia that I’ve struggled with for many years (which had then led me to all kinds of viruses, tropical fevers, etc, all of which sort of snowballed and caused me to get weaker and weaker, always awake the majority of nights and struggling through exhaustion on top of sickness. ) As one friend who met to pray with me a few weeks ago mentioned with a dry laugh, “You’ve been on a steady diet of IVs and antibiotics these last few years…” Thus, I came to Texas for a few weeks to seek out healing in every realm — spirit, mind and body — as I had reached a breaking point. 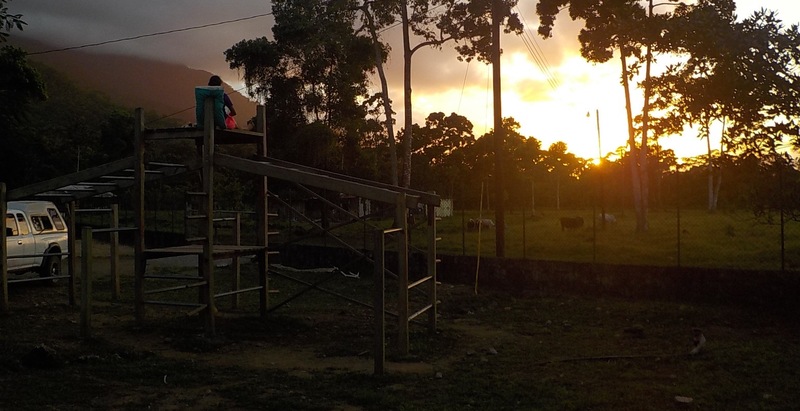 I was scheduled to return to Honduras today after having been in Texas since August 20th, but several days ago I decided to push my return flight back a week so that I may have a few additional days of rest as my body is still far from full strength. Thus I will be returning to Darwin, our kids, teaching, etc, next Friday (September 29th). During the past week-and-a-half or so, all of the diagnostic tests (many, many bloodwork panels, stool cultures, saliva and urine samples, etc) finally came back with their results, and we’ve been able to find out several underlying issues that have been contributing to my insomnia and low-immune battle over these last several years. I will explain: according to all the testing we’ve done, I have Hashimoto’s autoimmune disease (a thyroid disorder in which the thyroid gland, which controls many important functions in the body, attacks itself), a rampant fungal and yeast infection inside of my whole body (called Candida, which oftentimes begins when you take too many antibiotics, thus killing off the good bacteria in your gut and letting the bad bacteria run wild), sleep apnea, and a couple general disorders in which my body has not properly processed zinc and b-vitamins, which has led to a state of almost constant stress and anxiousness. Many of these things sort of ‘go together’ and affect one another, and all of them have been proven to cause insomnia, anxiety, high physical stress, low immune function, etc. I had even been having a lot of heart pain and difficulty breathing, and I discovered that that can also be attributed to the aforementioned disorders/problems. At least on the physical front, I am very thankful that we finally have these diagnoses and that I’m on a very rigorous treatment plan (including a general detox, high-quality supplements, Thyroid medication, immune support, a strict diet, etc) to begin healing. All of this was discovered in the last week-and-a-half, so I’ve been following the regimen religiously, although it will probably take 2-3 months or so for everything to really get in my system so that I can begin noticing significant changes in the way I feel. My body has been so out-of-whack for so long that the physical healing process will not be an overnight phenomenon (although I would like it to be). In the meantime my doctors have prescribed me various heavy-duty sleep aids to help “knock me out” at night, but the pills have had little to no effect on my sleeping and have caused many weird side effects, so I’ve vowed to no longer take them but rather wait patiently upon the Lord for my integral healing while I continue following the long-term plan to correct the aforementioned disorders/stresses my body has been facing. The Lord continues to bring several people alongside of me to pray for my healing, and — as I mentioned in the prior update — I feel that spiritually and emotionally I’ve had many breakthroughs and am being granted ‘new sight’ to see things the way Christ sees them, as I had prior been fighting against a lot of pessimism, self-condemnation, fear, etc. This aspect of my healing has been fascinating, at times two-steps-forward-then-one-step-back, and encouraging. 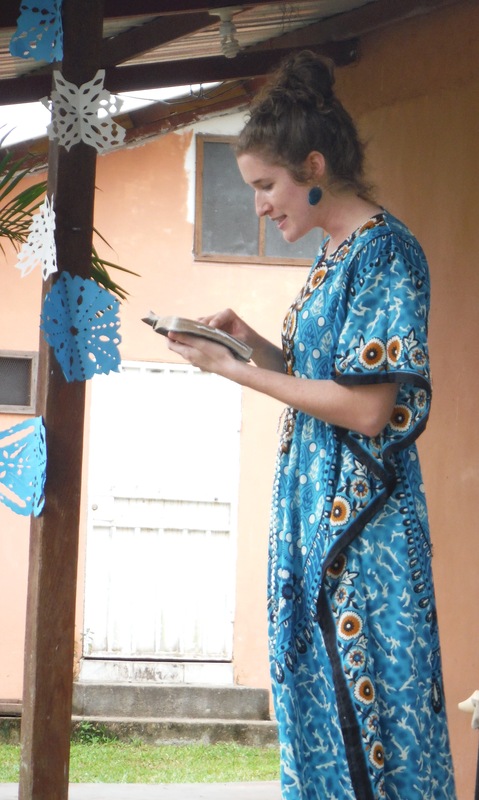 I am so excited to return home to Darwin and our life in Honduras with renewed passion and faith as God ushers me into a new chapter with renewed outlook. More than anything, I believe this trip to the States has been about God reminding me what He’s already done. He really has been with us. Darwin and I are in communication almost daily by phone, and he’s been able to share with me that the Lord is doing a big work in his own heart during this time as he is being convicted and set free from many negative thinking pattens, pessimism, fears, etc. It is very neat to see that even though Darwin cannot be here with me, the Lord is doing a very similar work in both of our hearts as He prepares us to be reunited next week. I believe these changes the Lord is doing deep down in our hearts will greatly affect (in a positive way) our children’s lives and our hidden life with Christ at the foothills of the mountains long-term. The Apostle Paul said, “Whatever is true, whatever is noble, whatever is right, whatever is pure, whatever is lovely, whatever is admirable—if anything is excellent or praiseworthy—think about such things…And the God of peace will be with you.” However many times I had read that before, now for the first time I am actually learning to live in such a way, even if sleep still eludes me for now. Darwin and I have been through some hard hits and difficult learning experiences in these last few years together (Darwin’s kidnapping last year, many trials with our 8 children who all come from severely broken backgrounds, many robberies, a young marriage, my ongoing insomnia, etc) and in many ways we fell too often in the trap of worry, stress, wanting to try to control that which was out of our control, etc — in few words, we were basically not thinking about that which is noble, right and pure (we were not fully trusting and resting in God). So, we earnestly thank God that He is making this shift deep down in each of our hearts as He is drawing us nearer to Himself and releasing us from our fears, doubts and anxieties (however invisible this process still is on the outside). With time we hope it will bear great fruit for God’s glory. 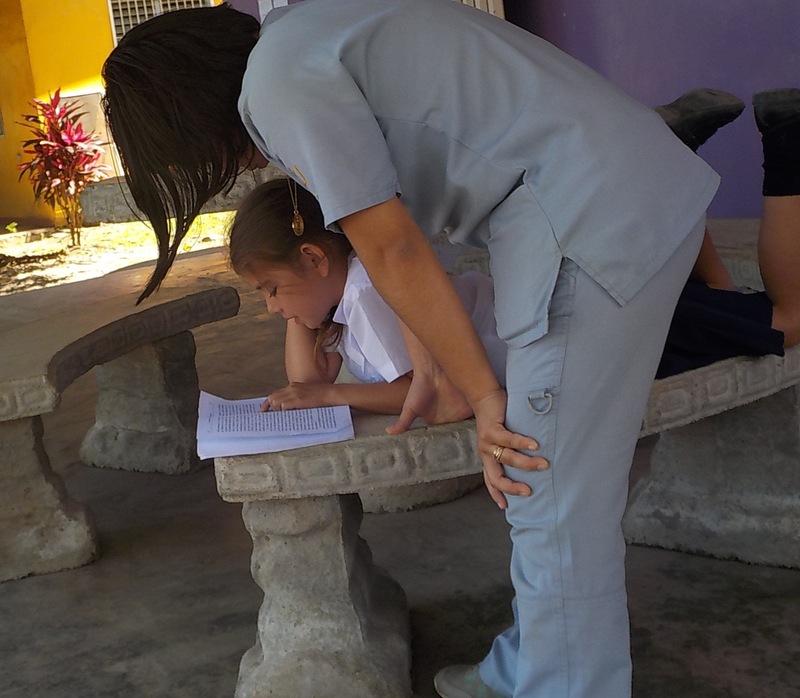 As for everything in Honduras, our children are okay, our animals (cows, guard dogs, kitchen cats) are alive, and the daily outreach to disciple and teach our neighbors through our community homeschool program continues onward. 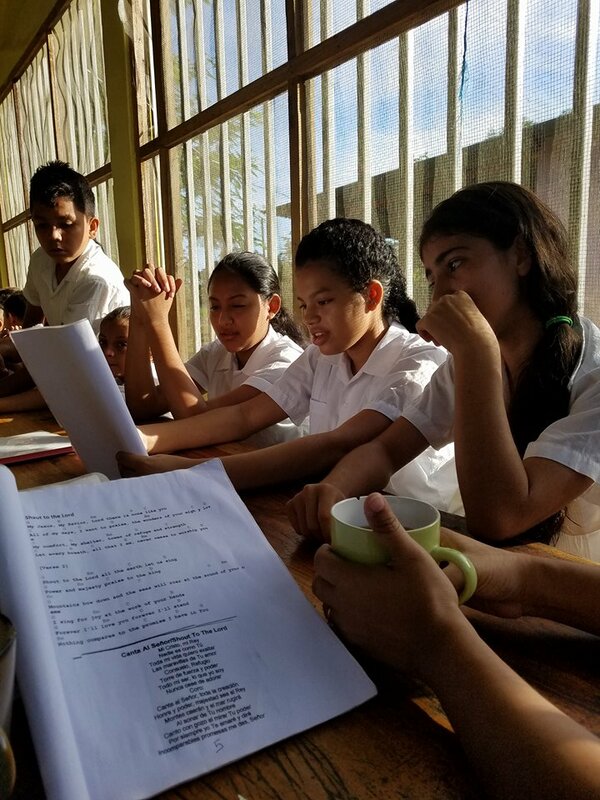 I’ve been able to send a few long letters down to them to be read aloud during their group Bible study time when everyone (teachers, students, etc) is together in our dining room on Tuesdays/Thursdays. These letters have been a blessing and have provided encouragement both to me and to those who’ve read them as we maintain communication and love from afar, always encouraging one another in Christ. 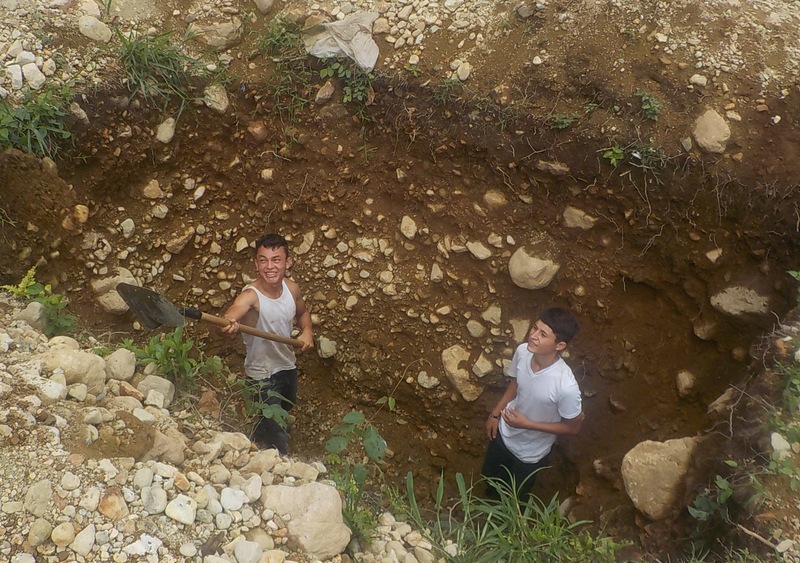 As I mentioned in the previous post, the local Hondurans who labor alongside of us are pulling double-time to cover many of my duties and support Darwin in his single-parenting venture of our 8 wily (I mean ‘well-behaved’) children, so that has been a huge blessing. Really there have been no big hiccups, and they’ve even begun implementing several small changes/adjustments to the daily routines as the Lord leads. 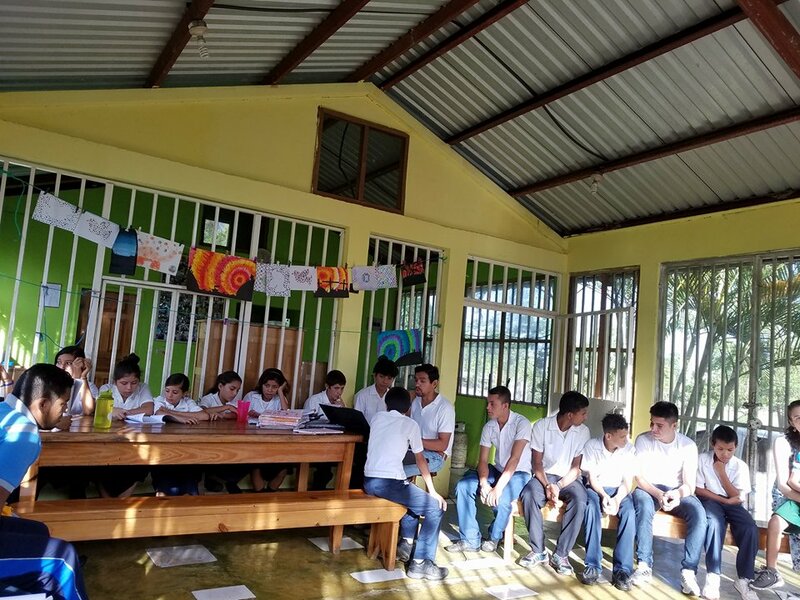 Yesterday all 40 students plus the teachers had an extended prayer and Bible study time in the morning and entered math class late because God had led them in another direction. Amen! So, I will be returning home next Friday — fully knowing that the true healing process will be worked out over the months to come. I would like to sincerely thank those of you who have been praying for us and supporting us in various ways. God bless you. Today I whipped out my camera and went undercover (well, not quite) into each classroom throughout the day to capture what a typical Friday at the Living Waters Ranch looks like. The only classes missing from my visual log are Darwin’s girls’ choir class, my advanced math after-school tutoring and Erick’s “Men of Honor” discipleship group. 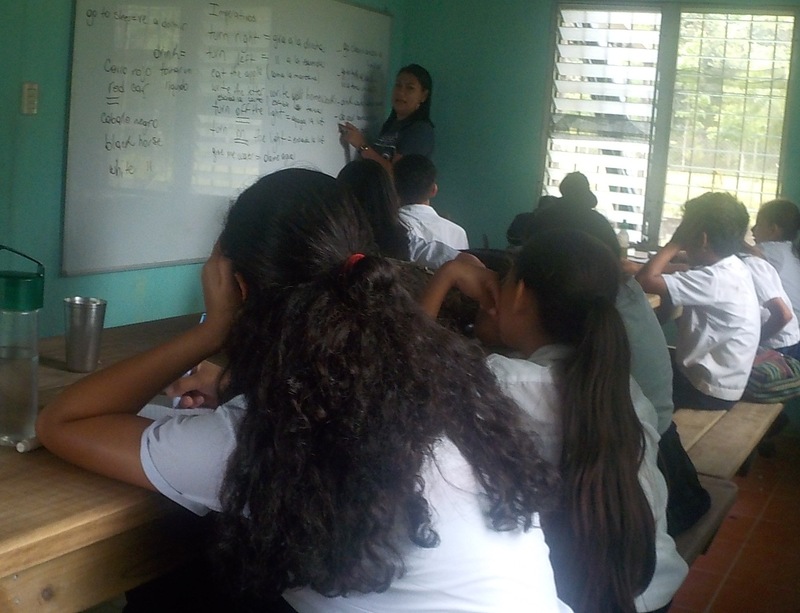 My first stop was Miss Ligia’s small 7th grade class. 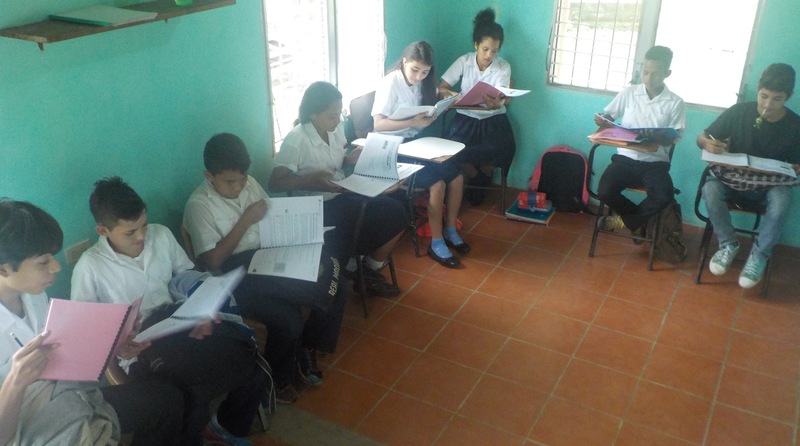 Our daughter Jackeline and her classmates were taking an exam! 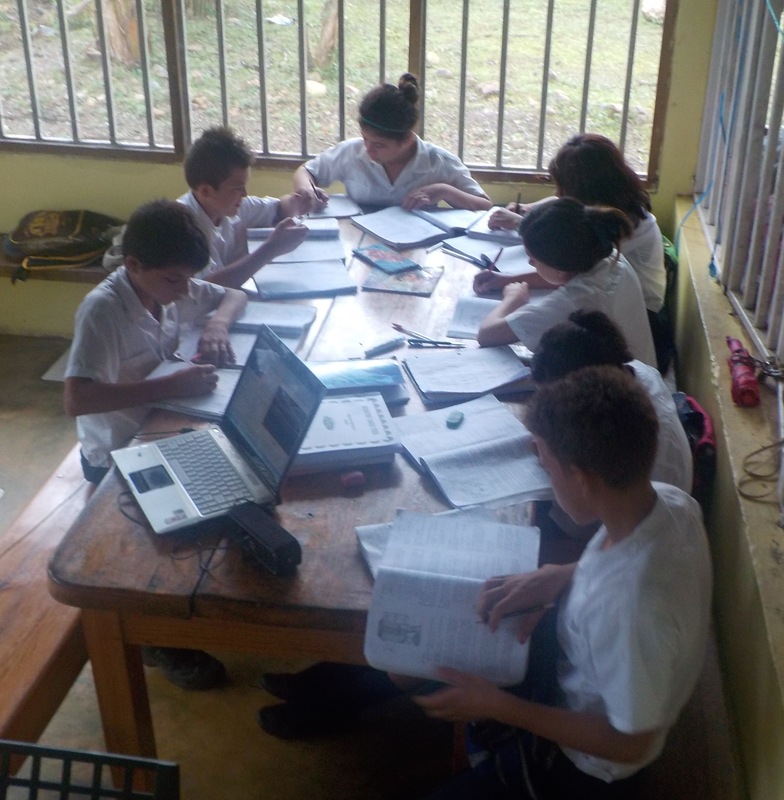 Here are Darwin’s fifth-graders hard at work at our dining table. 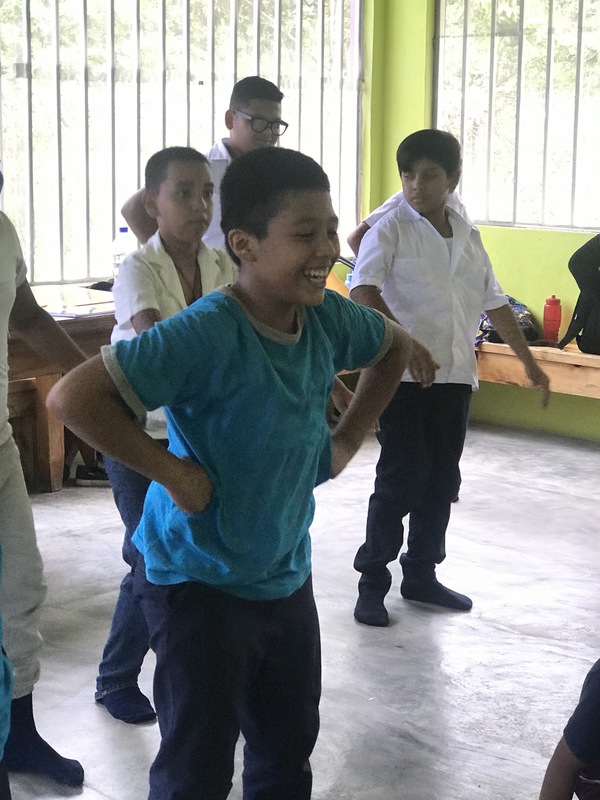 Erick’s first class of the day was with our rag-tag group of first and second graders, the majority of whom are overcoming learning disabilities and developmental delays. 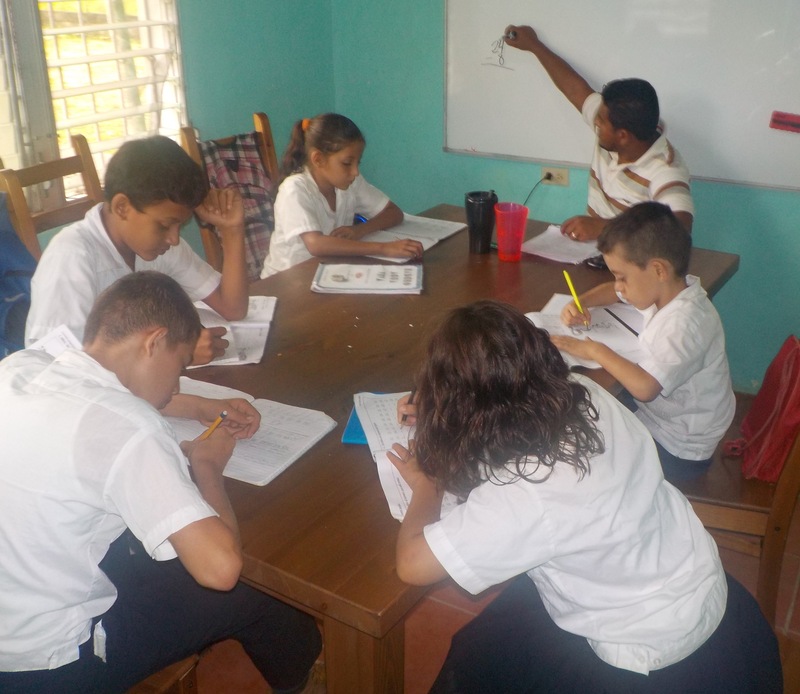 When I arrived at Miss Isis’ combined third-fourth grade class, I found our 10-year-old son Jason teaching our two developmentally behind third graders (the two boys sitting down, both age 11). Way to go, Jason! 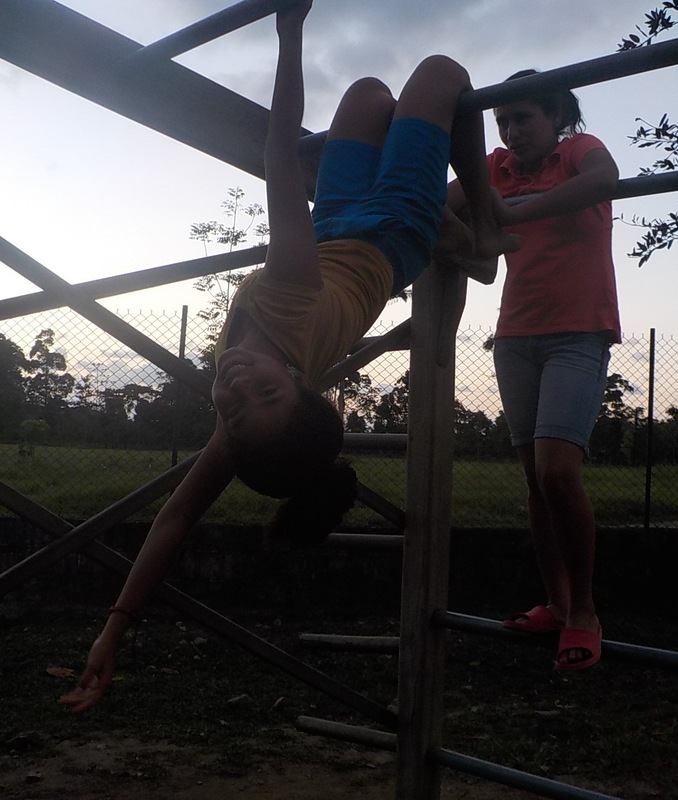 This is Miss Isis with Paola, one of our night watchman’s children who has been in school with us since 2015. 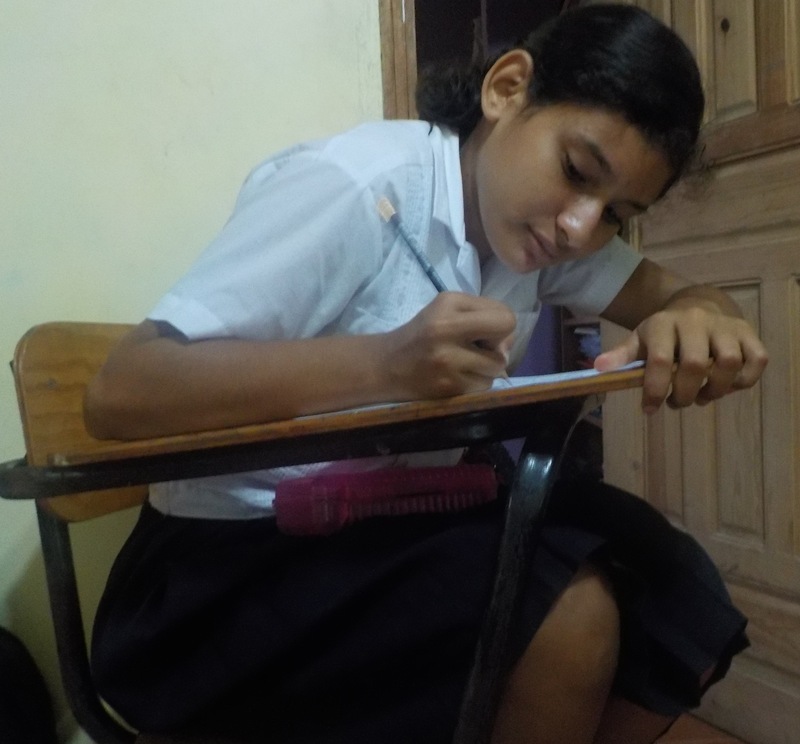 She and her four siblings are some of the first in their family to learn to read and write. 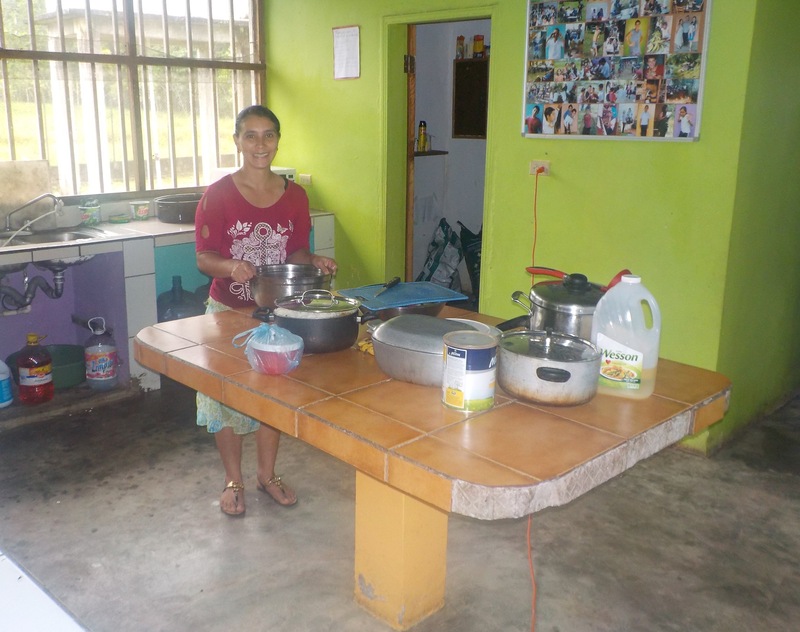 Geraldina (Sandra’s mom) was hard at work in the kitchen preparing lunch for 50 people! Thankfully the water hadn’t gone out, as it occasionally does! 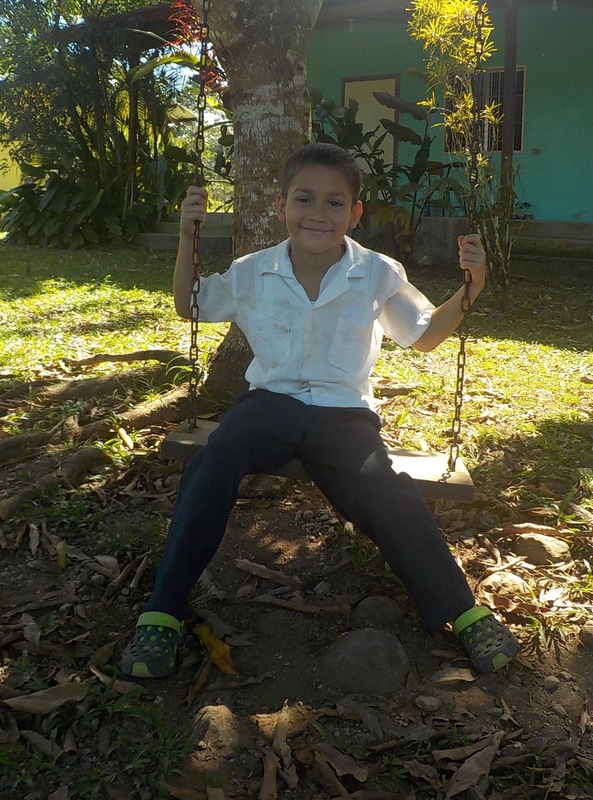 After visiting all the classrooms during the morning hours, little Josue and I went for a short walk around our rural property. This is the view of the Living Waters Ranch from the front gate. This is our growing herd of milking cows! We started with two cows a few years ago and now we’re up to 12! We invested in the purchase of six young cows a couple weeks ago as we seek to expand our herd, thus wisely utilizing the large grassy property where we serve. 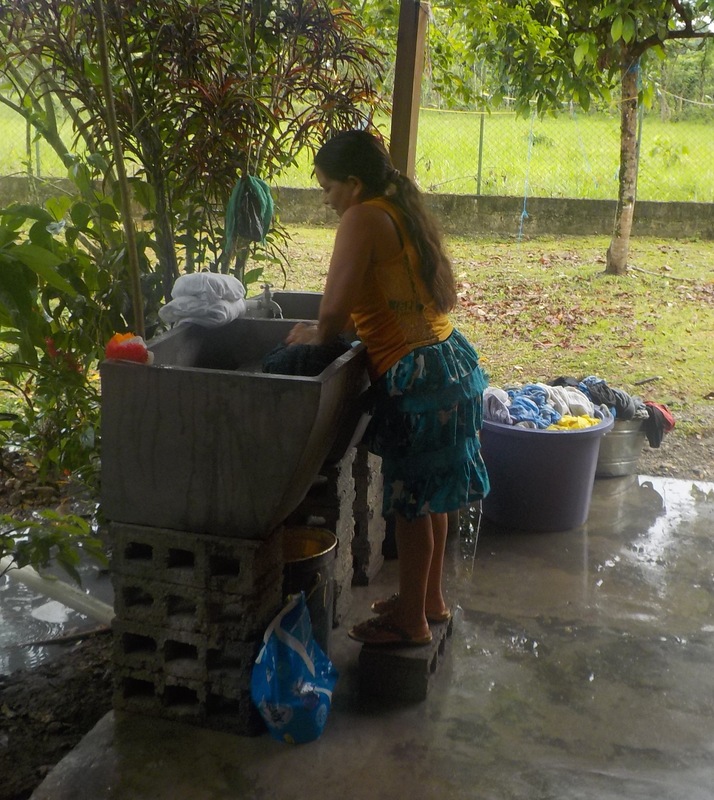 This is Carminda, our watchman’s wife, washing the clothes. One day per week our 8 foster kids and I wash, and one day per week she comes to help us wash. Everything is by hand! Is it already recess time? 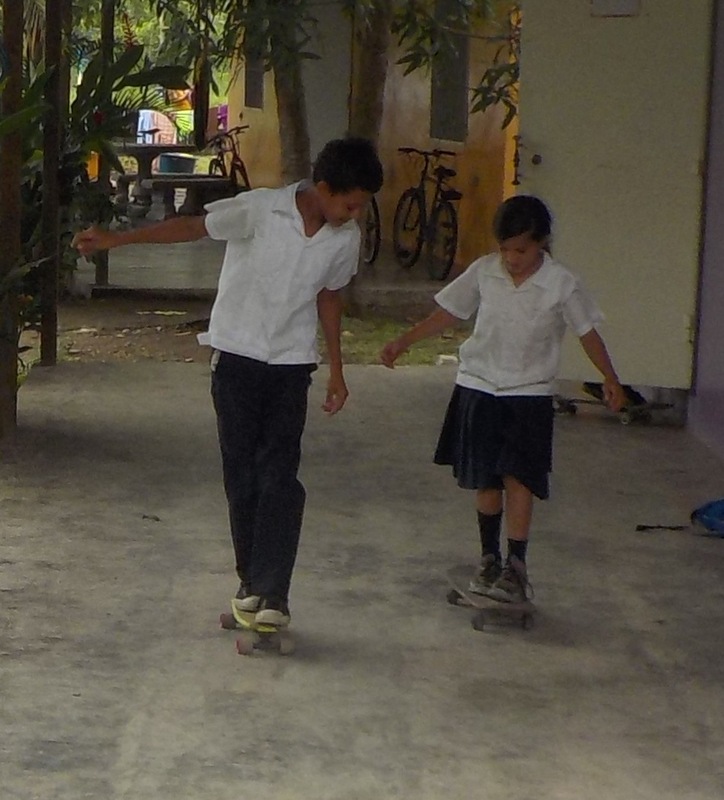 Here is a lively skateboard competition between our son Jason and a local girl. They got nervous when I started taking pictures! We have more male students than females, but the few girls we do have are tough as nails. You go, girl! Dangling from thin air on the left are two girls swinging from our tree rope! 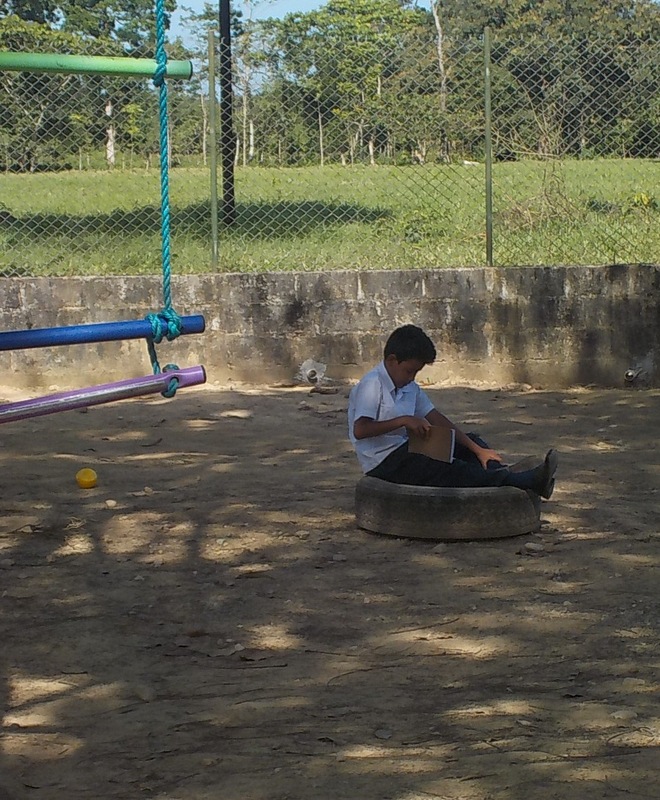 Recess is so much fun! Now it’s little Lester’s turn! Our office looks like quite the library! 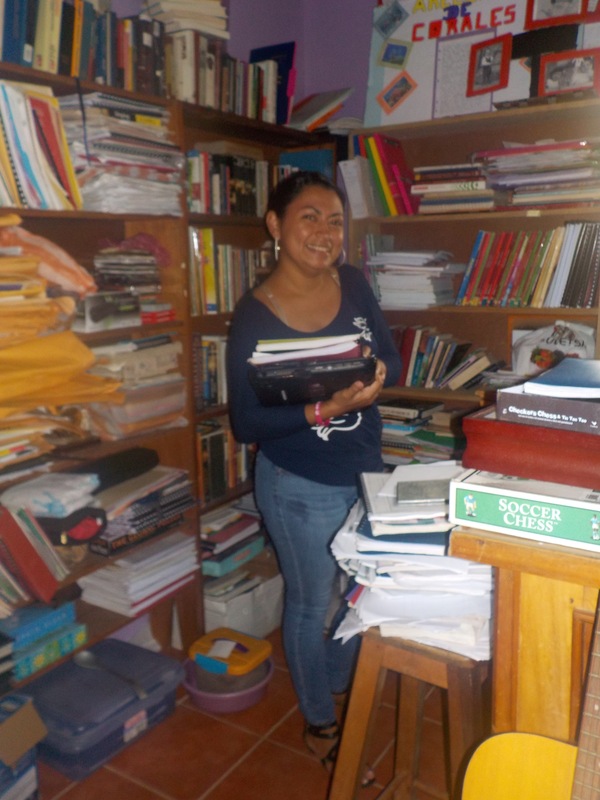 Miss Ligia is getting her books ready for her Level 2 English class! 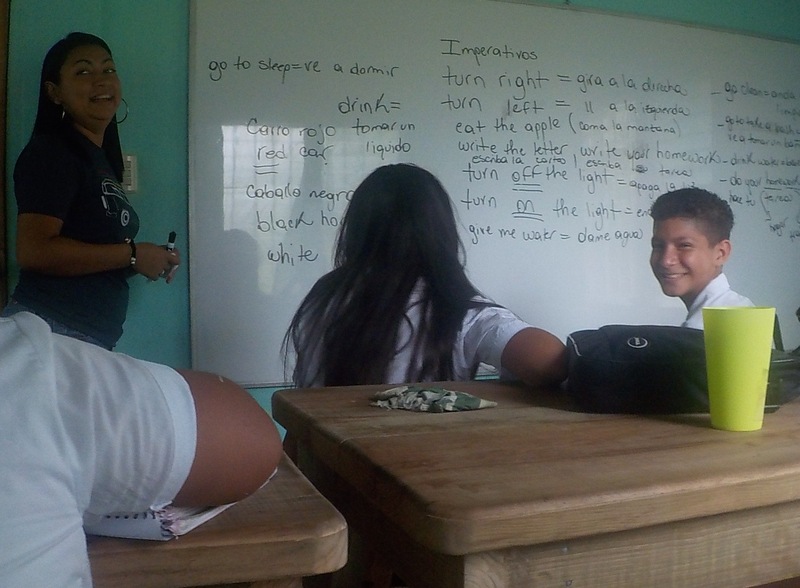 My husband Darwin teaches “Level 3” English with the most advanced students we have. 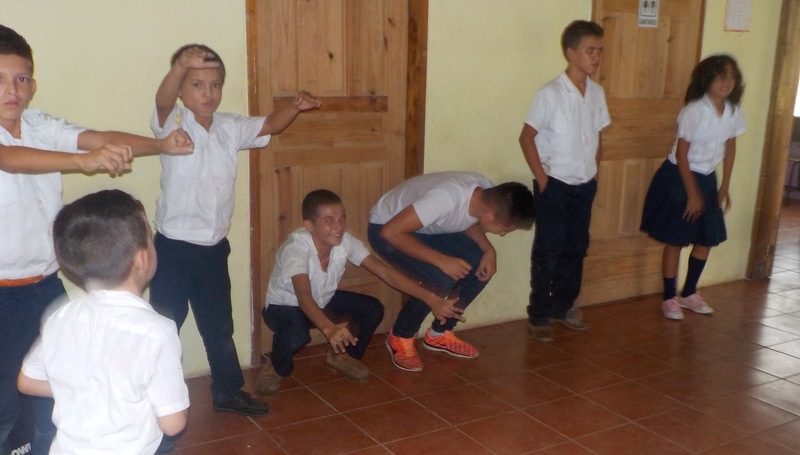 He’s been working hard with them for a year-and-a-half to introduce them into their second language. 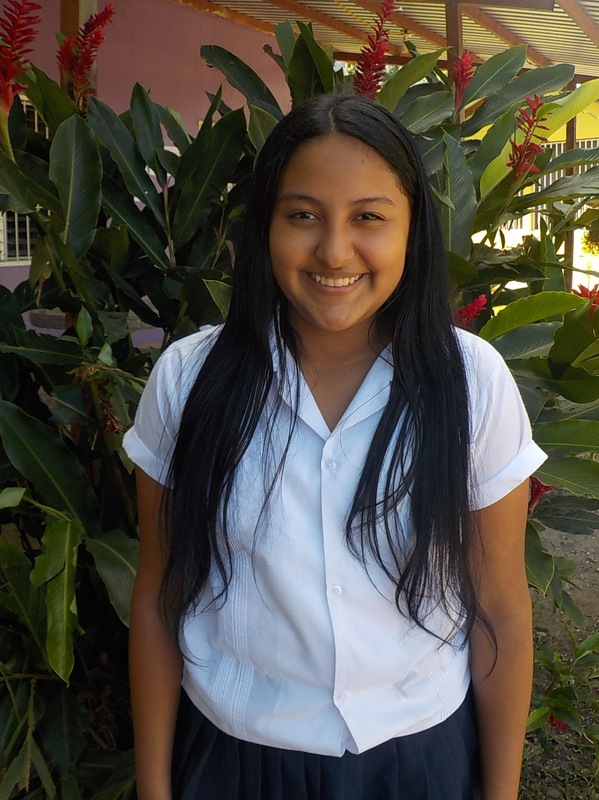 Our 16-year-old daughter Dayana is in Darwin’s English class. Sandra (fourth from the right), who used to live with us, came back to the Living Waters Ranch full-time as a student about a month ago after having spent several months down the wrong path. We are honored to continue cultivating a relationship with her for God’s glory. 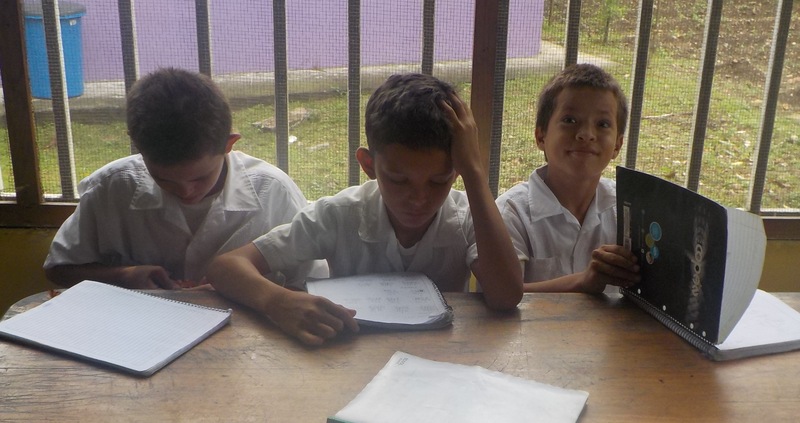 Our quirkiest (I mean, most precious) kids aren’t quite ready to learn English, so they receive extra help with basic Spanish reading and writing skills! 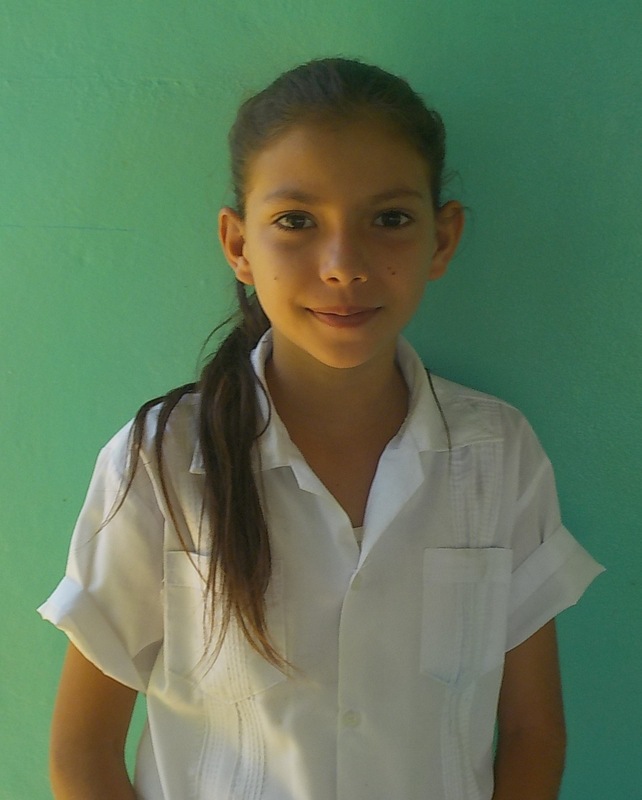 This is 10-year-old Daniela who had great struggles in the local public school system. 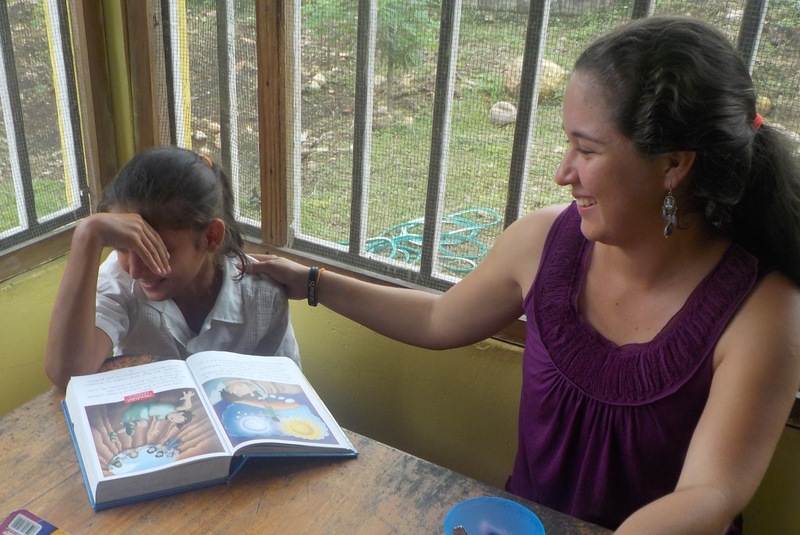 Her mom brought her to the Living Waters Ranch in January of this year as she was frustrated that her daughter had not been able to learn to read and write. 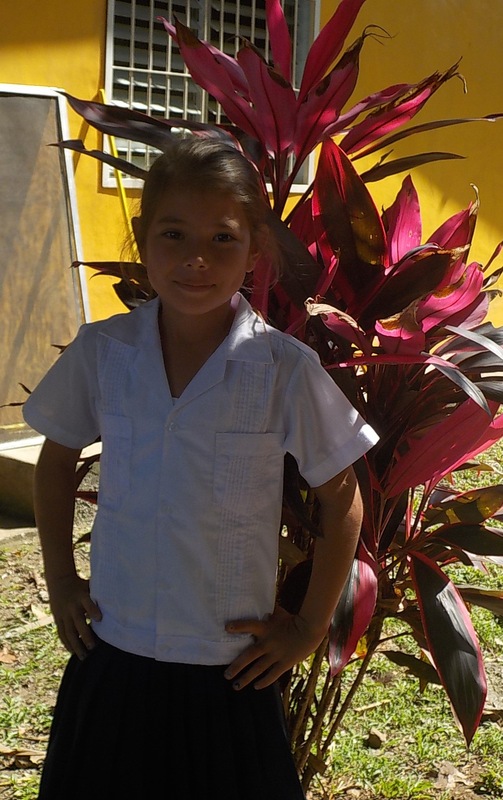 Daniela’s been with us full-time every since, and she just passed first grade in our accelerated program and is now a second-grader with great success. All she needed was a little bit of individualized attention! Here are two young teen boys who likewise didn’t enjoy success in the public school system. 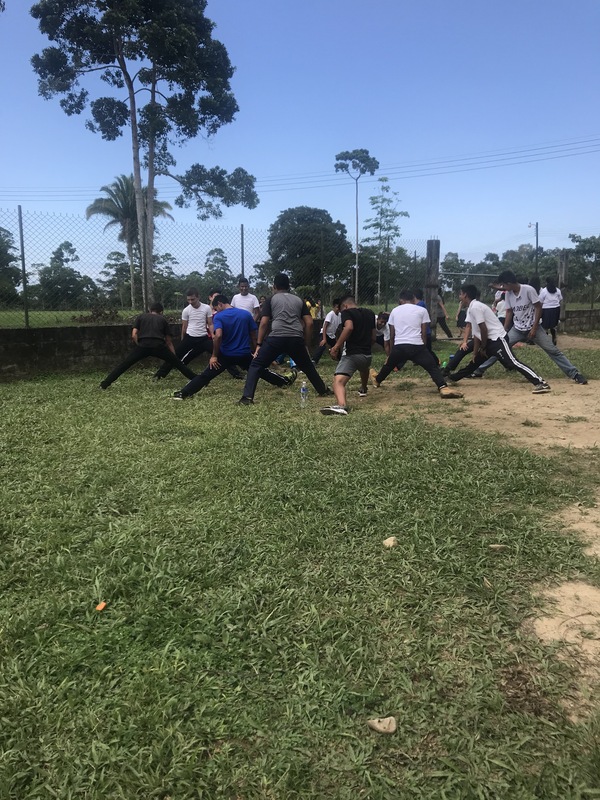 Young men such as these in our area have a propensity to fall into gangs and delinquency, so we consider it God’s will that He brought them to us to learn the way of Christ. 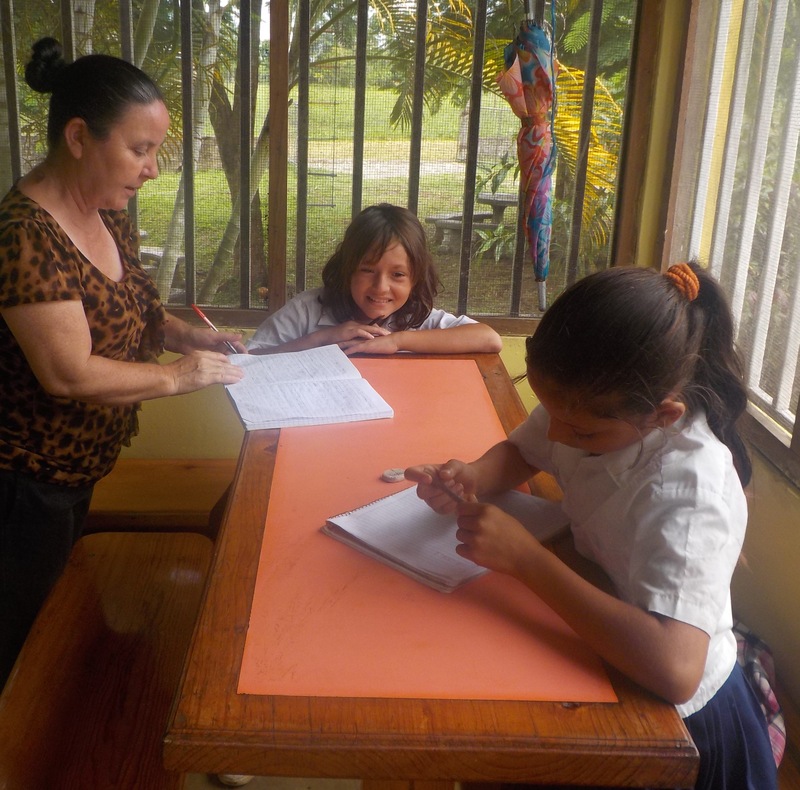 Here’s Miss Ligia in action in her English class! Our community homeschool/discipleship center is quickly becoming known and respected in our local community as a legitimate educational institution that stands for justice and truth in a country whose educational institutions oftentimes suffer from corruption, complacency and inefficacy. Several local kids and teens are joining our classes as they seek a genuine integral education, something almost unheard-of in our area. 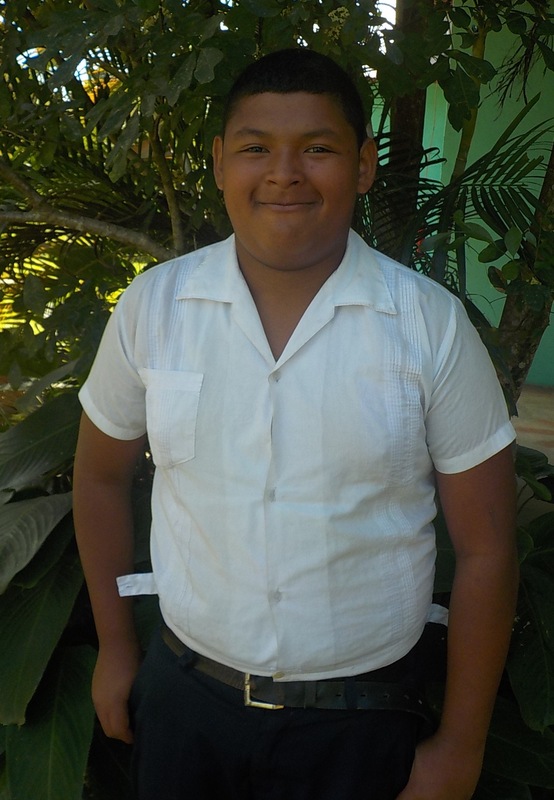 The other English teacher at the Living Waters Ranch is Erick. Man, it smelled like teenage sweat in that crowded room! 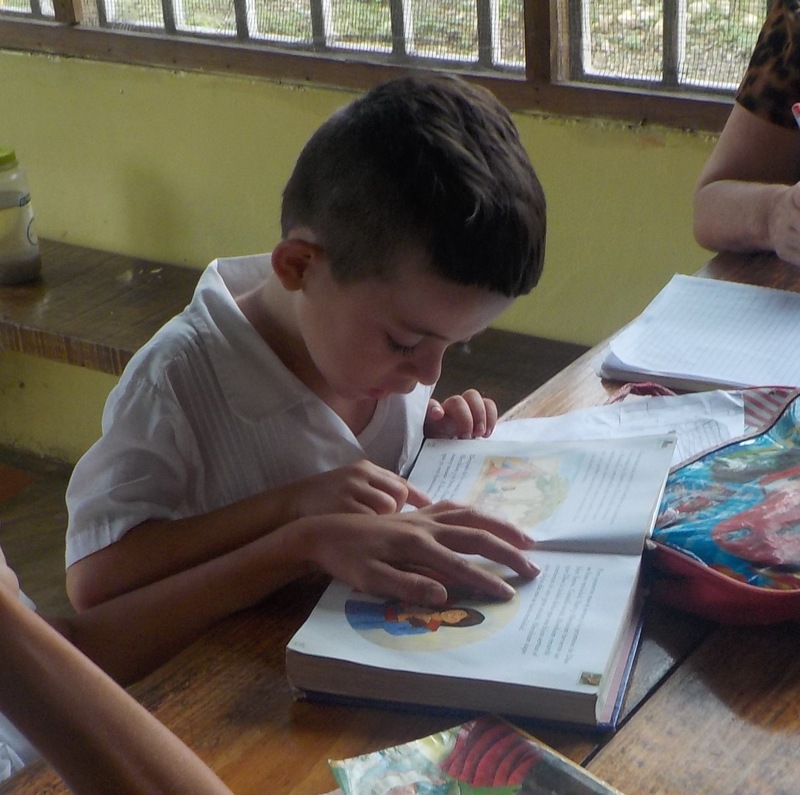 This is Alejandro, a 14-year-old local student in second grade with us, reading a children’s Bible. 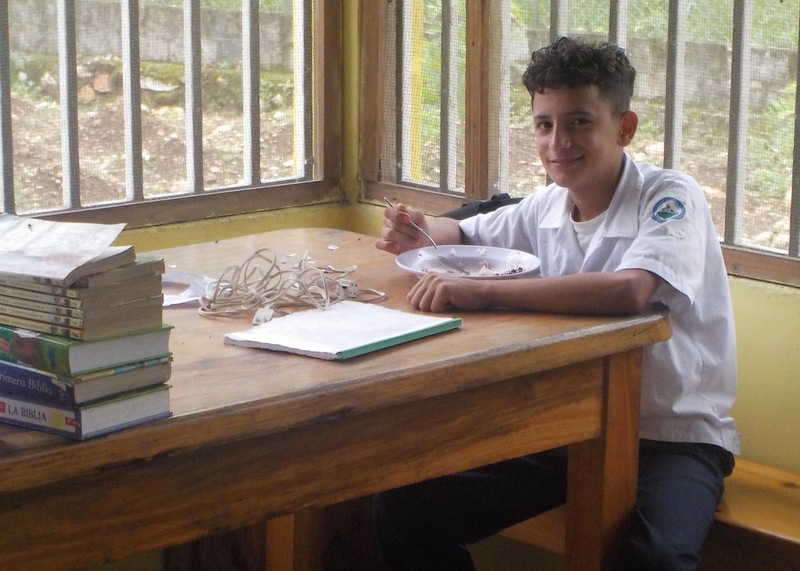 He had gotten up to 6th or 7th grade in the public school system without having learned virtually anything, so now he’s receiving intensive tutoring to help get him up to speed as we seek to cultivate his life integrally for God’s glory. 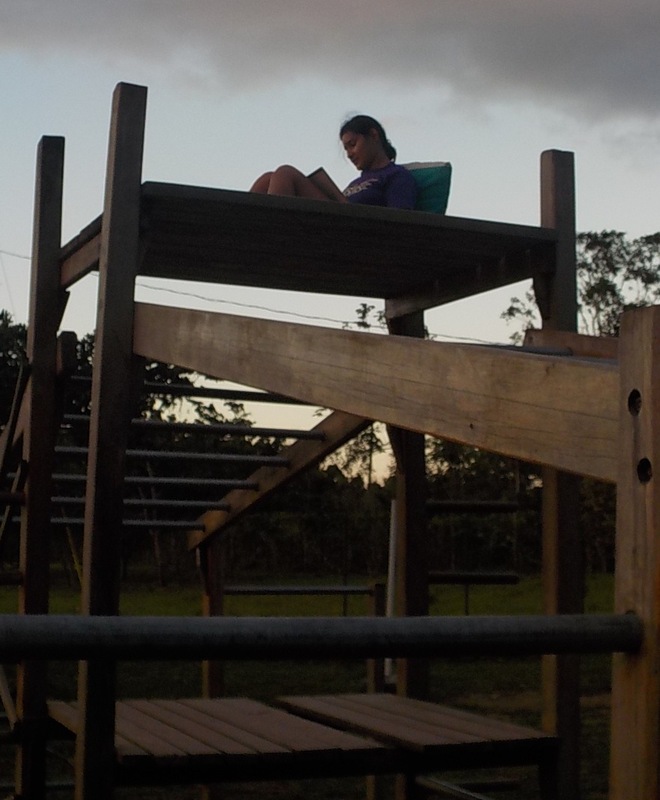 Daniela was reading the Bible with Miss Isis, but she got nervous when I started taking pictures! 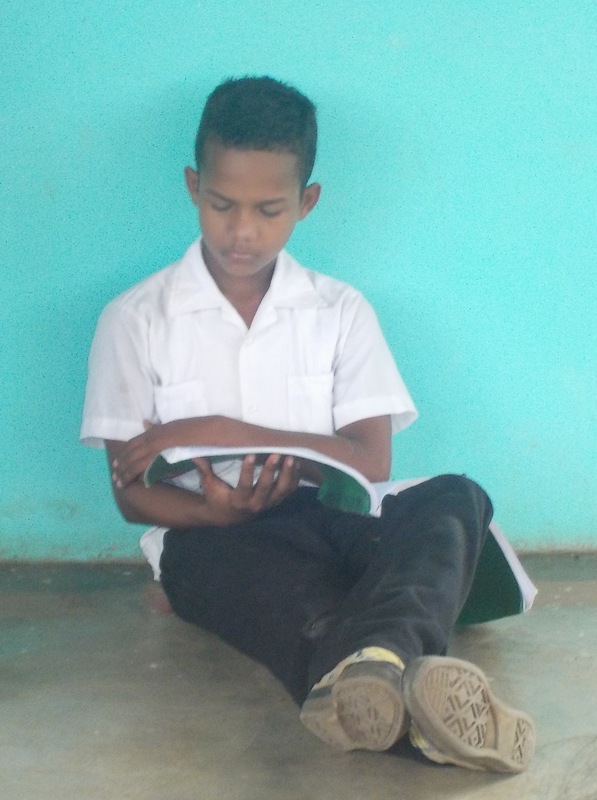 This is little Ever, the youngest son of our night watchman, reading a children’s Bible. 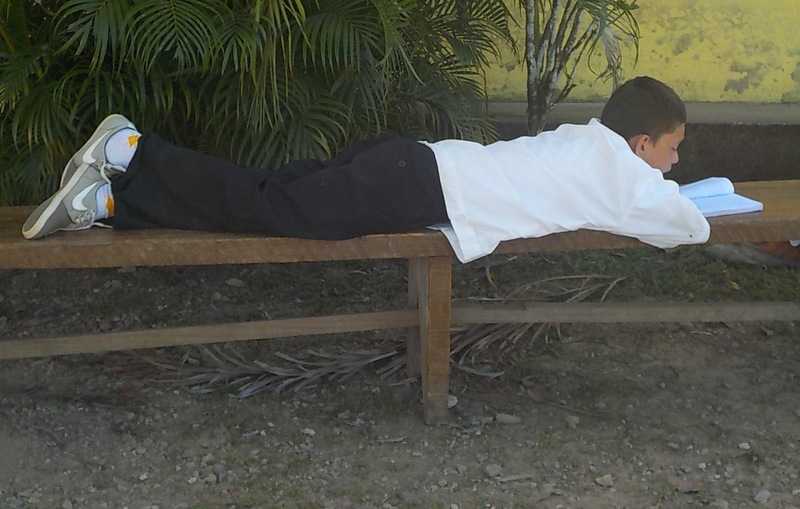 He is our youngest student at 7 years old. Time to change classes again! Everybody go to your reading class according to your skill level! 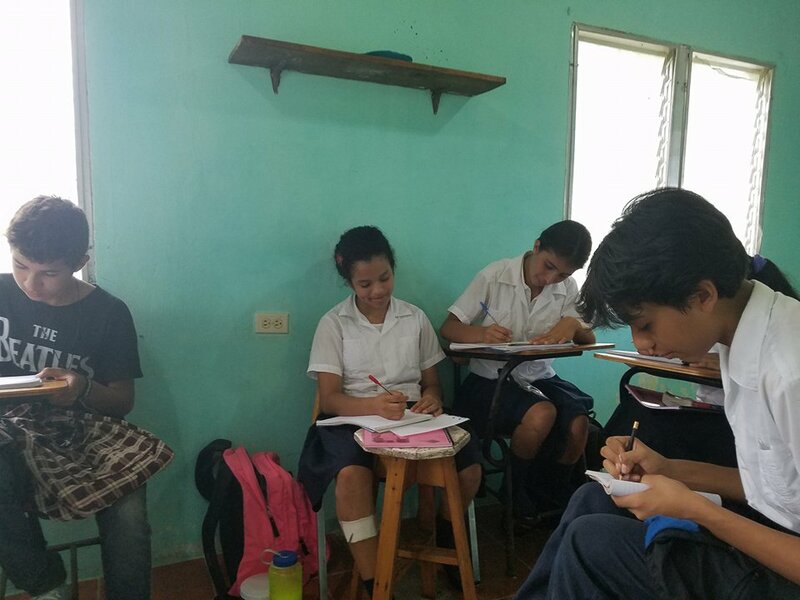 All students are divided up into four distinct levels, and this is our most advanced reading class — Miss Ligia’s crew of high schoolers who are currently reading one of Ted Dekker’s novels with strong spiritual foundations. What a breath of fresh air (literally)! 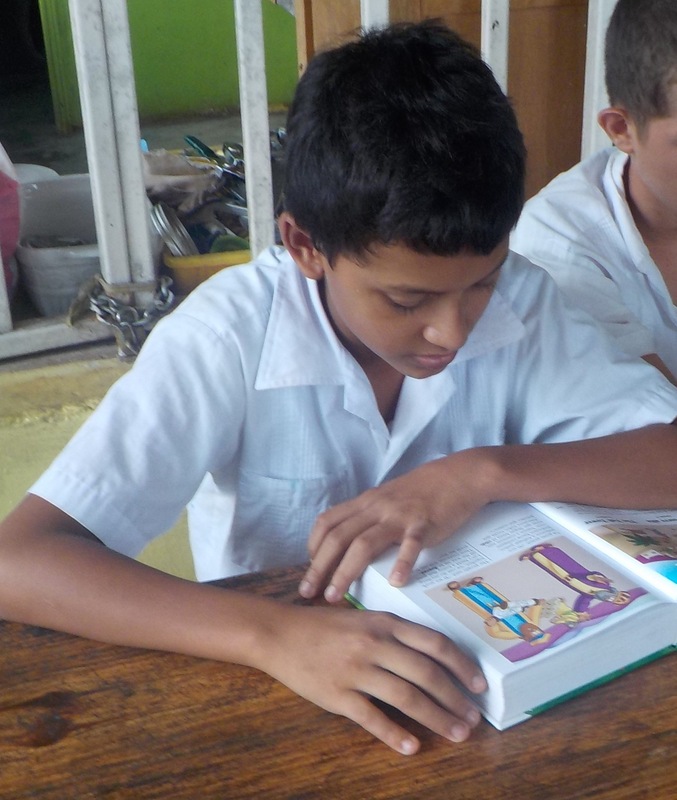 Reading is not a commonly cultivated practice among most Hondurans, so the fact that our teenagers are learning to read a 300+ paged novel is no small feat. They already finished another novel earlier this year and frequently study the Bible along with whatever God-honoring novel they are reading. 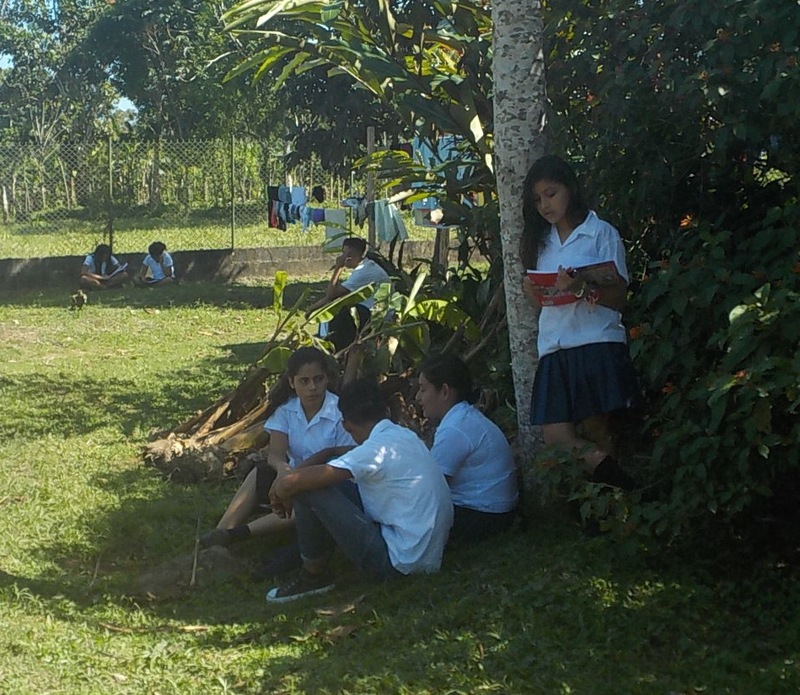 Many of our students who were previously averse to reading are now enthusiastically asking for more books! Next I visited Darwin’s Level 3 reading class, one of the largest classes (there were about five other students in the classroom at the far right that wouldn’t fit in the photo!). 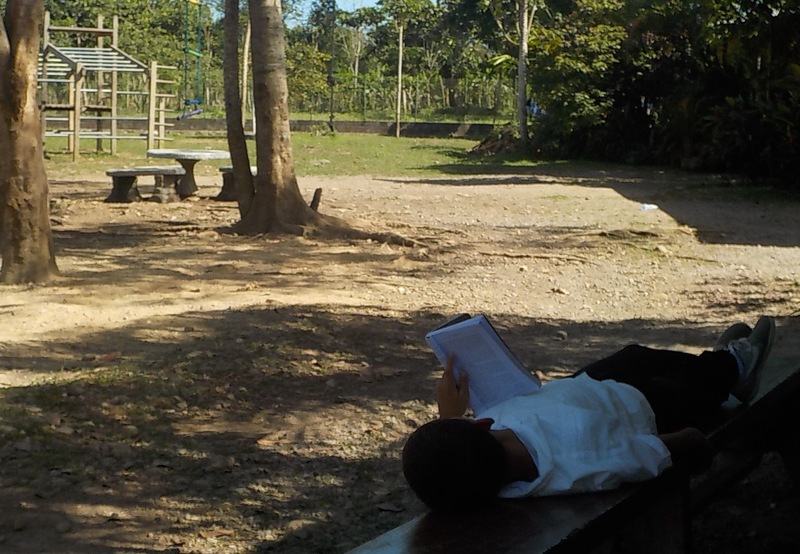 Darwin has taken on the gargantuan task of teaching to read, annunciate correctly and develop an honorable work ethic to those youth who are not among our most successful students. 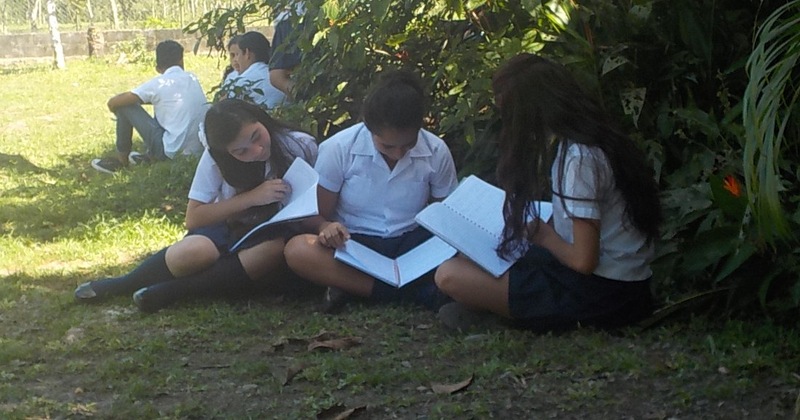 The fact that they all have their pencil in hand and are sitting down is a huge triumph in this culture! 10 points for Darwin! 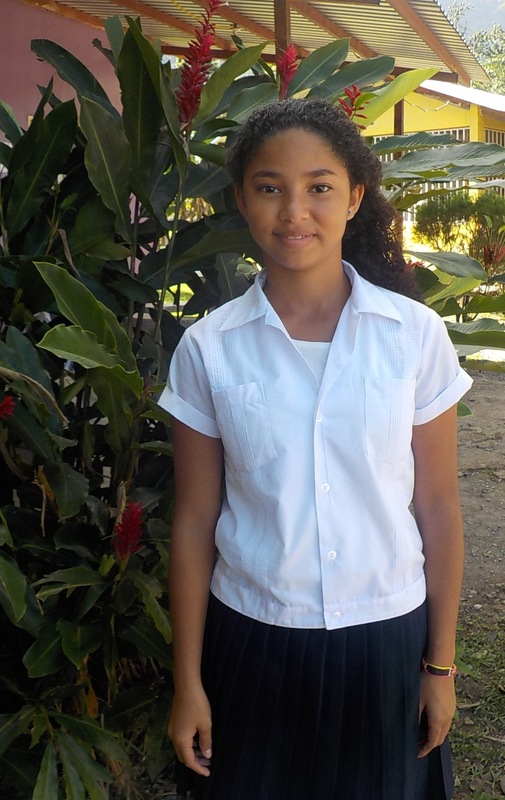 This is 13-year-old Liliana, one of the new students who joined us recently. We had met her a few years ago through Darwin’s youth choir, but then she moved away and had been out of school for several years. 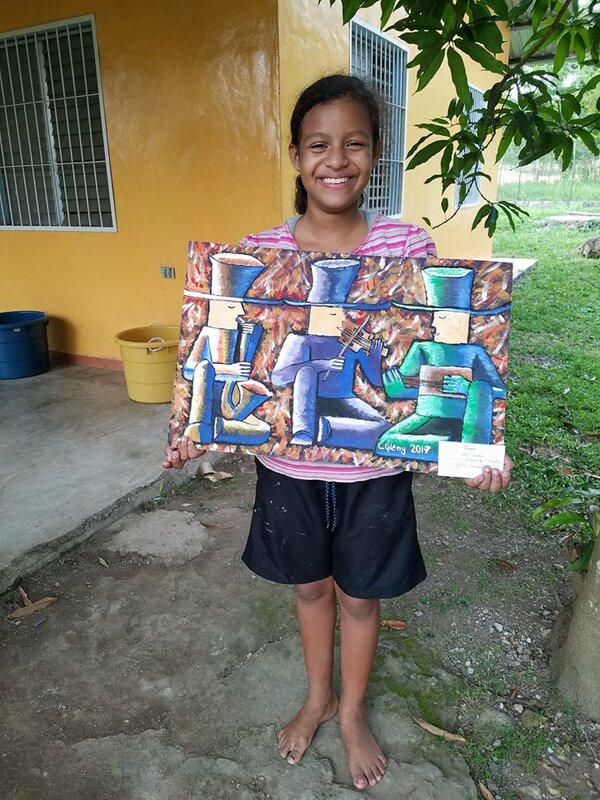 She just entered with us on the 5th-grade level, and she’s quickly finding her niche and always has a big grin on her face. 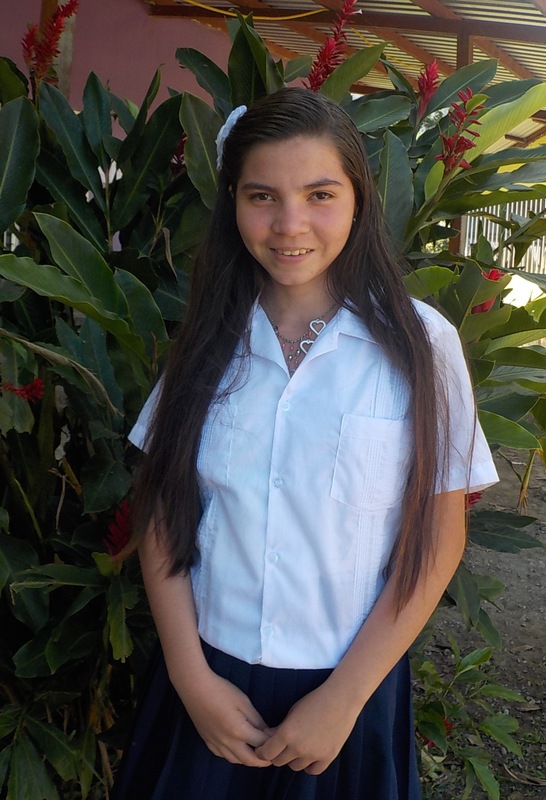 Many young women in our area who are not in school get ‘married’ to older men in their early teens, so we are excited and honored to have Liliana with us as we expose her daily to the truth of Christ and how to live a life of purity in God’s sight. Sandra got nervous when I caught her in the kitchen with her mom and started taking pictures! We’ve had a long history with her and her mom, and we are very thankful that she’s decided to return to the Living Waters Ranch as a student and continue seeking God’s will for her life. 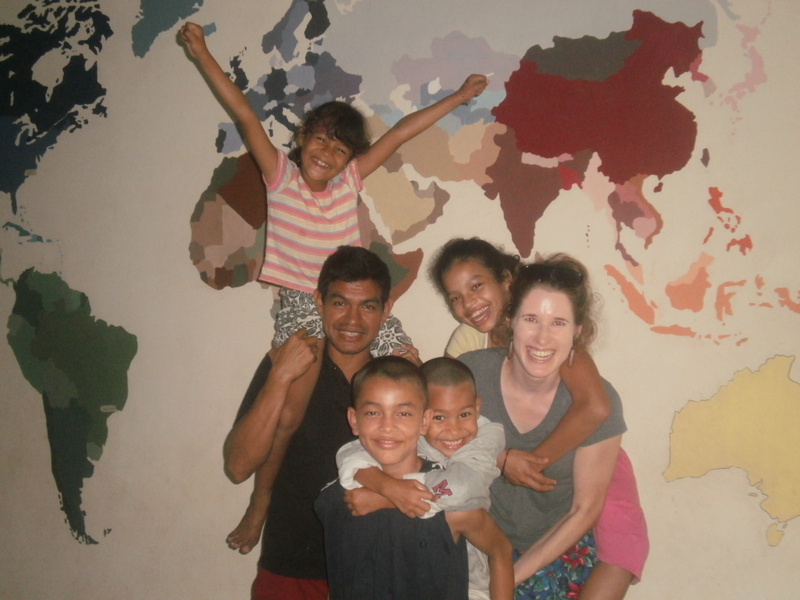 Sandra’s mom continues to serve alongside of us part-time, and we enjoy a very blessed relationship with her. Lunch time! 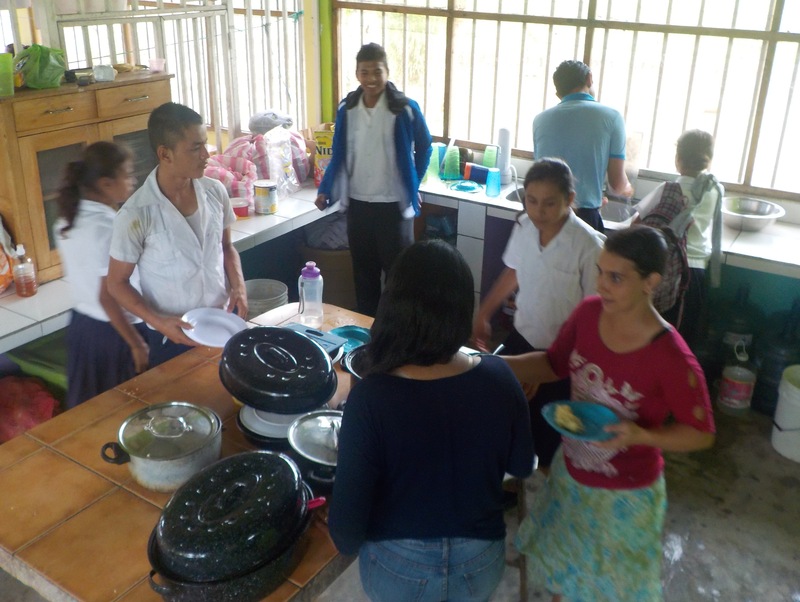 Roughly 50 hungry people came streaming into our kitchen for their lunch of rice, beans and potatoes. 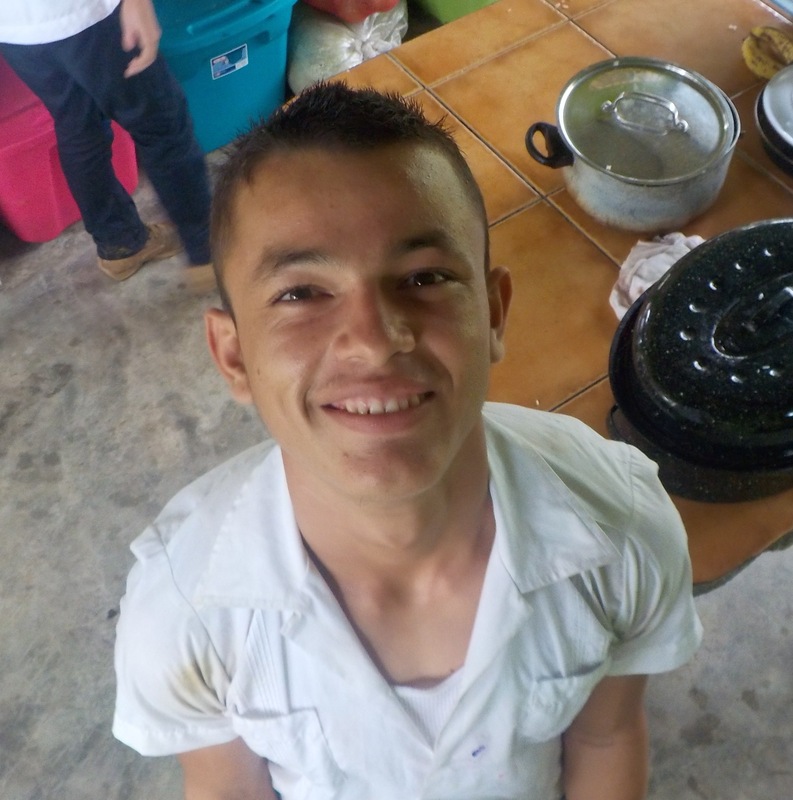 I stood on a wooden stool to take the following shots…This is Brayan, our 16-year-old son who was one of our first four students in our experimental homeschool program that we started in 2014 as we struck out from the beaten path to develop a discipleship-based educational alternative geared at restoring broken youth for God’s glory. 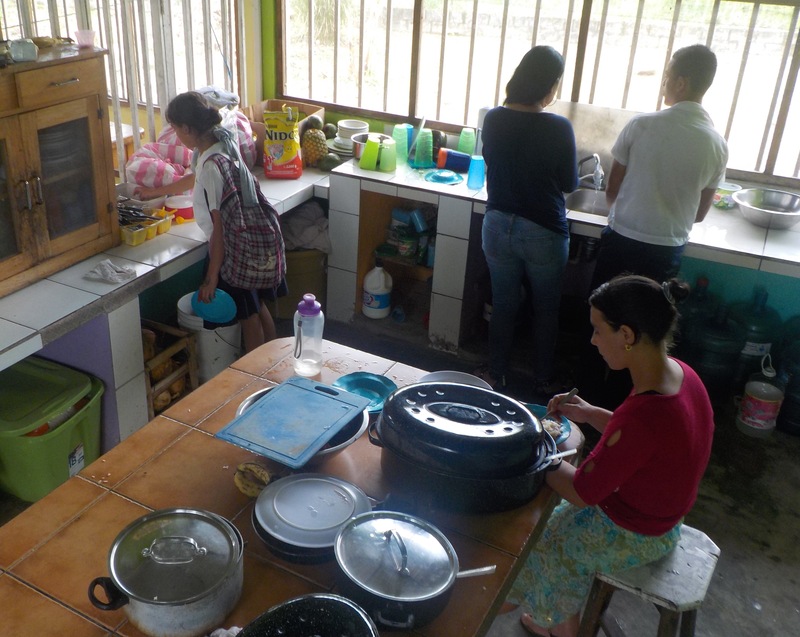 All of our 40 students eat lunch in our home every weekday, and everyone is responsible for washing their own dishes when they finish! 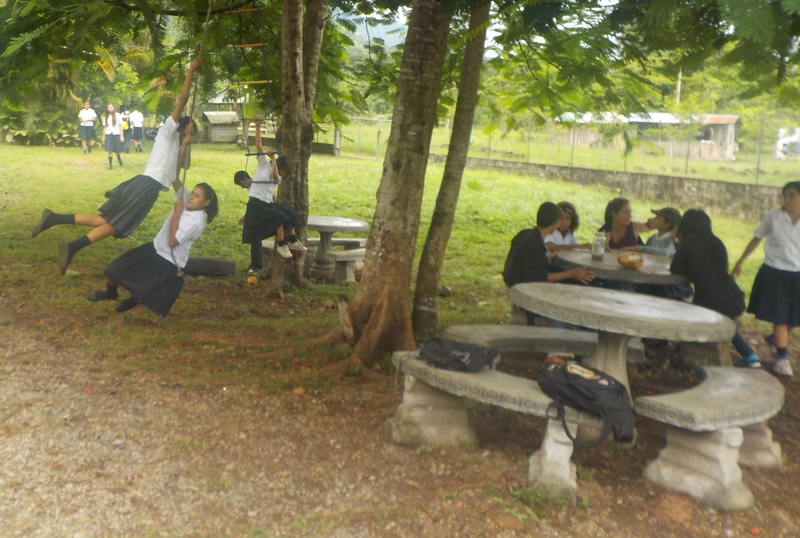 Lunchtime sure is fun…for some people! My next stop was detention, an hour-long daily event for the students who for various reasons need a little extra help in the discipline department. 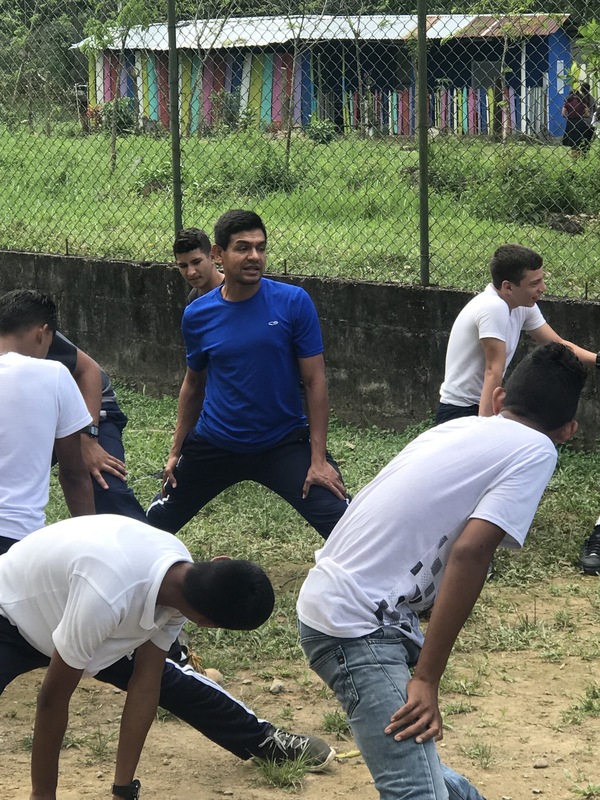 We take very seriously our duty to discipline and train up the youth under our care according to God’s Word, and we believe it is vitally important to their development into useful, grateful human beings. Detention is never empty! After visiting those precious kids in detention, I returned to the kitchen to take more photos! Here’s Darwin enjoying his lunch with our daughter Jackeline and Miss Ligia. 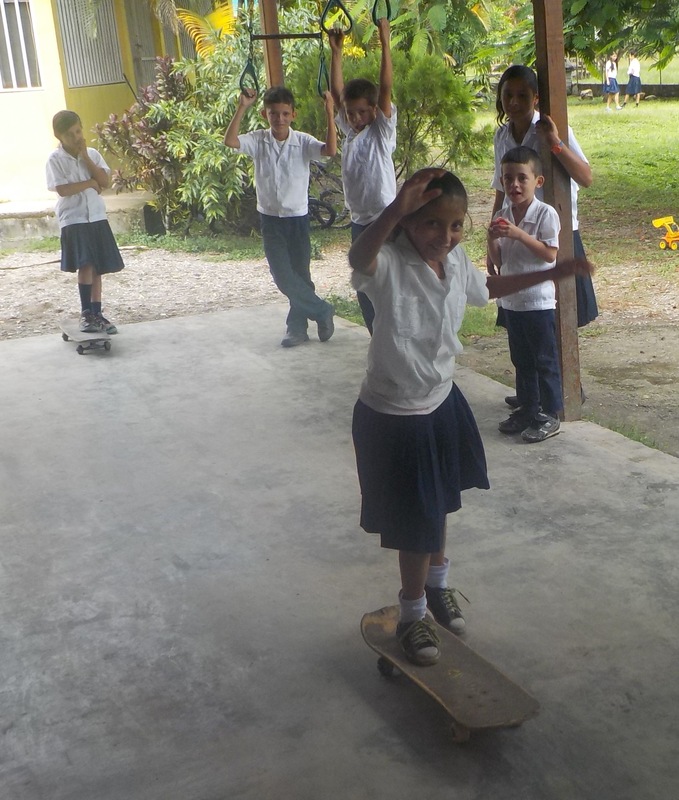 Another skateboard competition on the porch of our high school building! 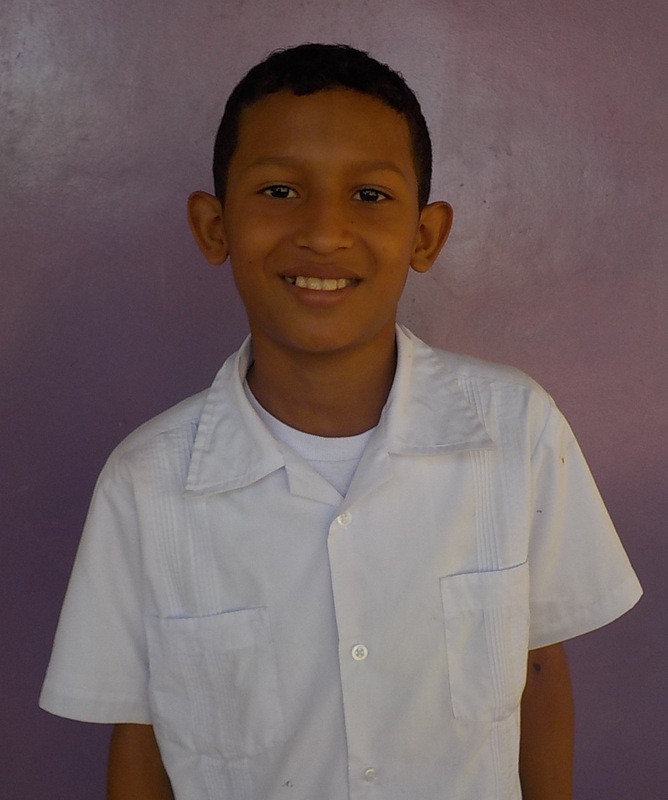 This is Marlon, another new student who entered the Living Waters Ranch discipleship-based community homeschool in these past couple weeks. 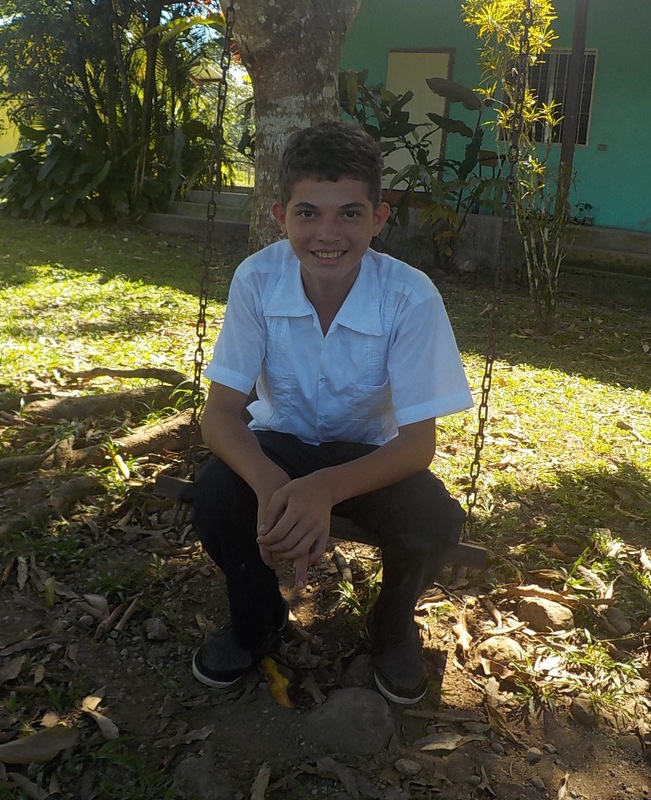 He is a young man from our neighborhood who began spending time with Erick and attending our Bible studies before he decided to withdraw completely from the public school where he was studying and dive into a completely different environment at the Living Waters Ranch. He mentioned to us that at his other school the teacher spent the majority of the day playing on her cellphone, and many students didn’t even show up for class. 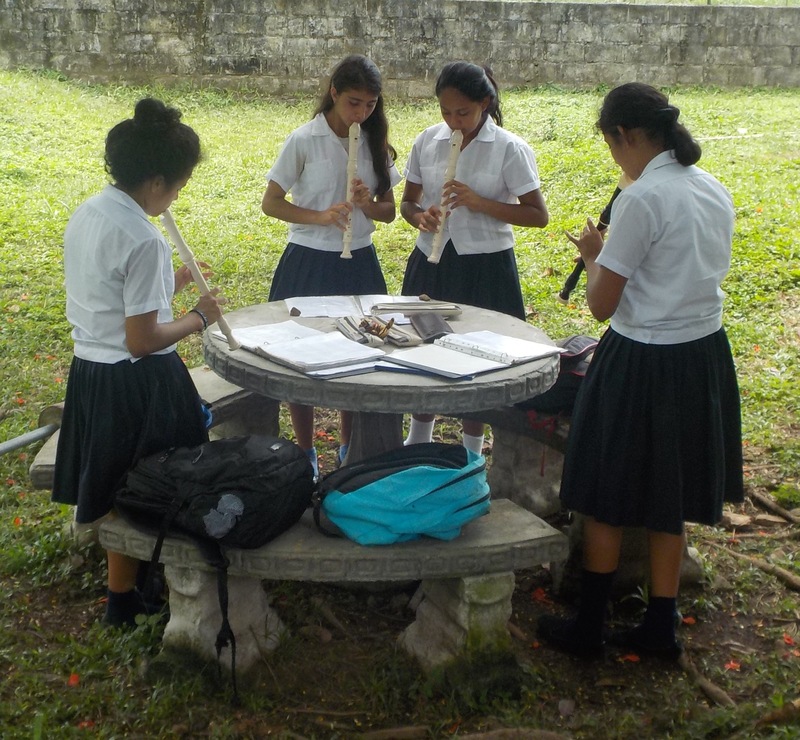 Another fun lunchtime activity on Fridays is Darwin’s outdoor recorder class. 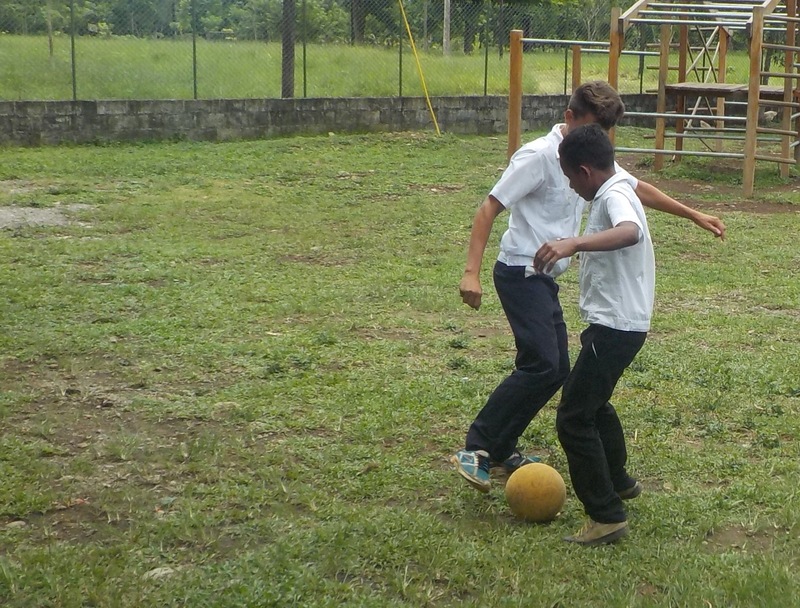 The boys always love playing soccer! 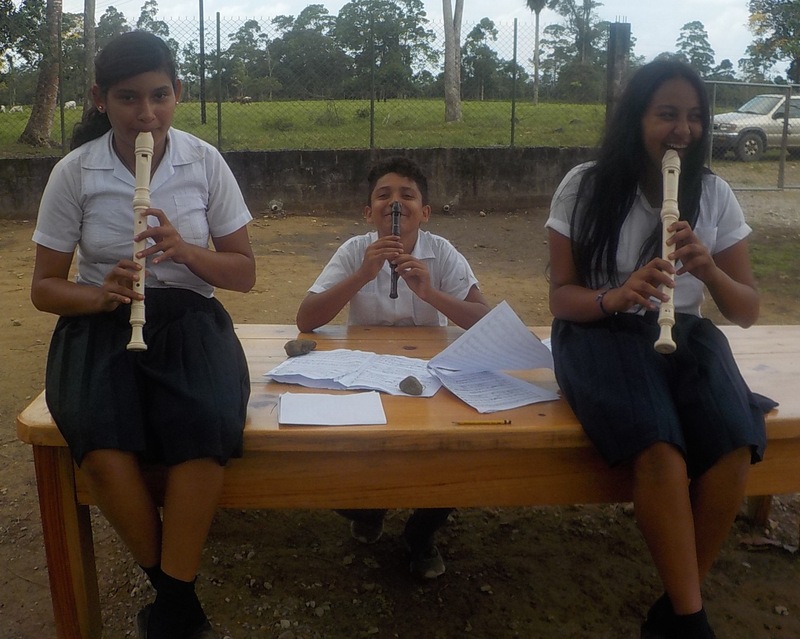 We’ve designed our daily schedule to have an extended lunchtime so that the kids can develop healthy friendships, play together, practice their instruments, etc. Good news: if you didn’t get sent to detention all week, a prize awaits you on Friday! 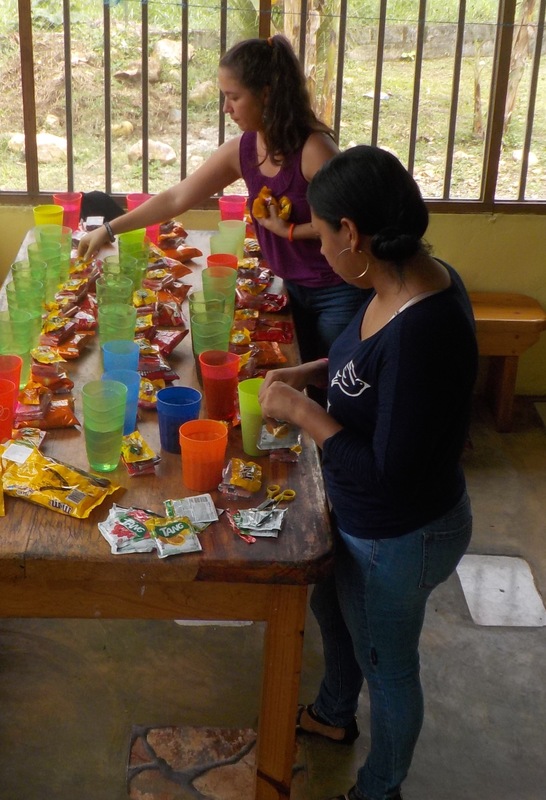 Miss Isis and Miss Ligia are getting the Friday snack ready for those students who were responsible and wise during the week. We love this weekly practice because it further inculcates in our students an understanding of the reality that they reap what they sow. 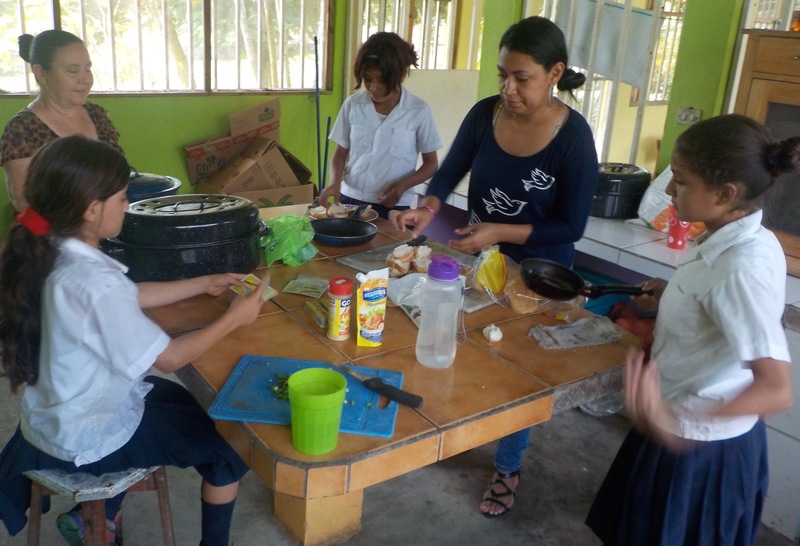 This is Miss Ligia and Miss Reina’s after-school cooking class! 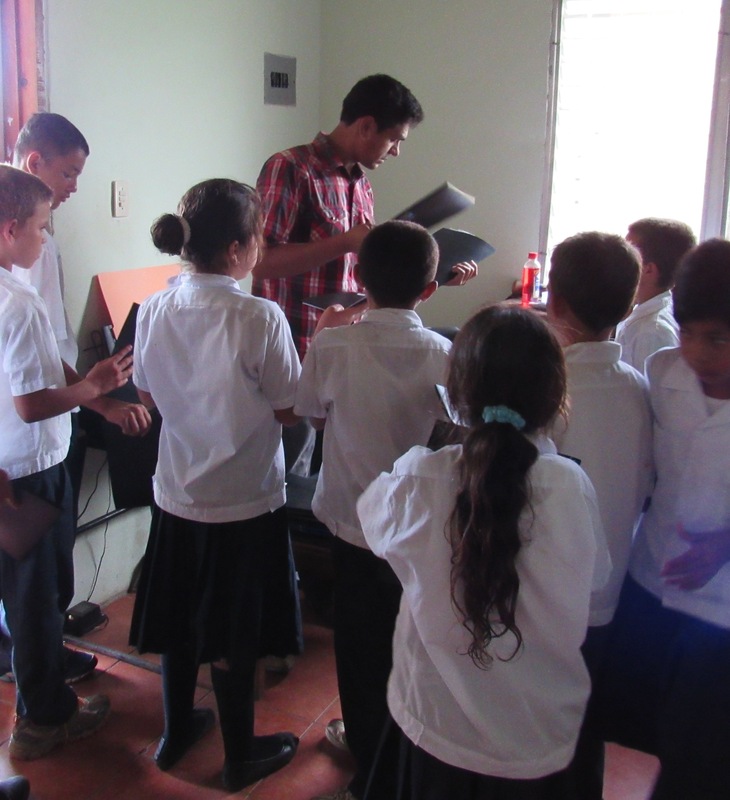 During this time the older boys are in “Men of Honor” with Erick, and the rest of the girls are in Darwin’s girls’ choir.